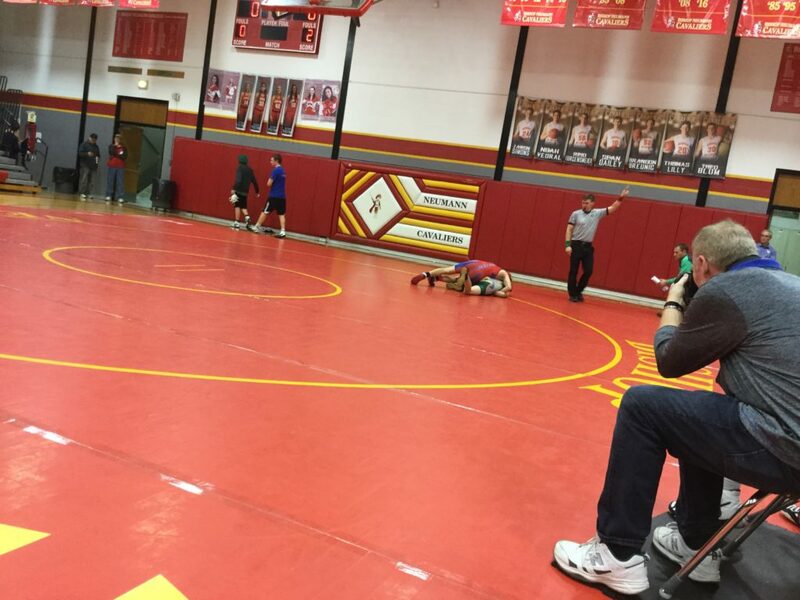 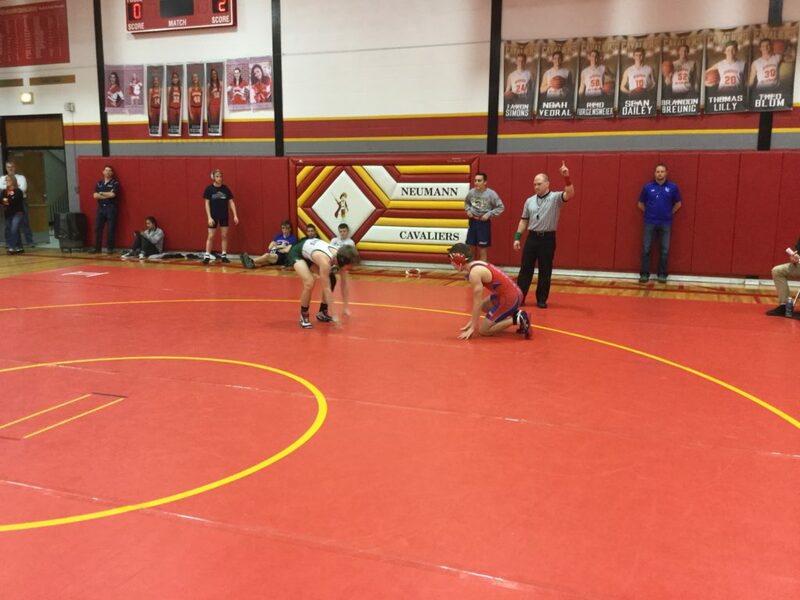 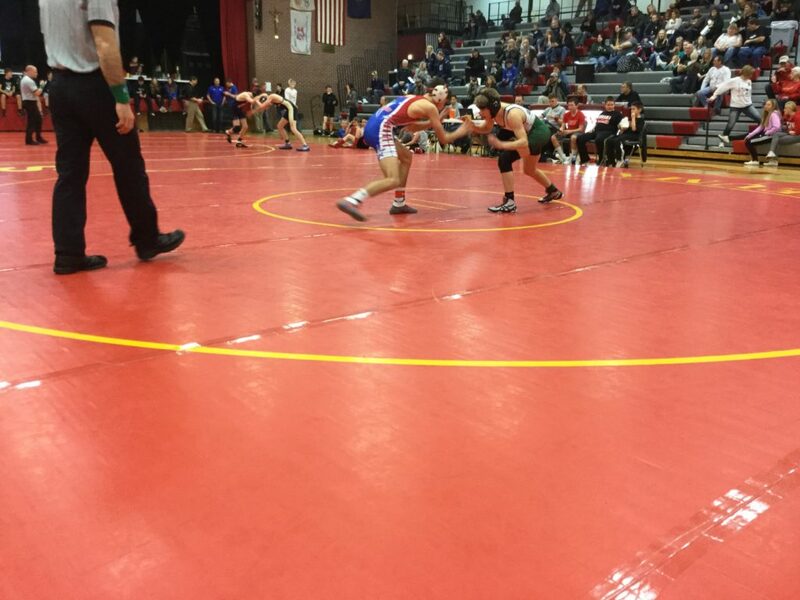 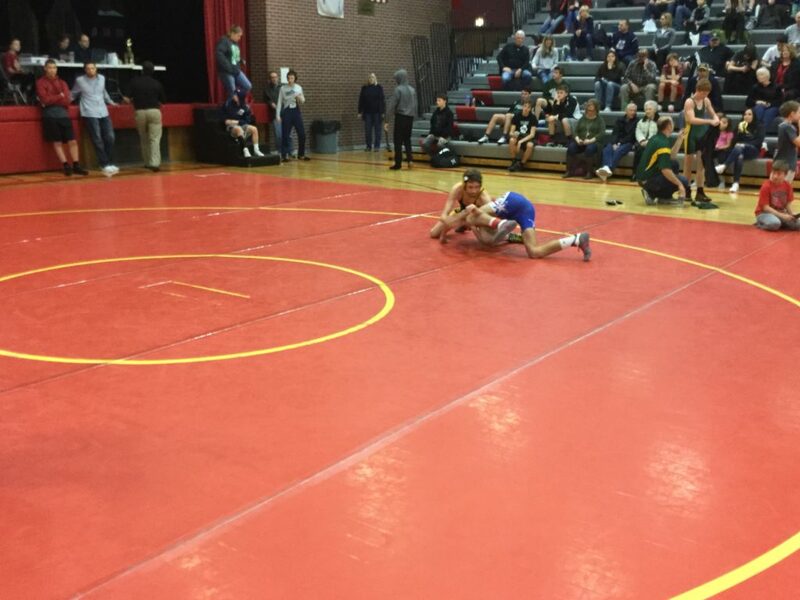 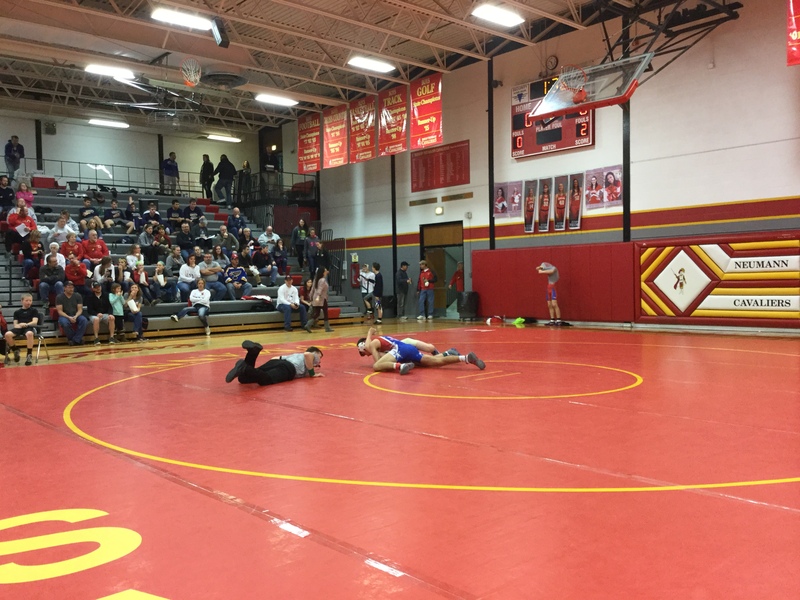 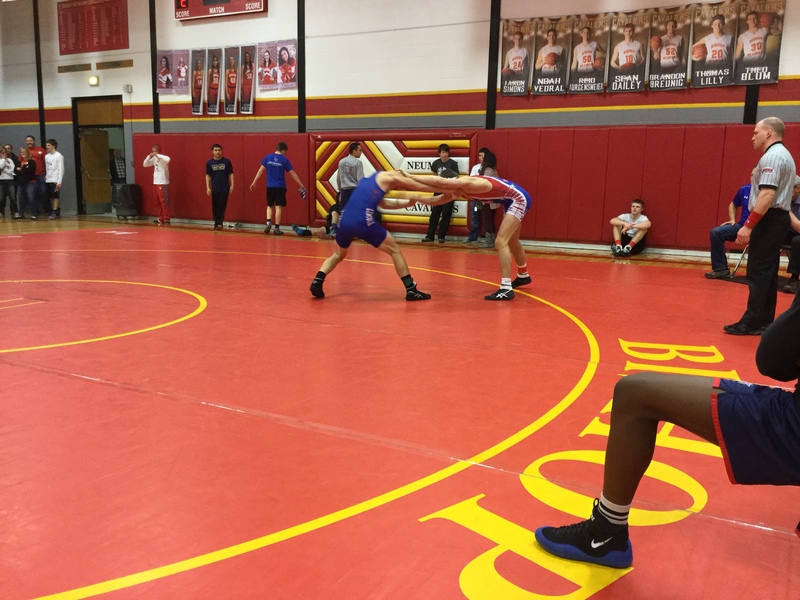 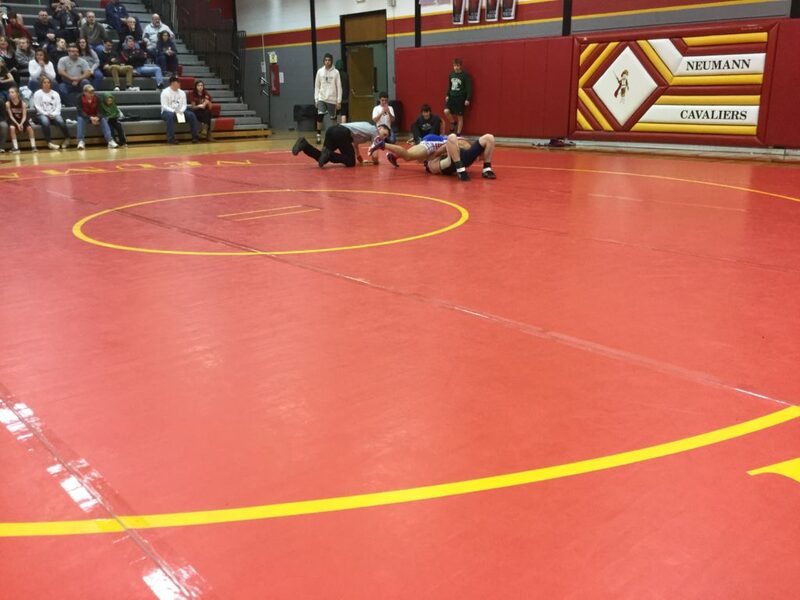 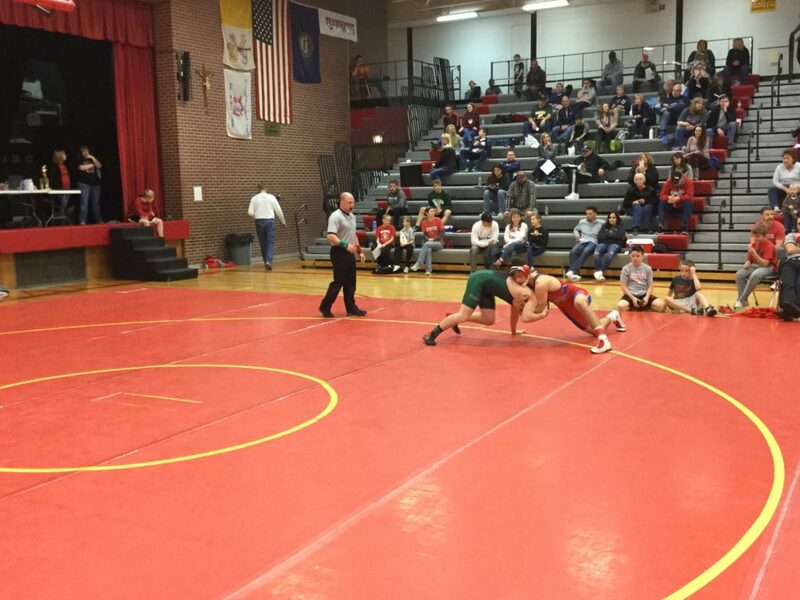 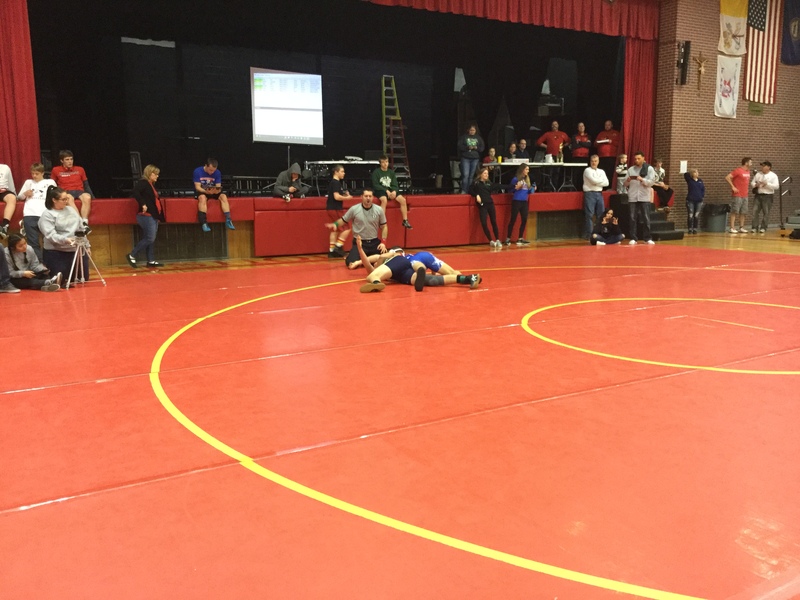 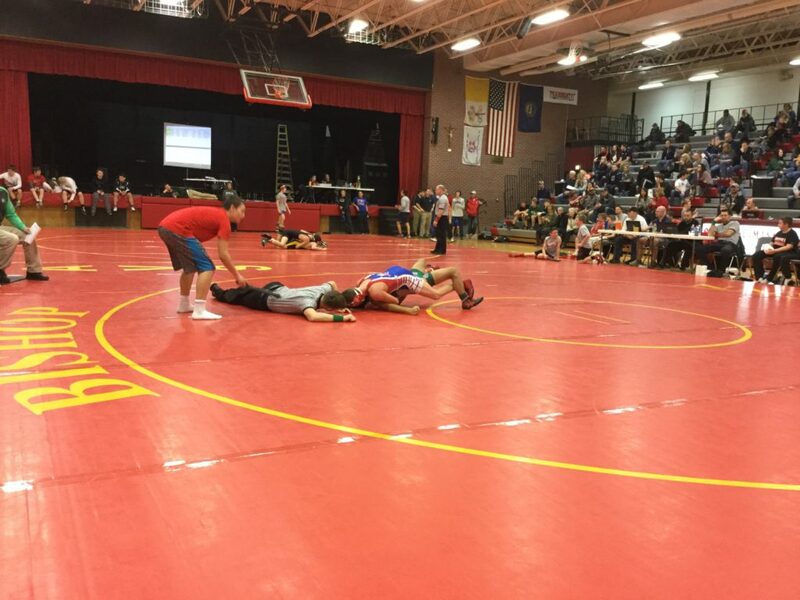 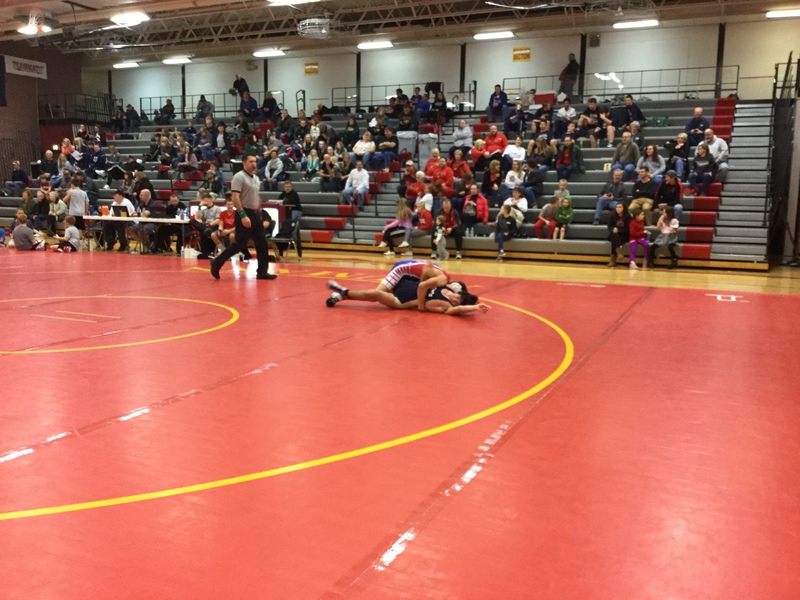 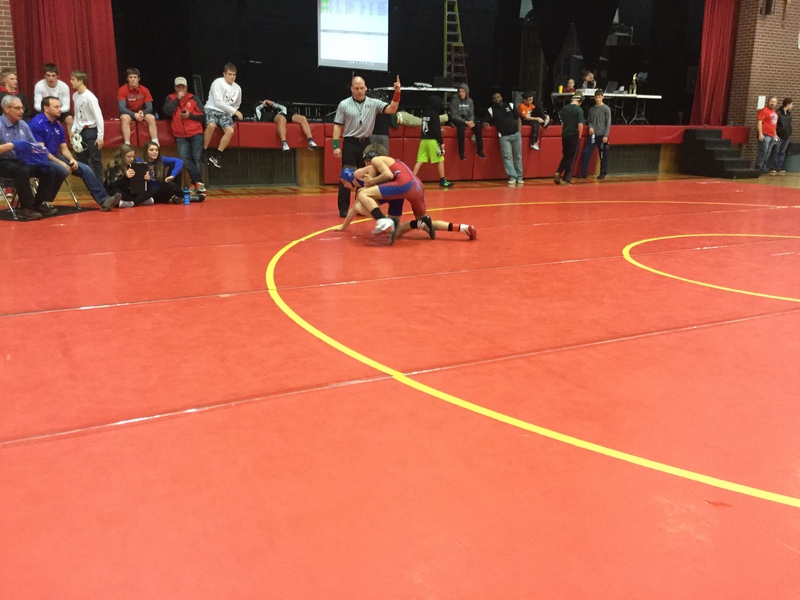 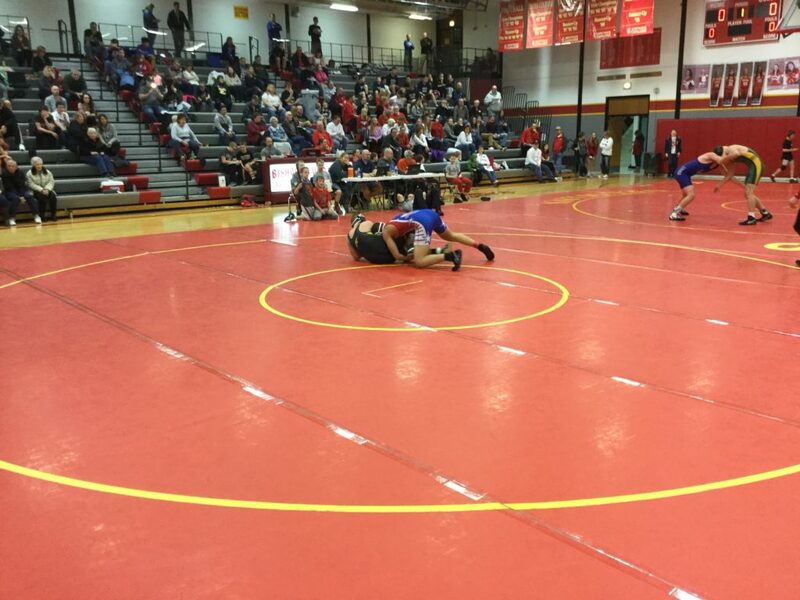 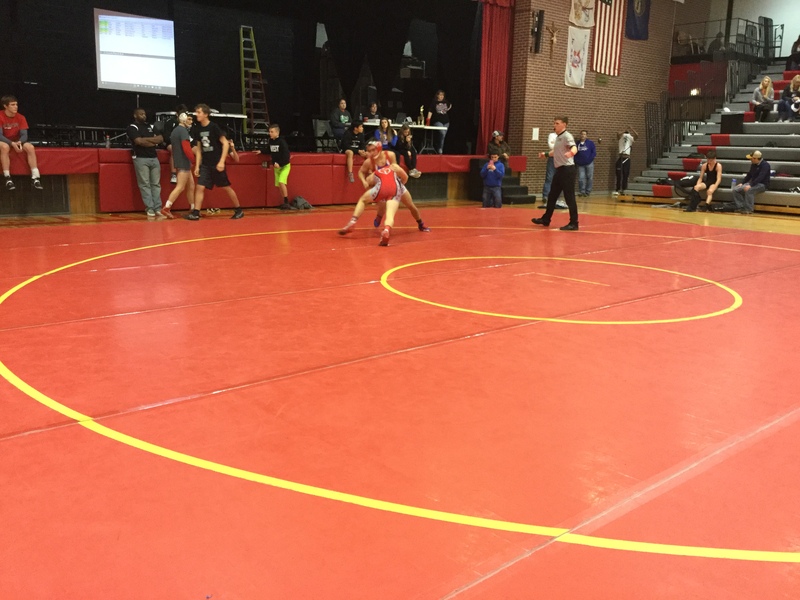 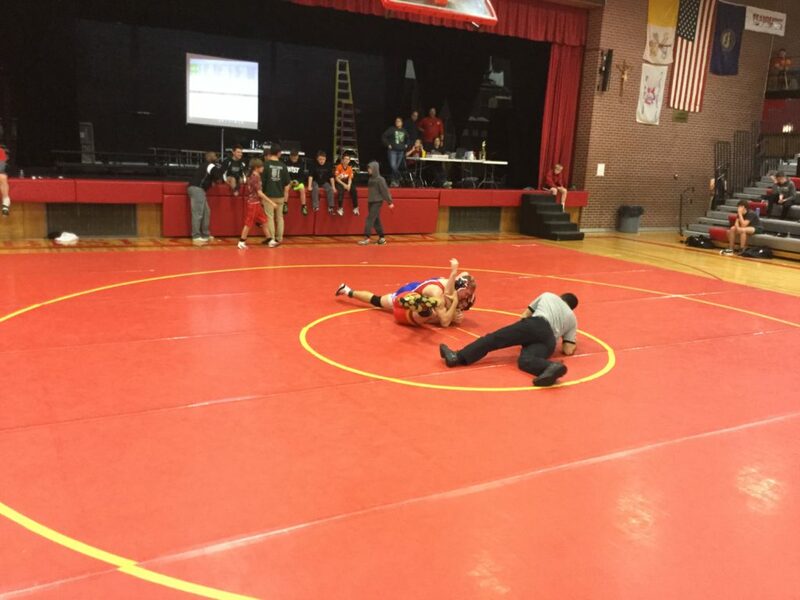 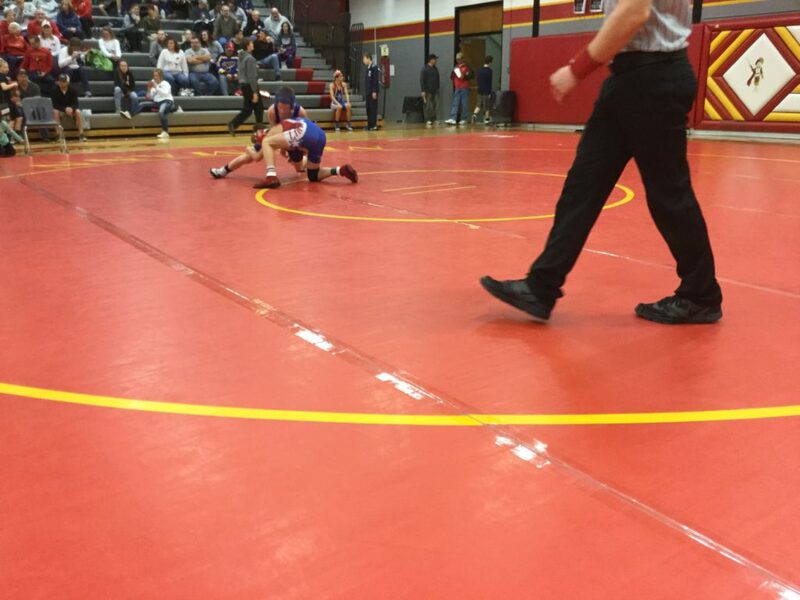 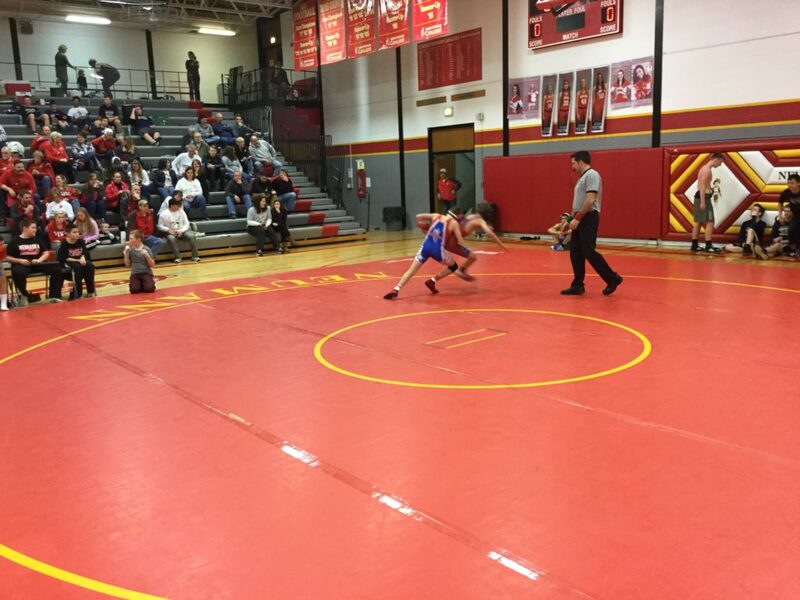 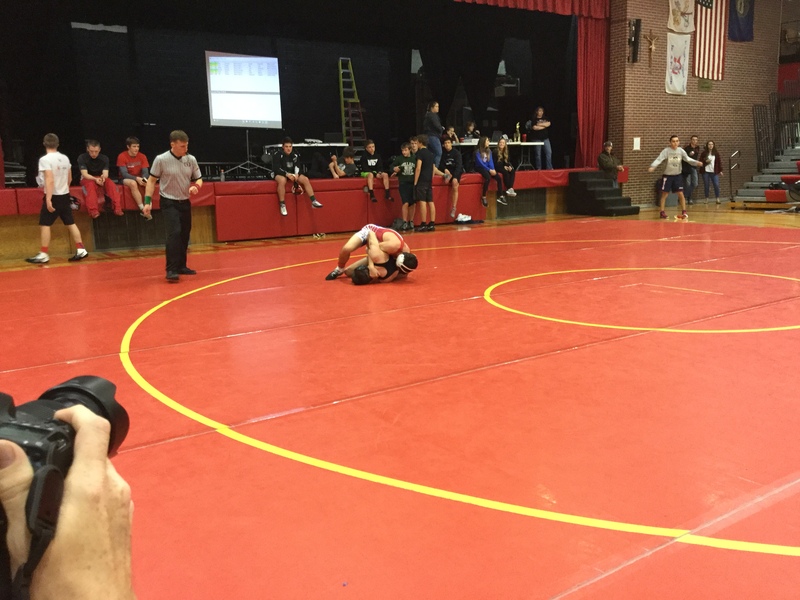 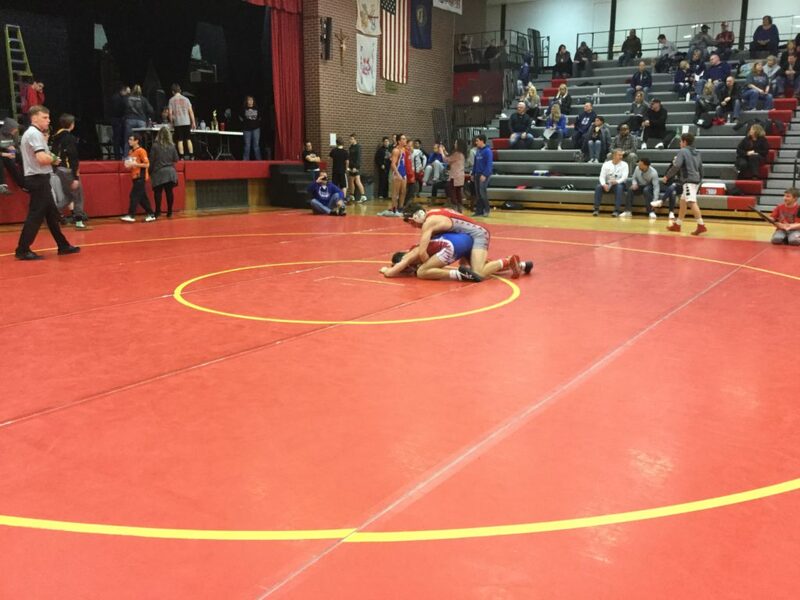 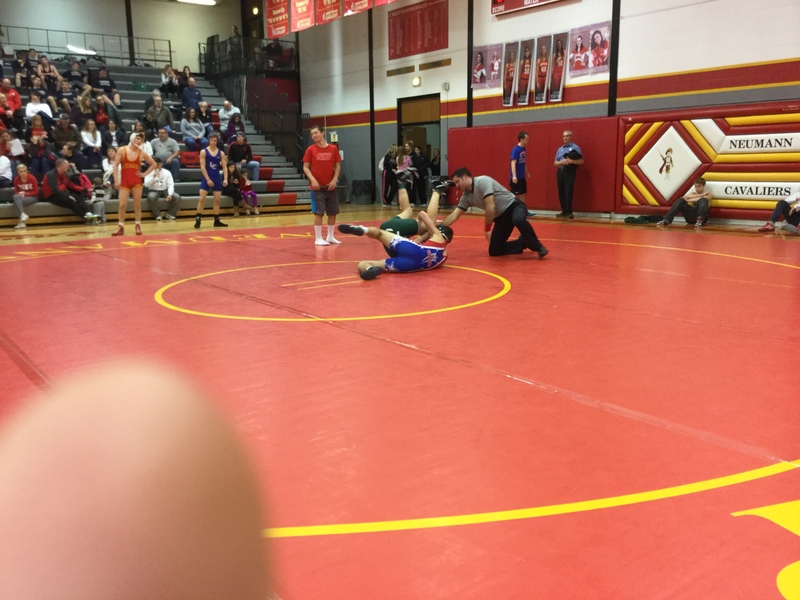 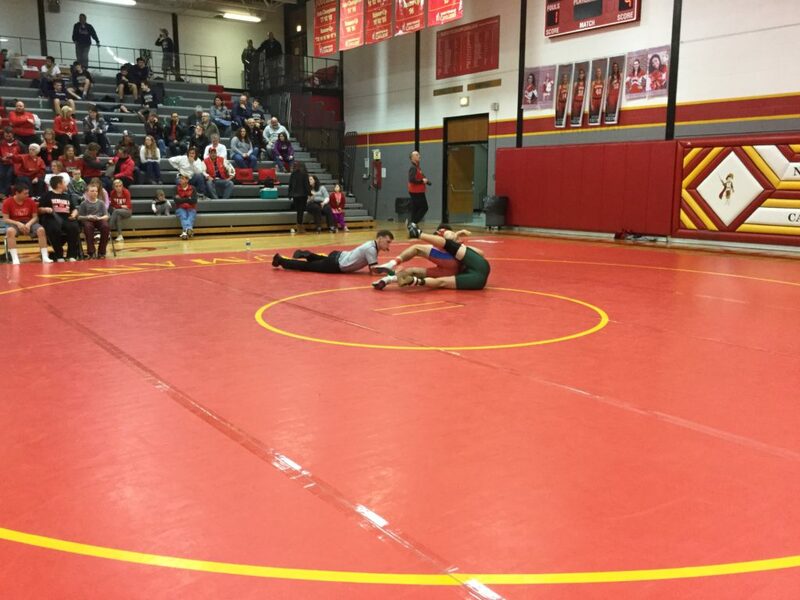 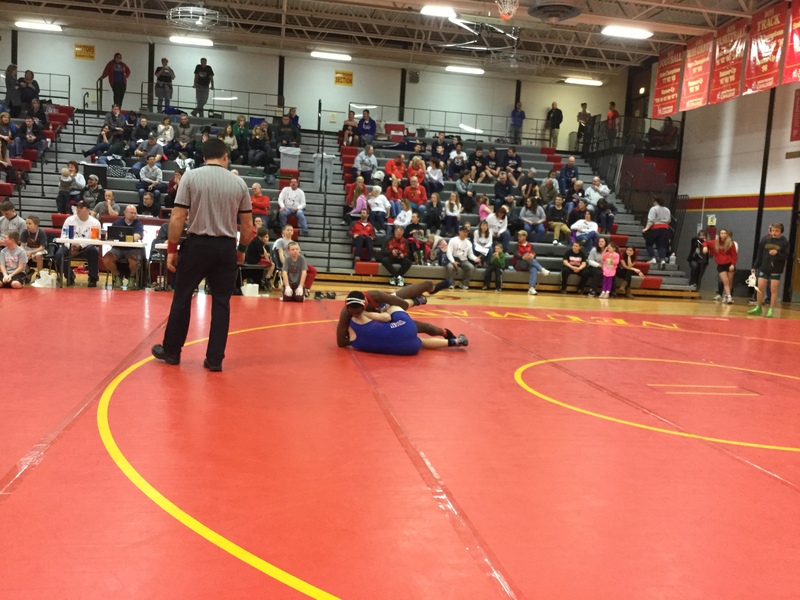 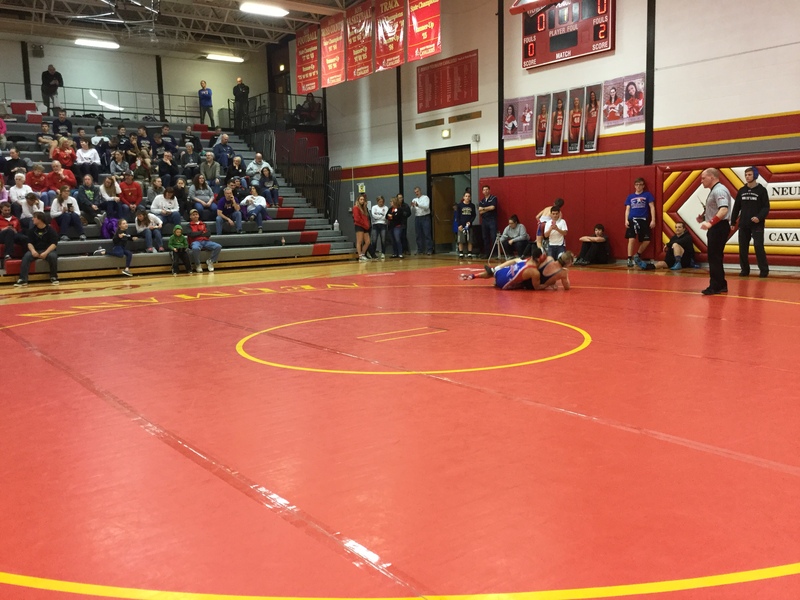 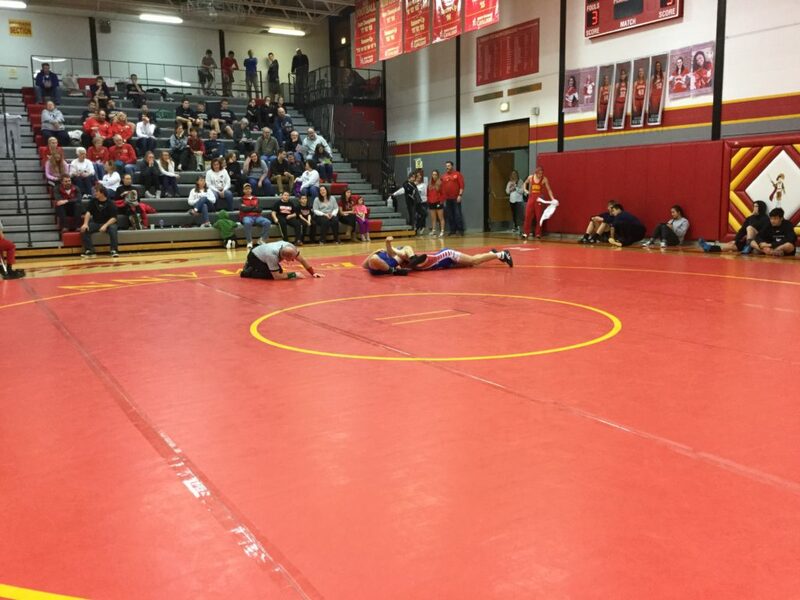 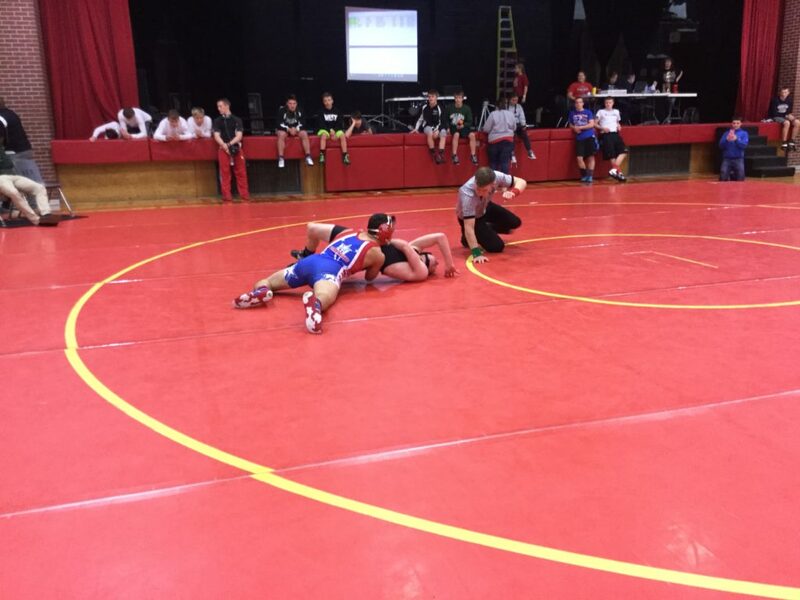 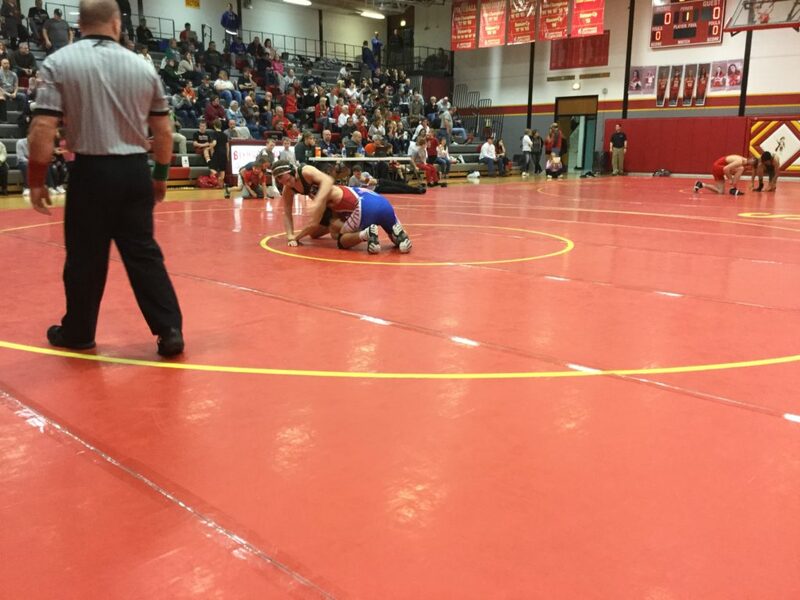 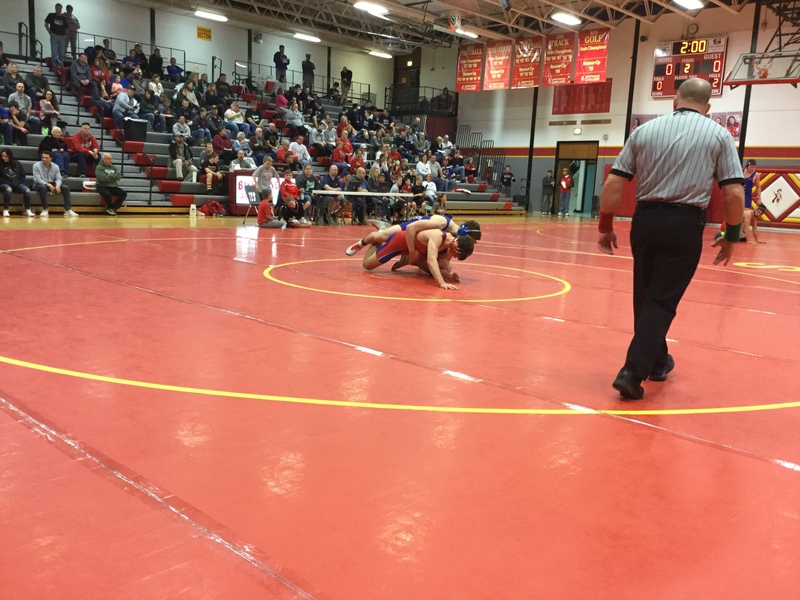 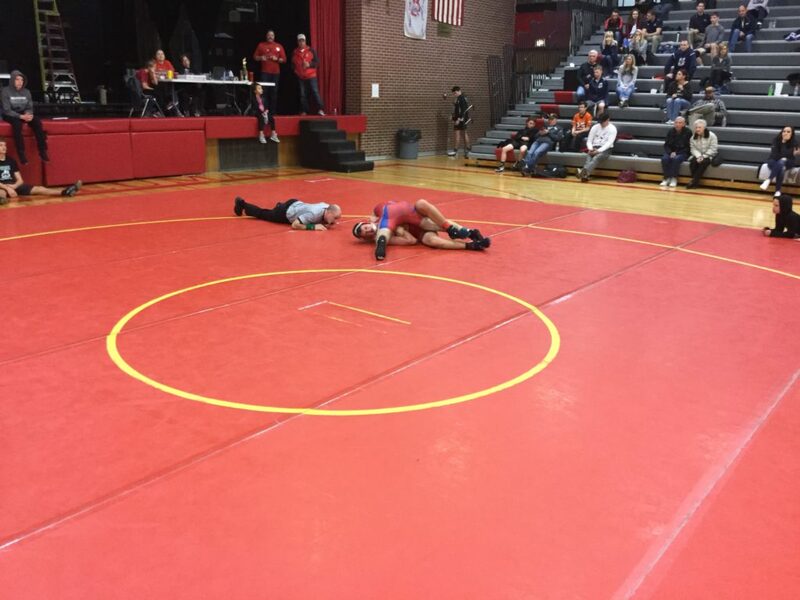 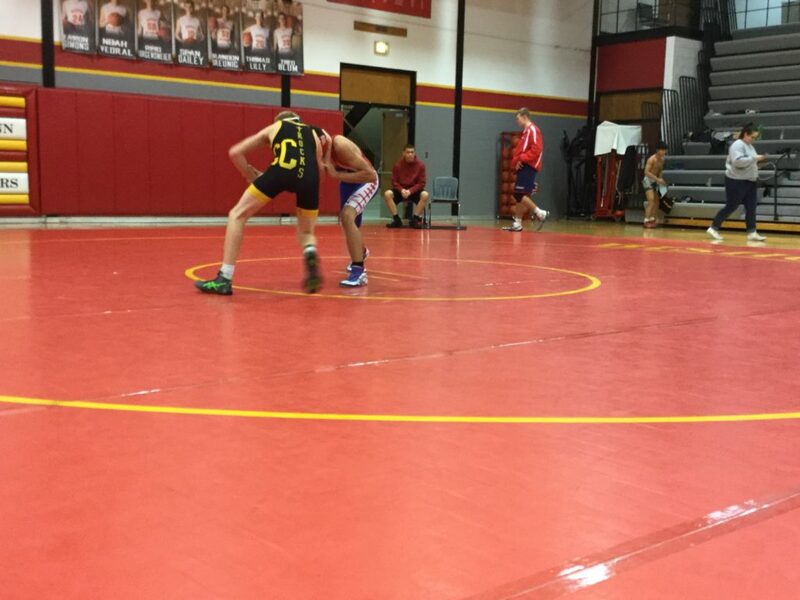 On Saturday, January 28th, 2017, the JV wrestling team attended the Wahoo Bishop Neumann Varsity tournament. 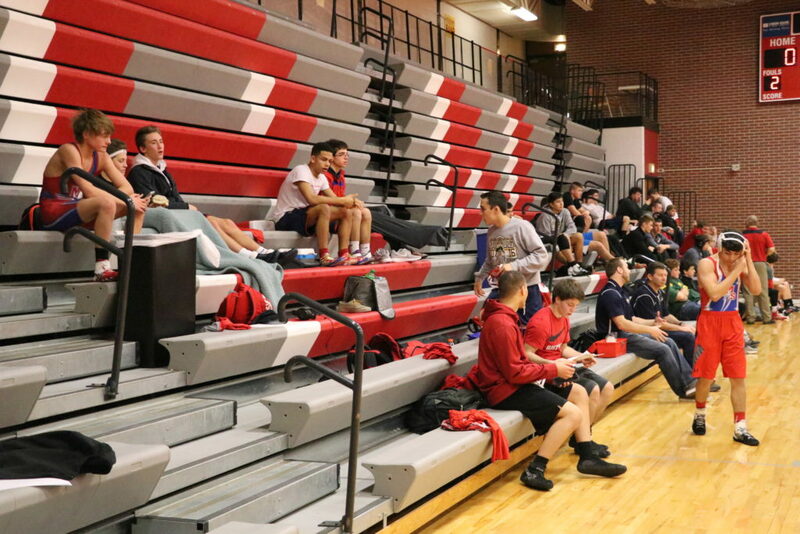 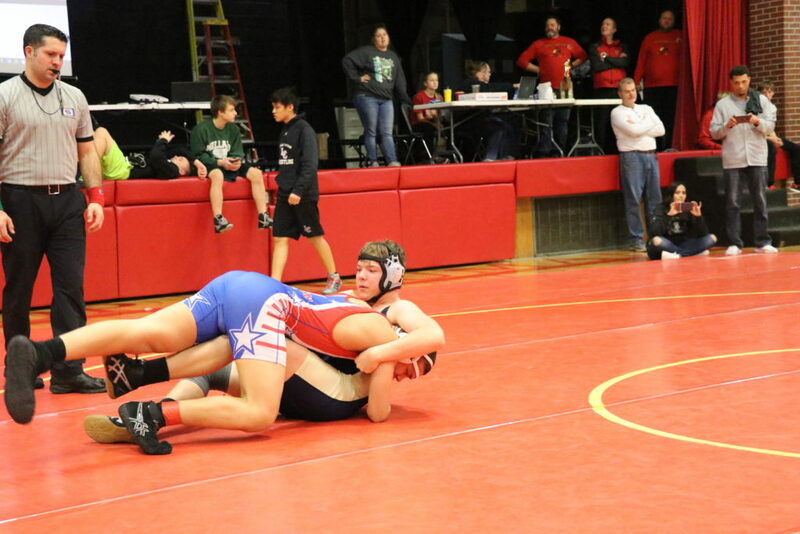 This round-robin tournament featured varsity teams from Class B and C as well as a few JV teams. 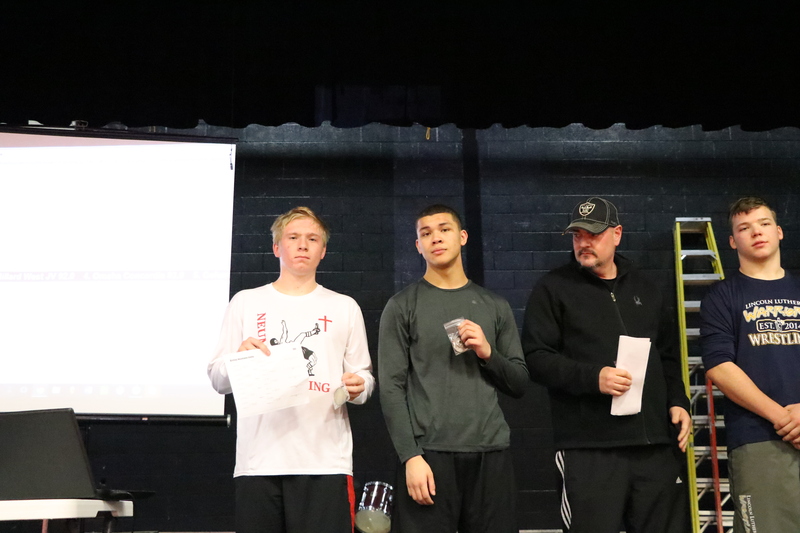 The Patriots were only able to fill 12 of the 14 weight classes which was the same amount as last year, but this year we were able to come out victorious. 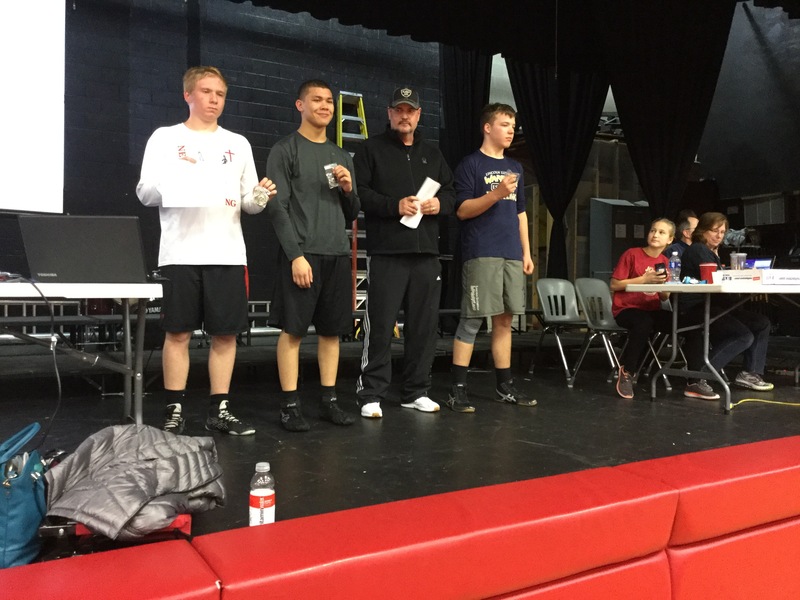 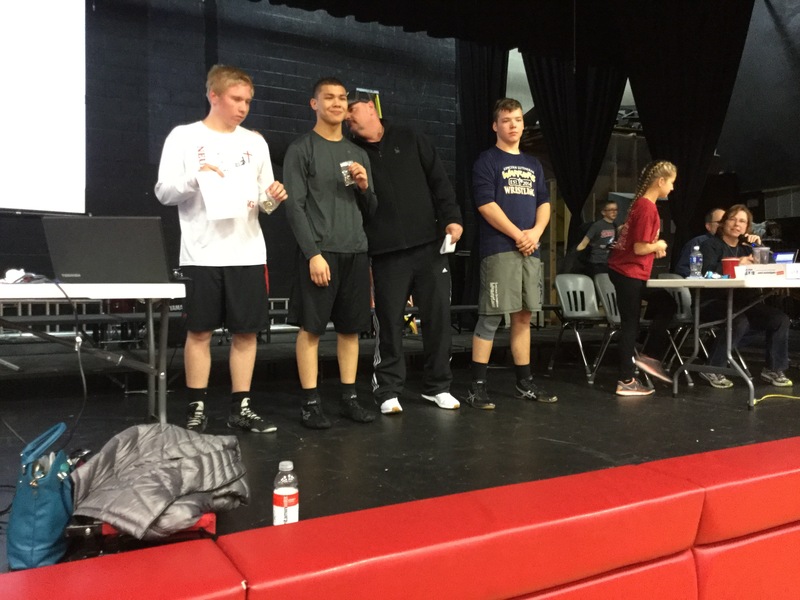 There were 2 other wrestlers that were non-point scorers in their weight class so there was a total of 14 wrestlers competing. 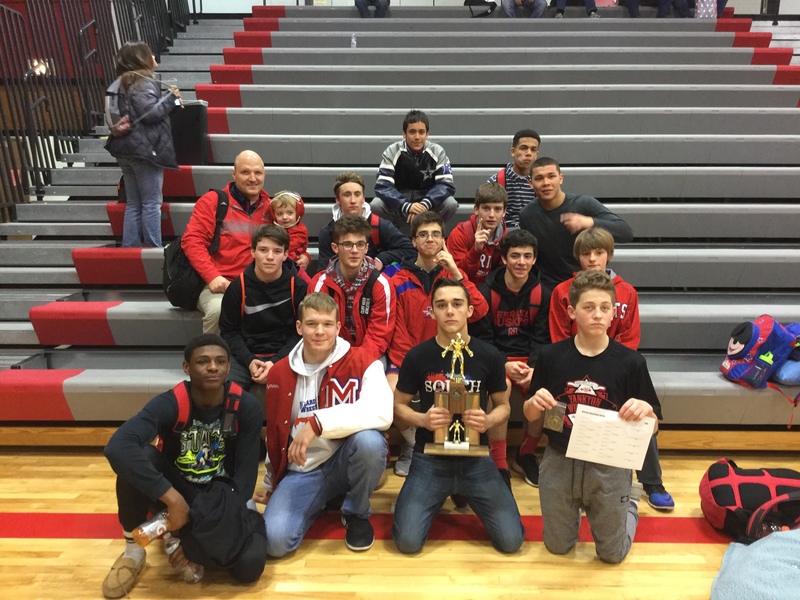 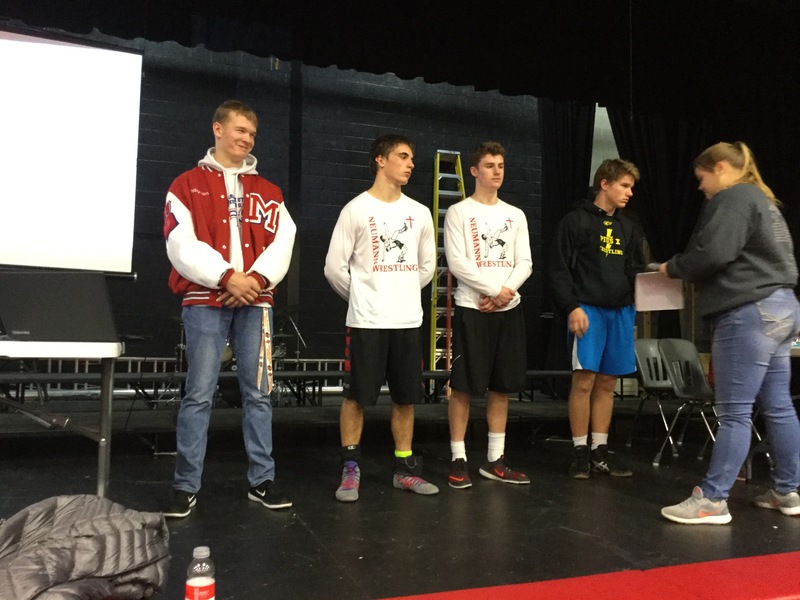 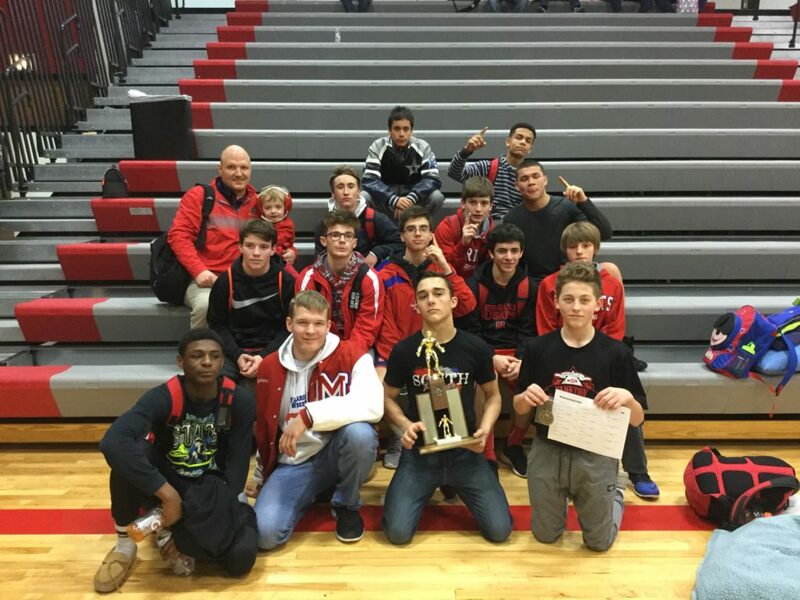 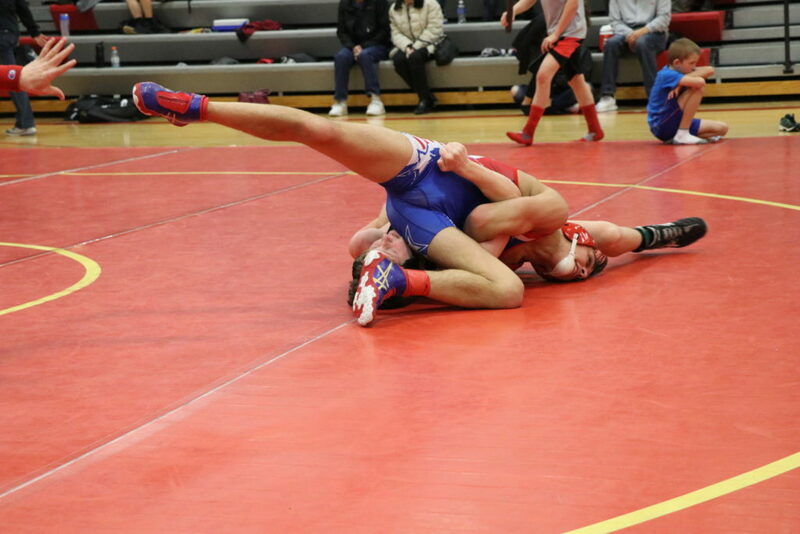 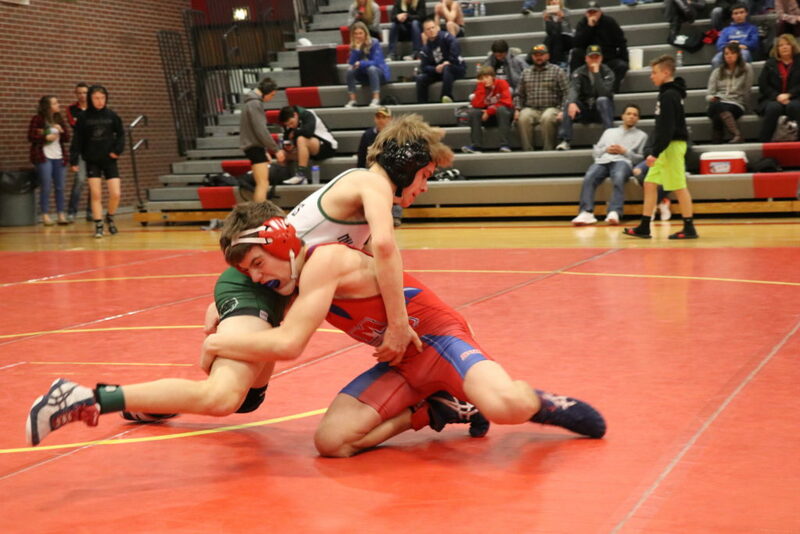 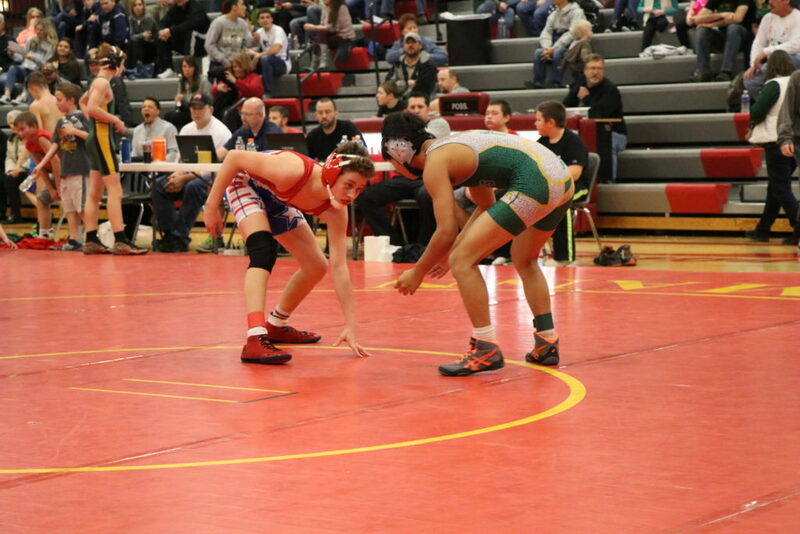 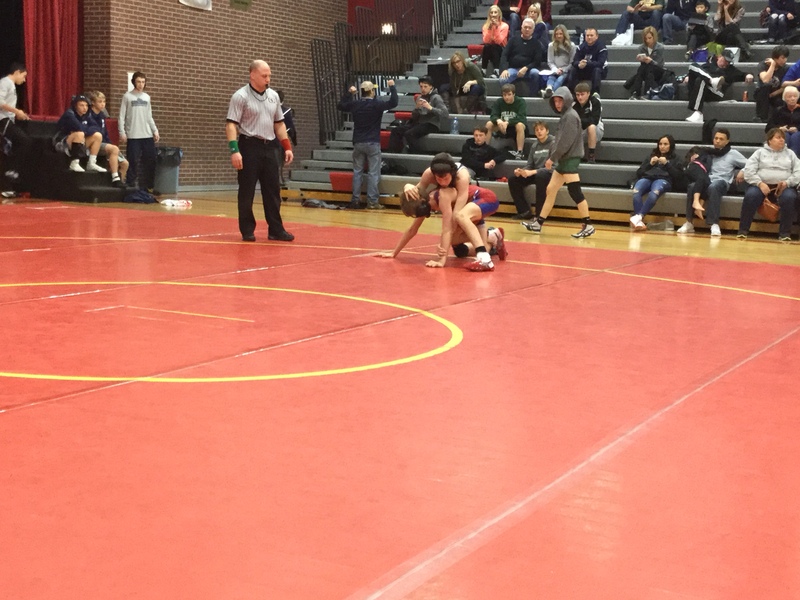 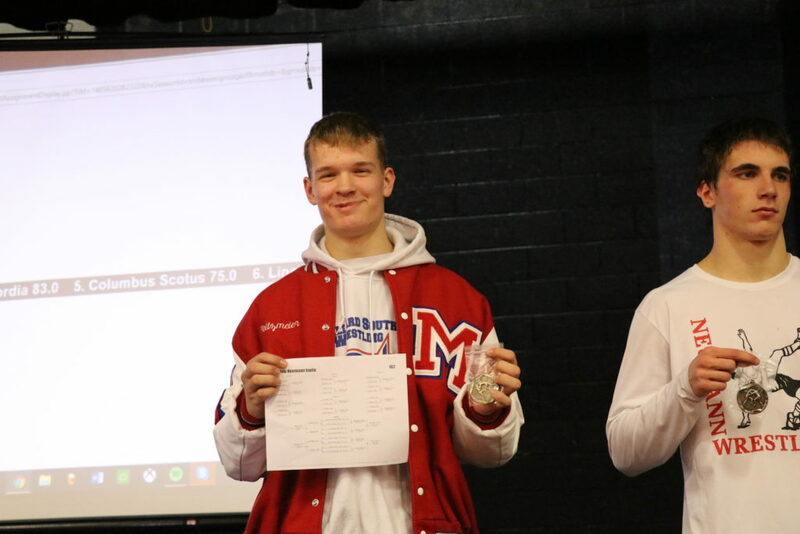 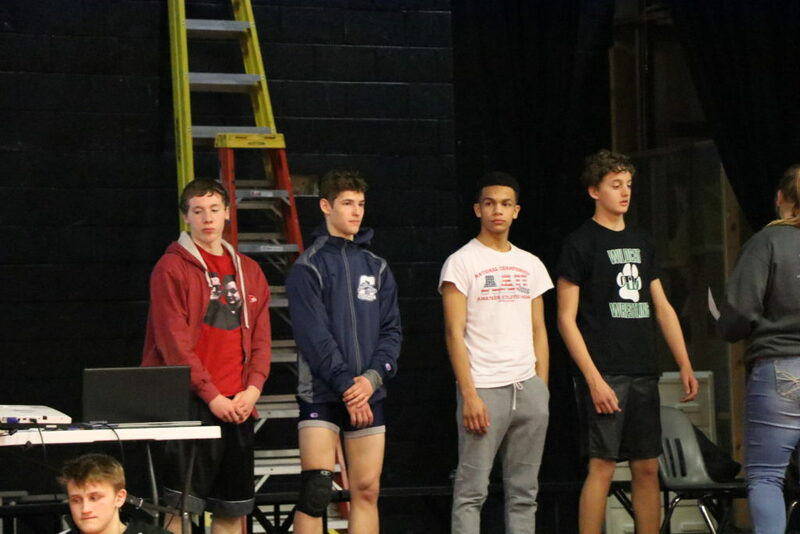 Of those 14 wrestlers, 8 are freshman, 4 sophomores, 1 junior, and 1 senior so this team is very young and shows promise for the future of Millard South wrestling which currently has 9 seniors in their varsity line-up. 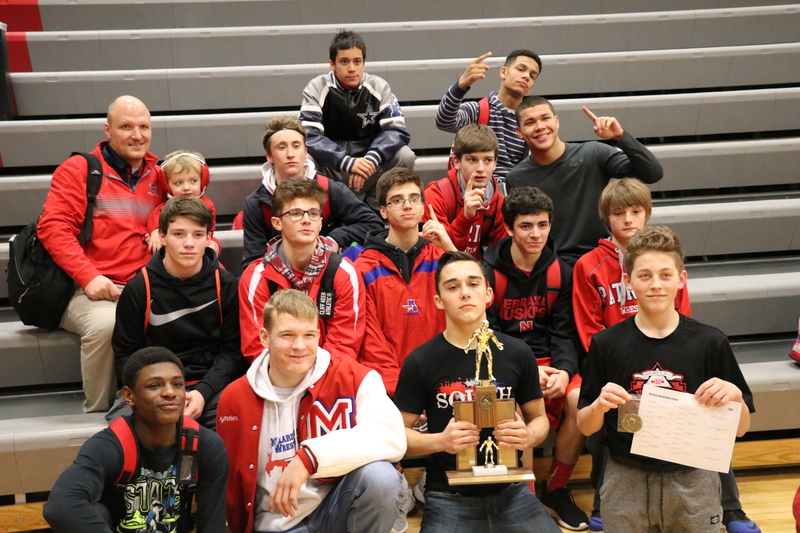 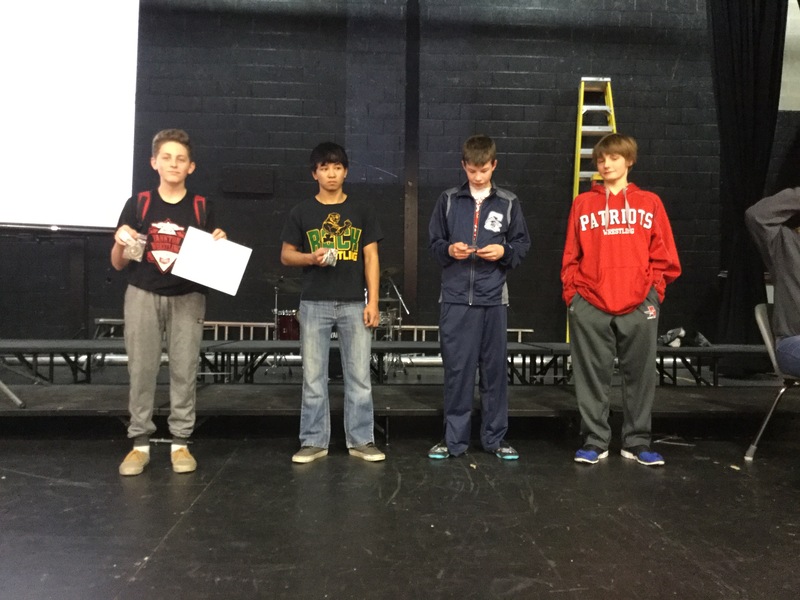 The Patriots crowned 5 champions on the day. The entire team scored 314 actual match points which was 112 points more than 2nd place Bishop Neumann who had a lot more wrestlers. 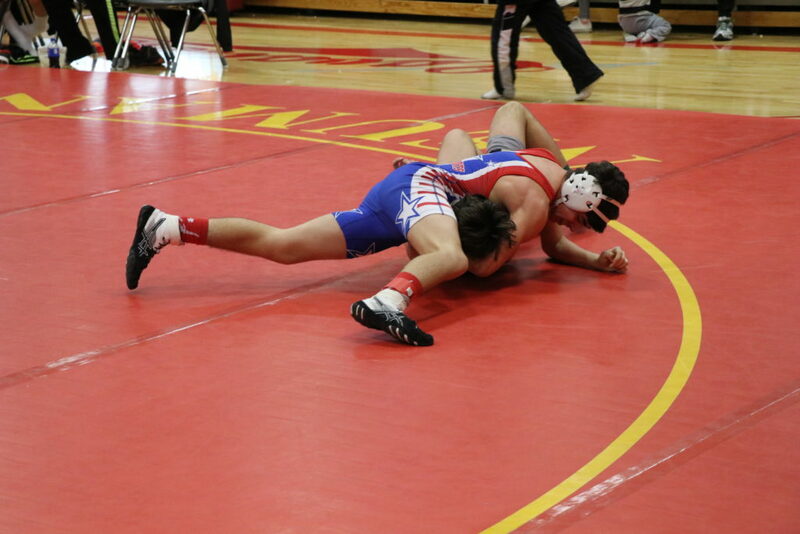 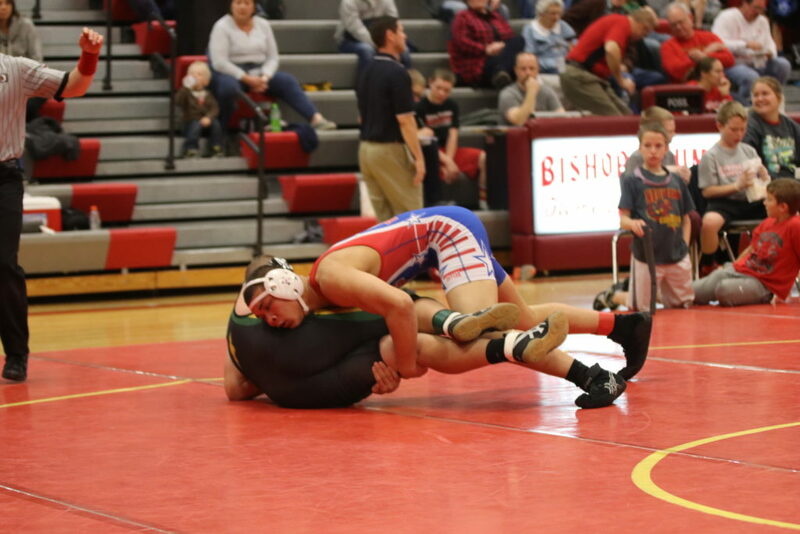 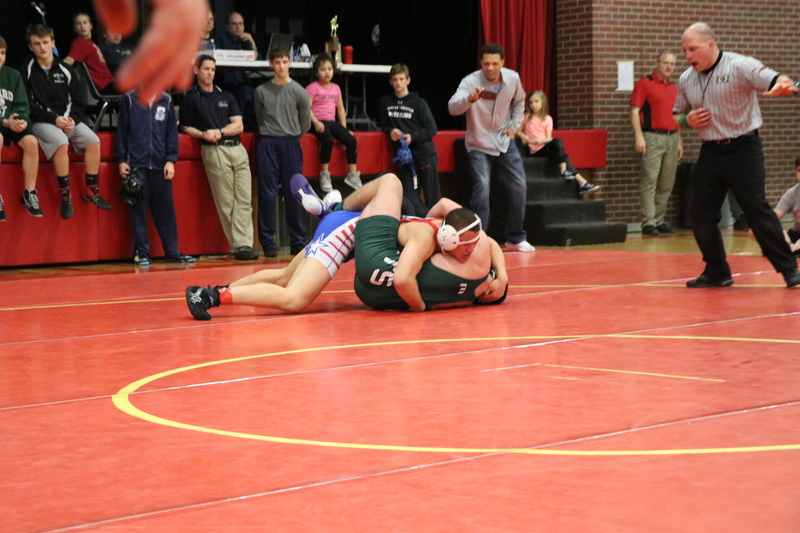 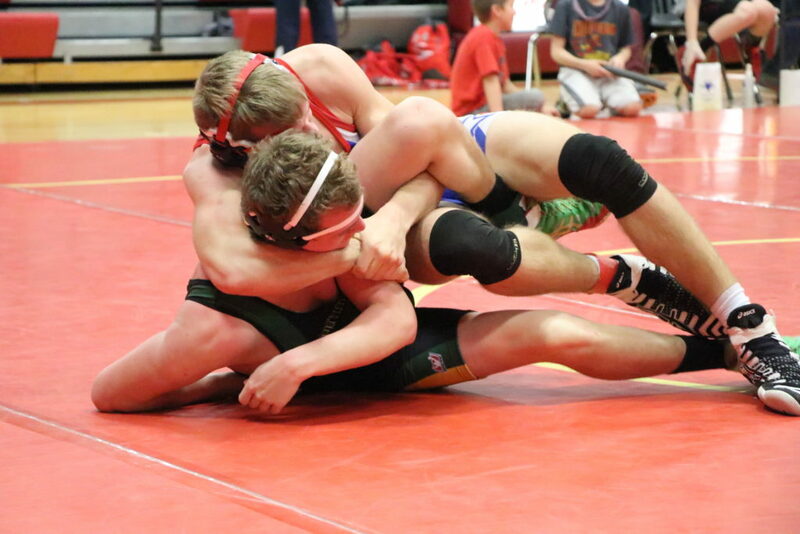 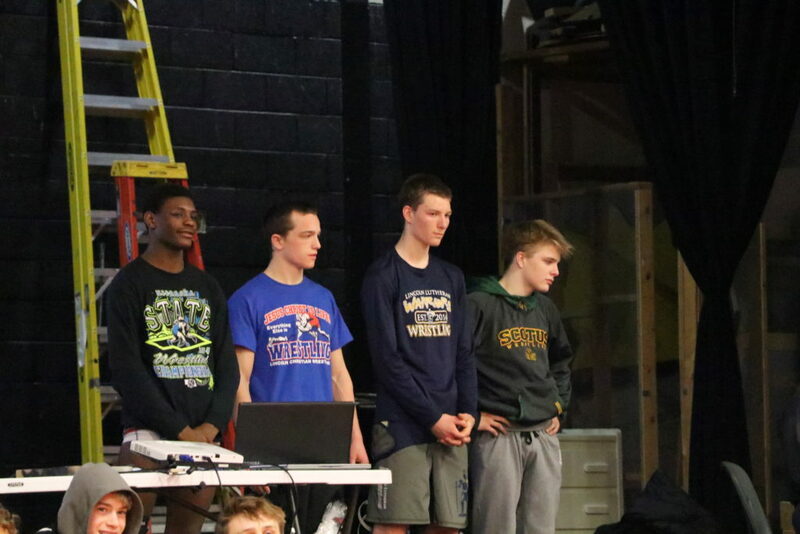 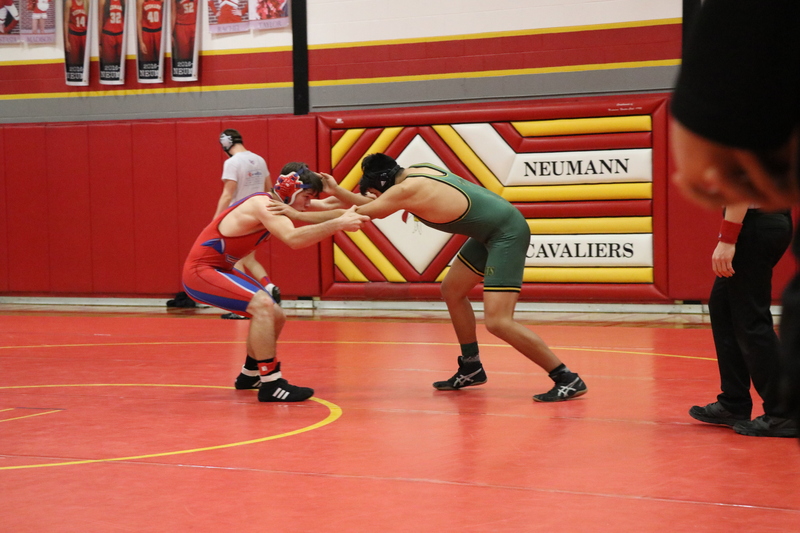 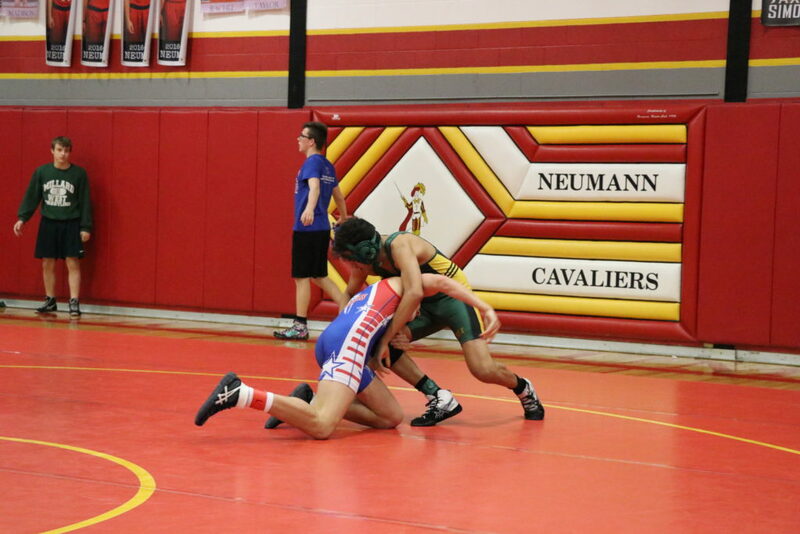 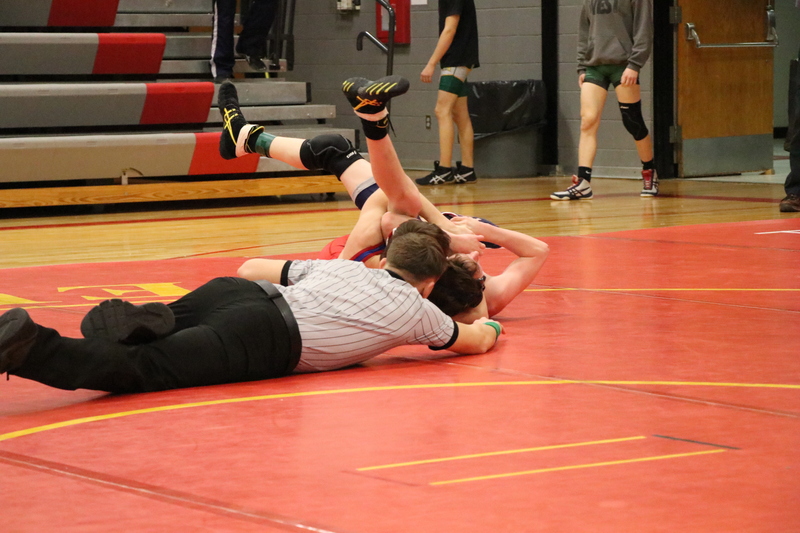 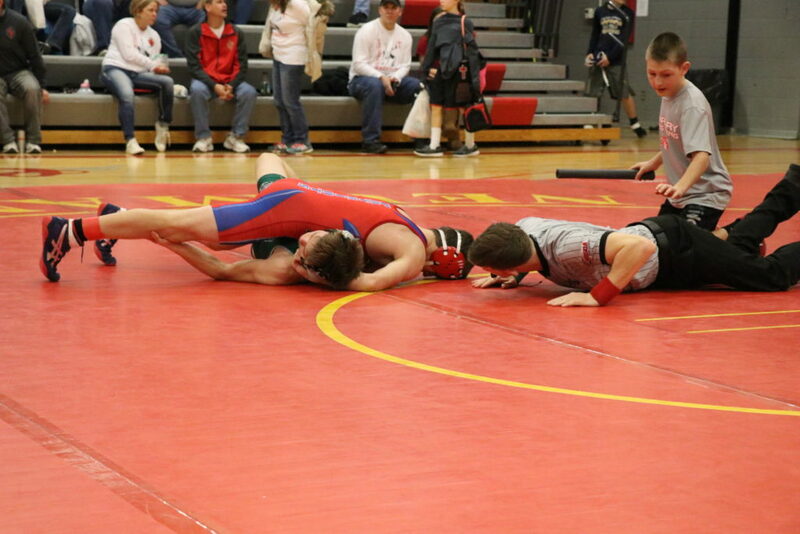 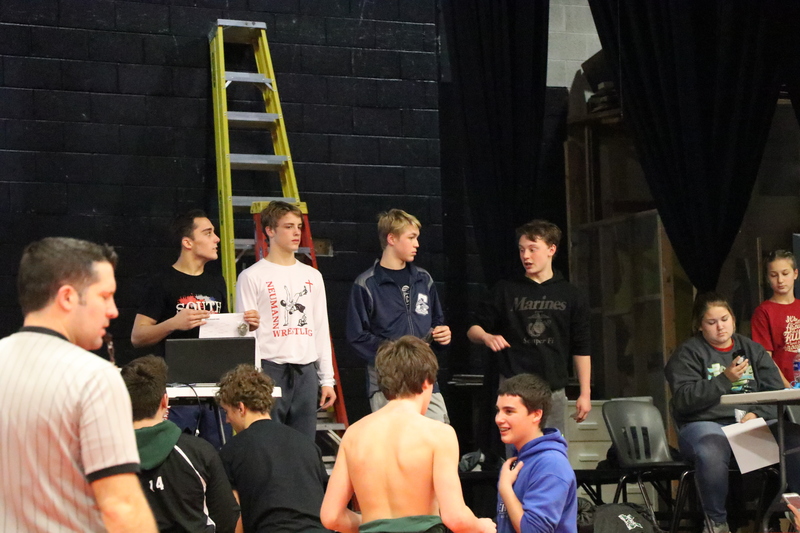 They also finished 32 matches by pin which was 5 more than the host Bishop Neumann. 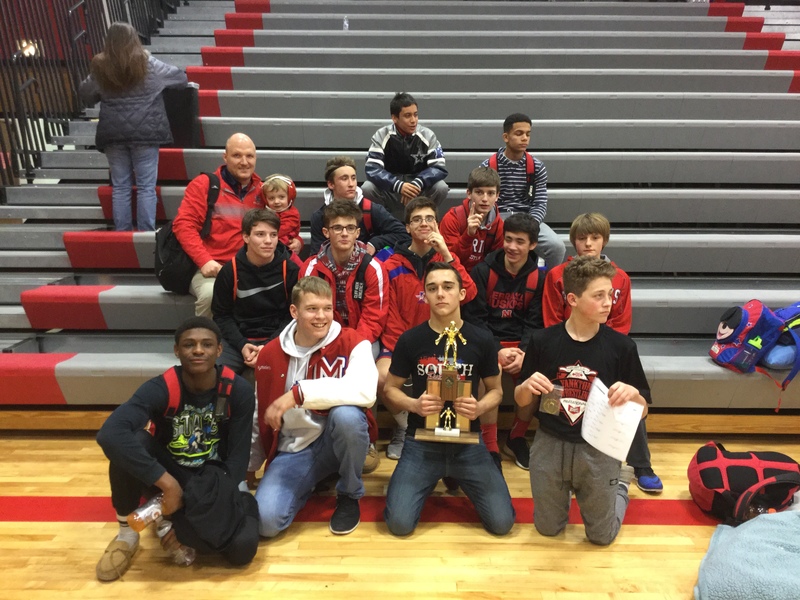 The 221.5 team points were 35.5 more than 2nd place Bishop Neumann and 32.5 more than the team was able to score the previous year. 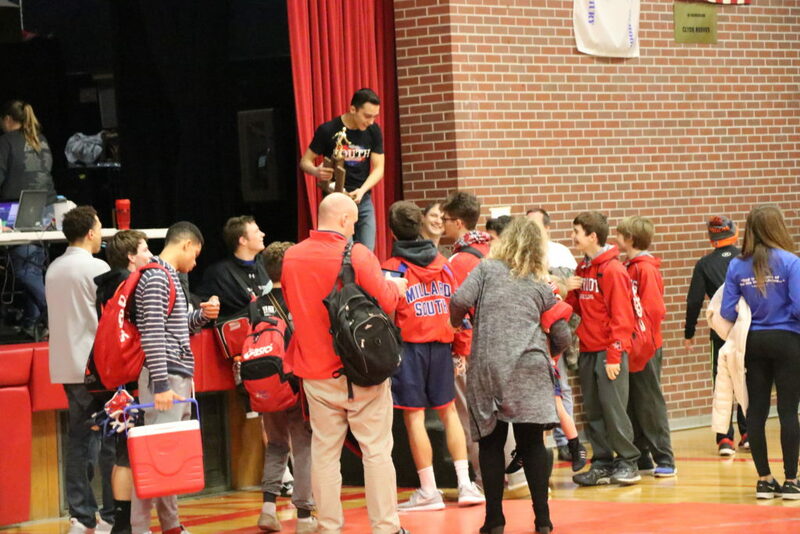 A big part of the reason for the Patriots’ success was the family atmosphere where everyone was cheering each other on and it was a special day in that aspect as this JV team is really starting to come together. 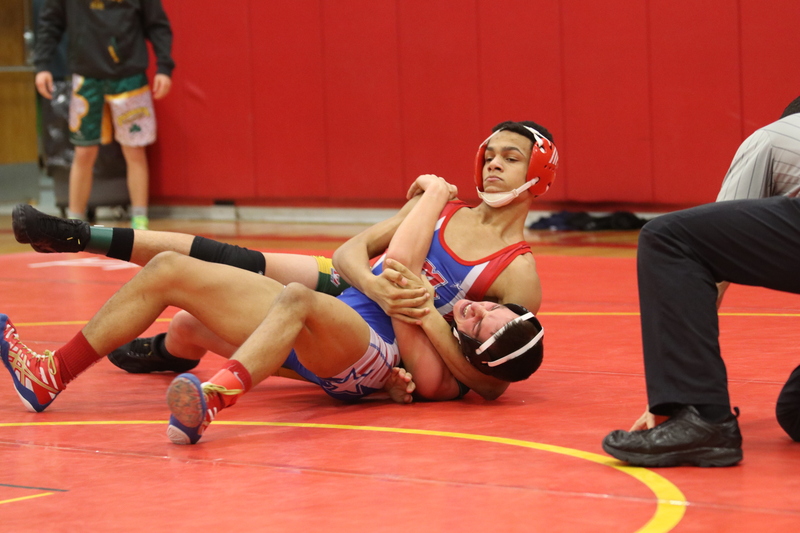 Dominic Deloa excelled in his 4 matches recording 3 falls and a major decision. 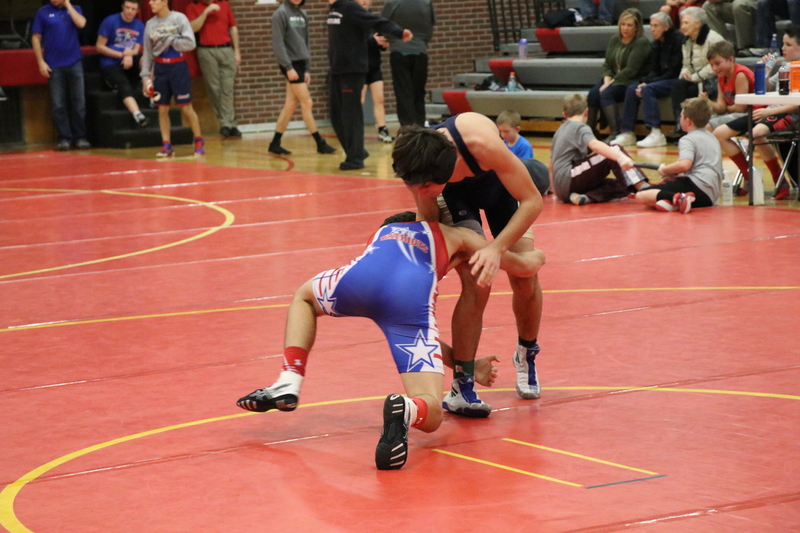 Dominic aka “The Dominator” continues to use his quickness and match savvy to control the pace on his feet. In recent weeks he has really improved by not getting out of position developing an ability to control his aggression. 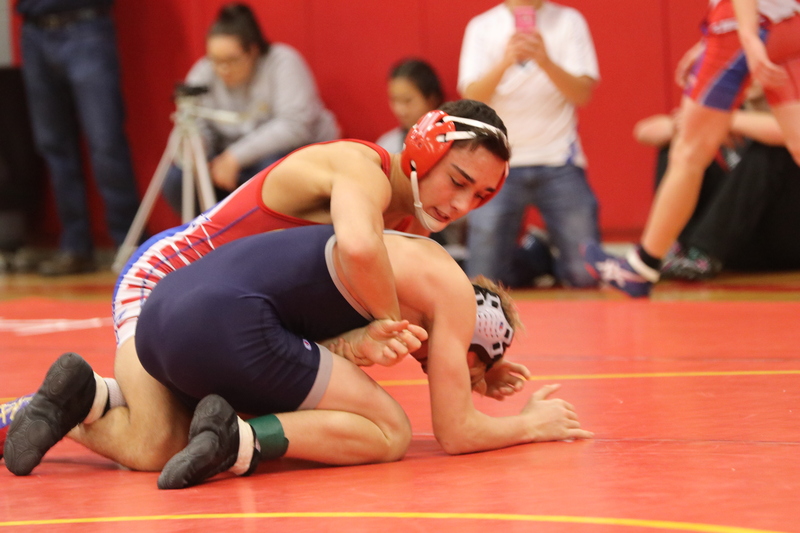 Garrett Carbullido dominated his opponents as well. He recorded 4 pins including one match where he hit 4 different pinning combinations within the last 20 seconds to pick up the fall. 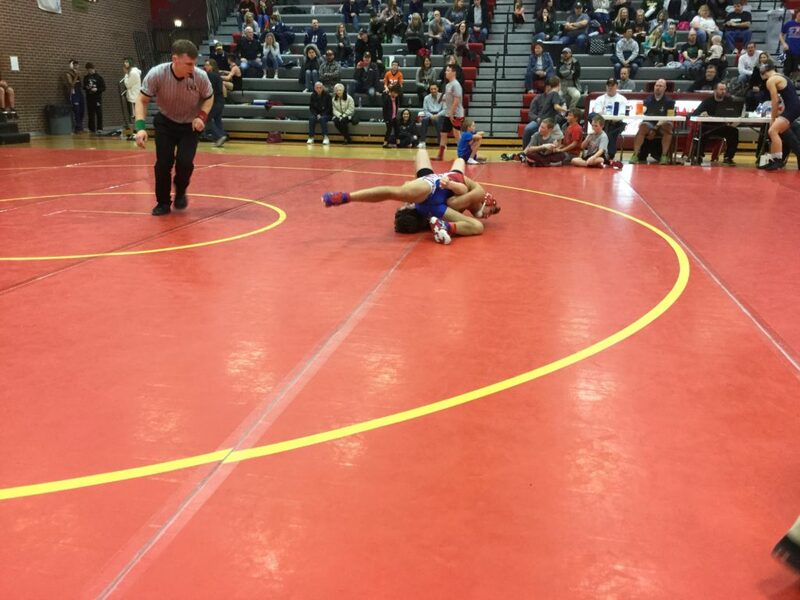 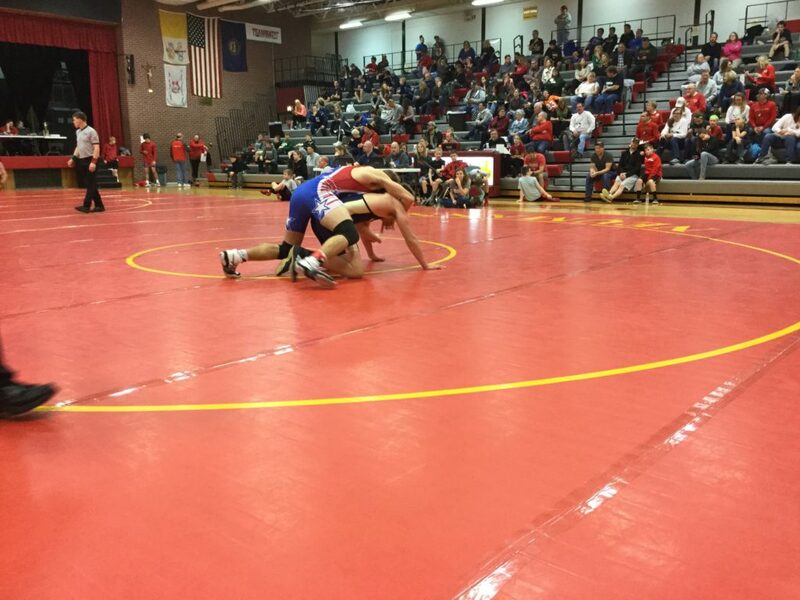 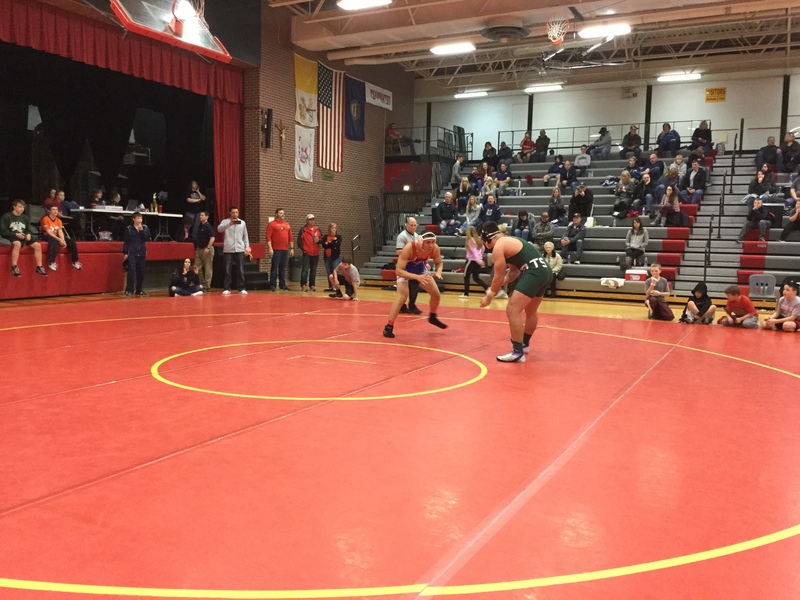 Carbullido continues to show promise as his record on the season is 31-3 wrestling many of his matches at varsity tournaments. 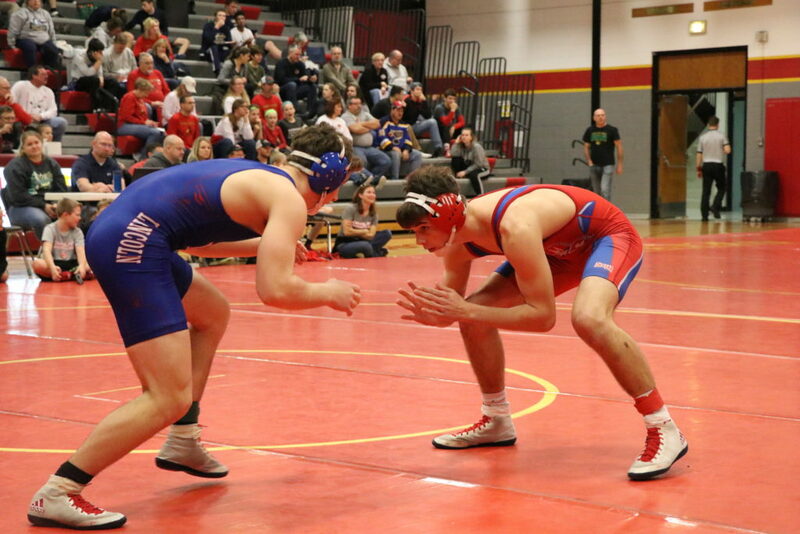 Justin Jeannette returned from his shoulder injury and showed no signs of rust. 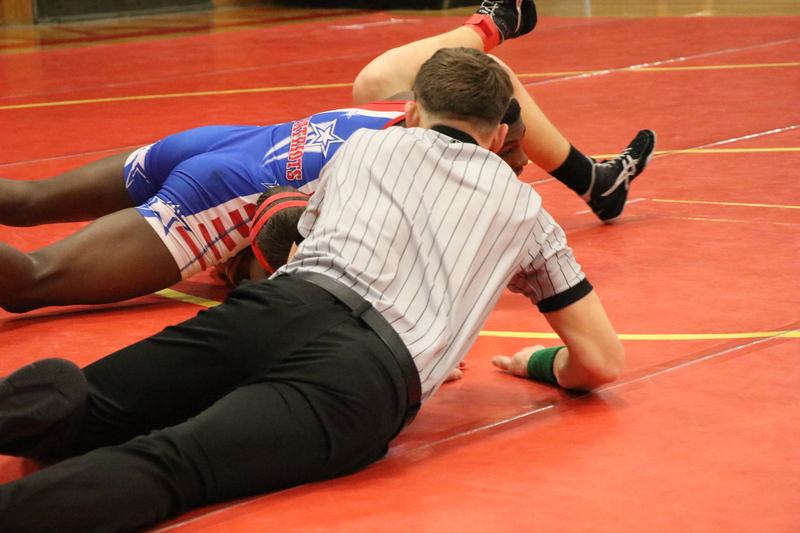 Jeannette collected 2 falls and 2 major decisions on the day. Jeannette showed an improved arsenal of leg attacks which is a great sign because he also has big move capability from upper body ties at any moment. 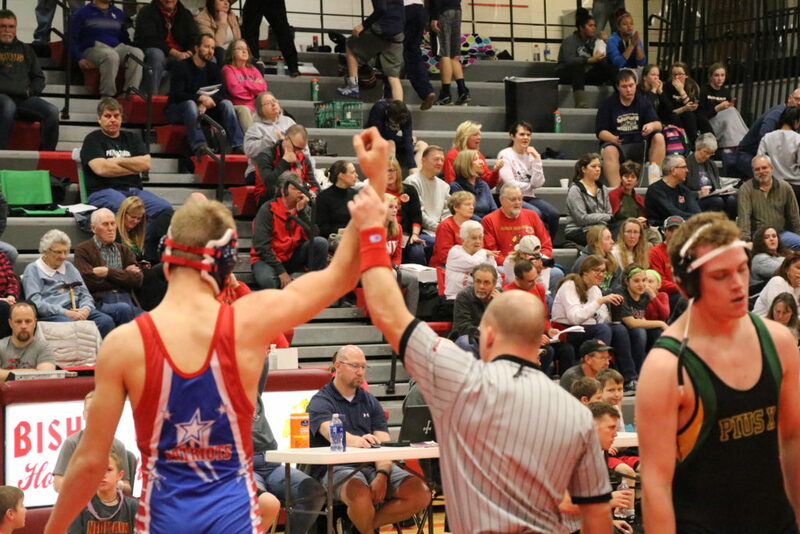 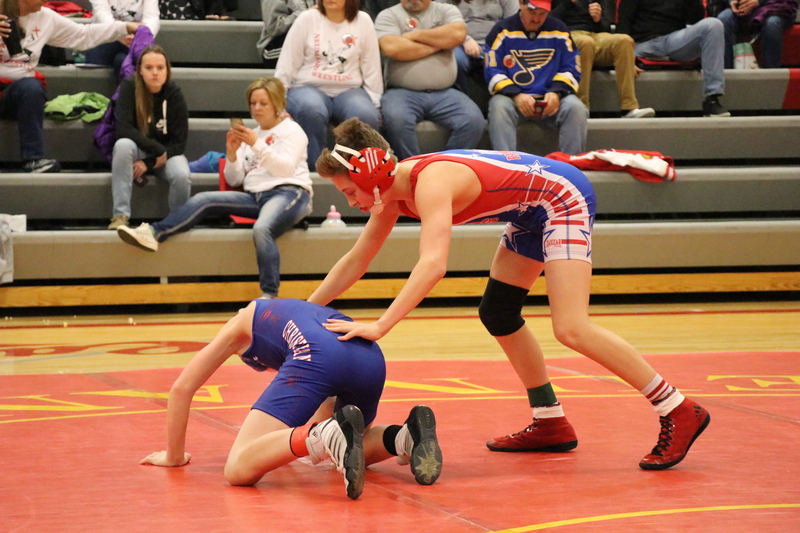 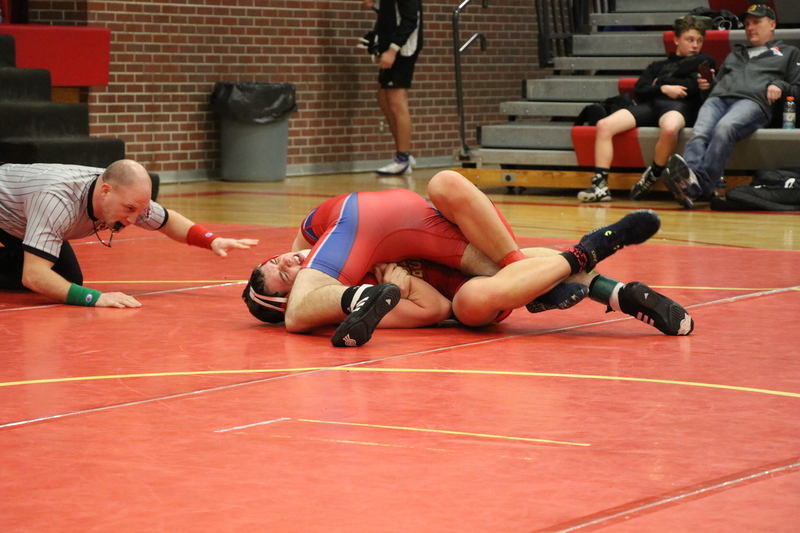 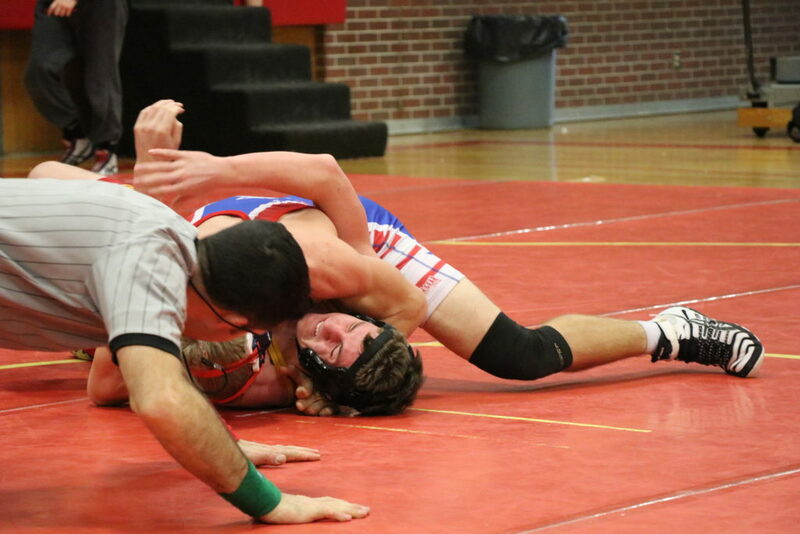 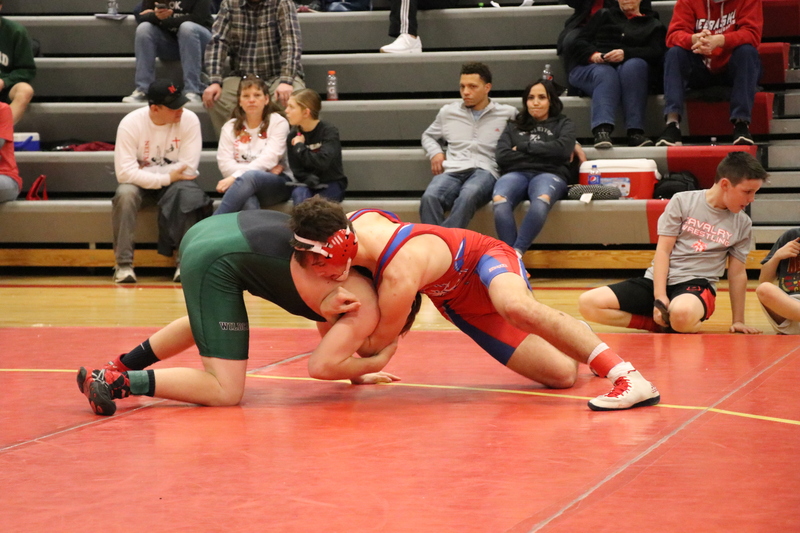 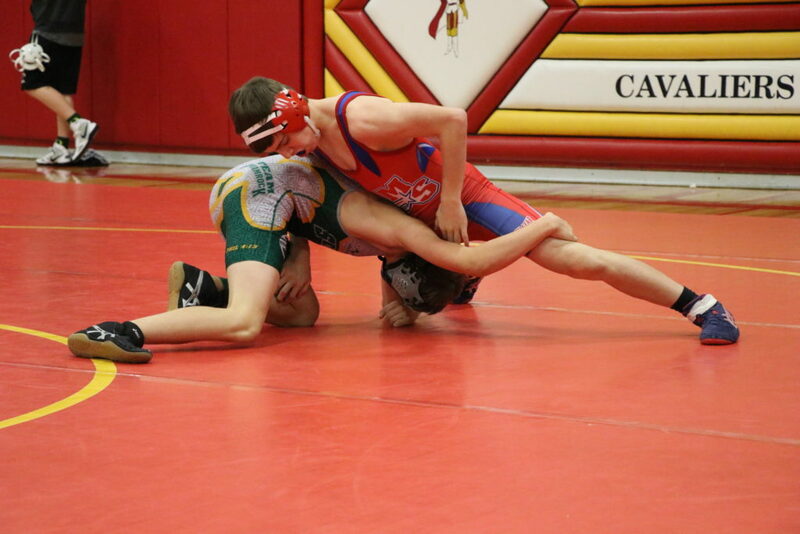 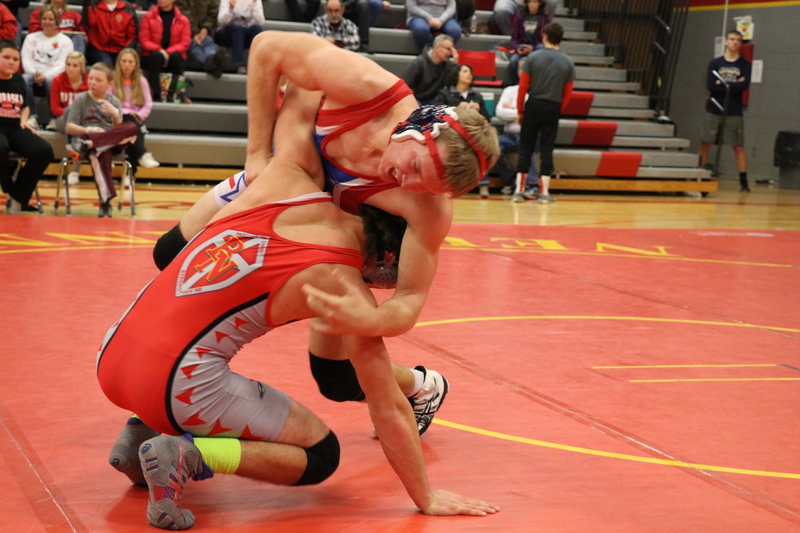 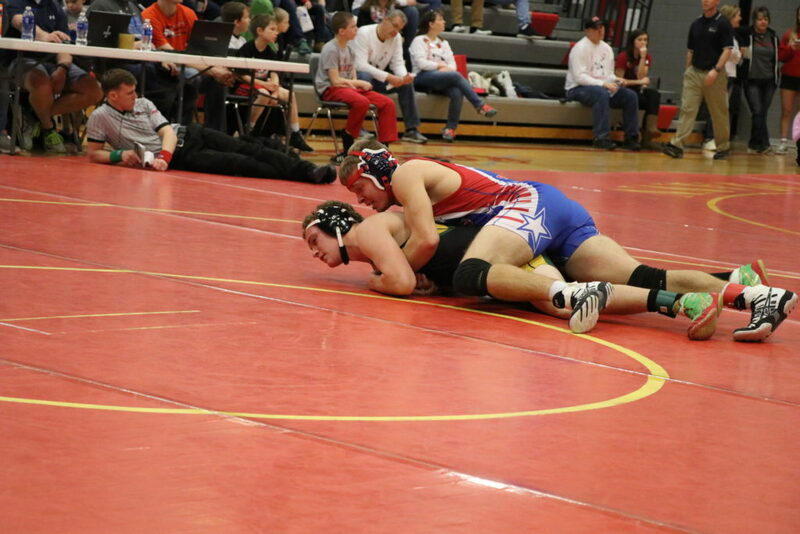 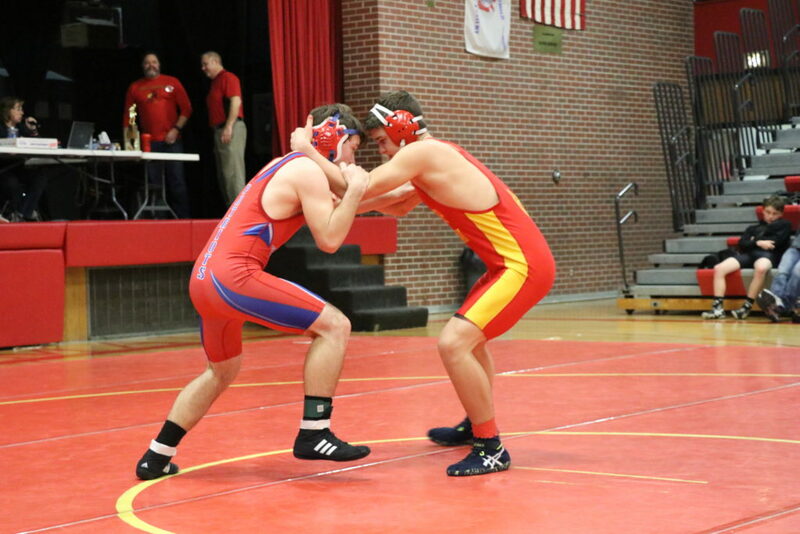 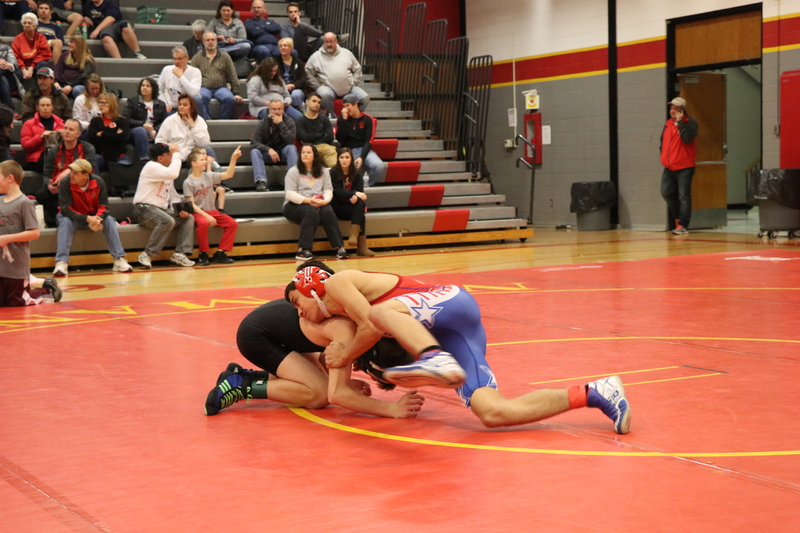 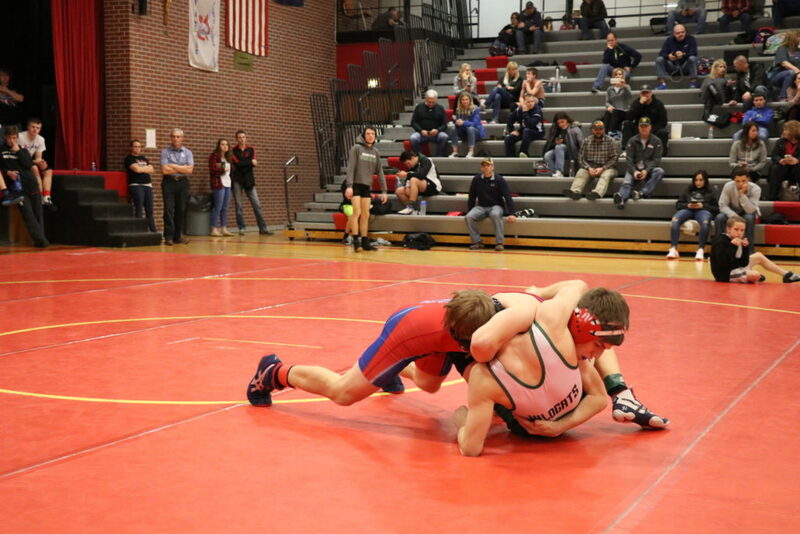 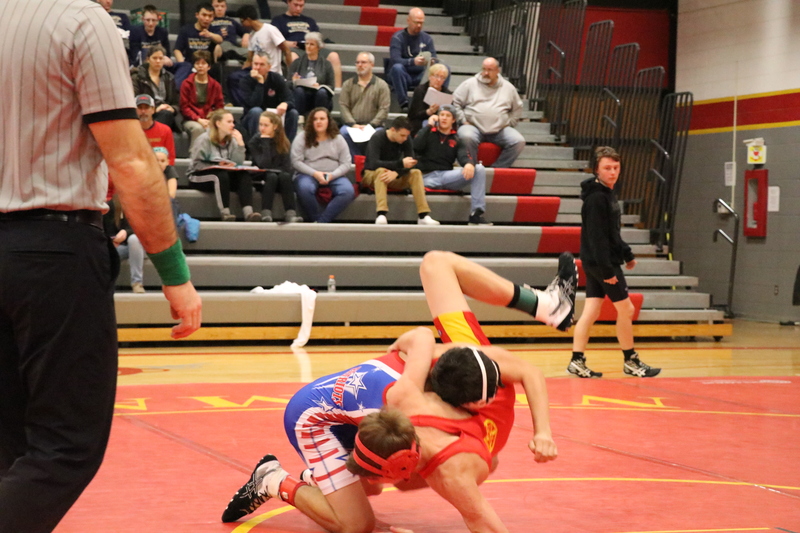 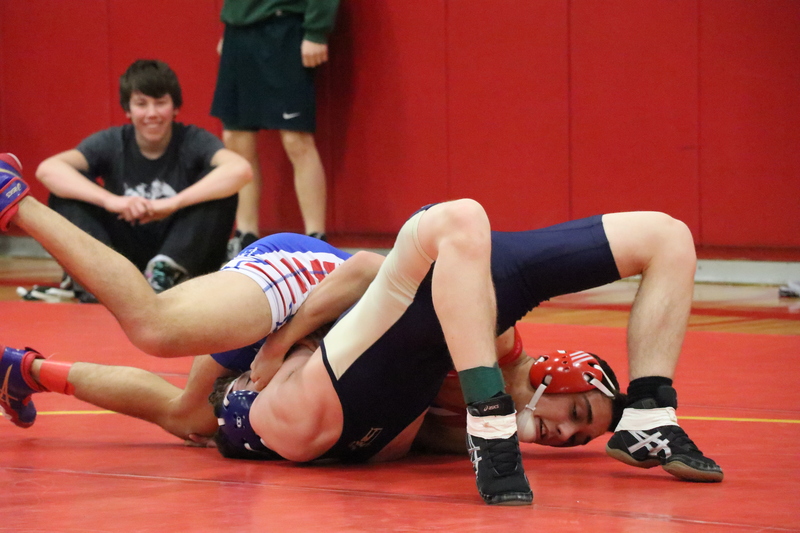 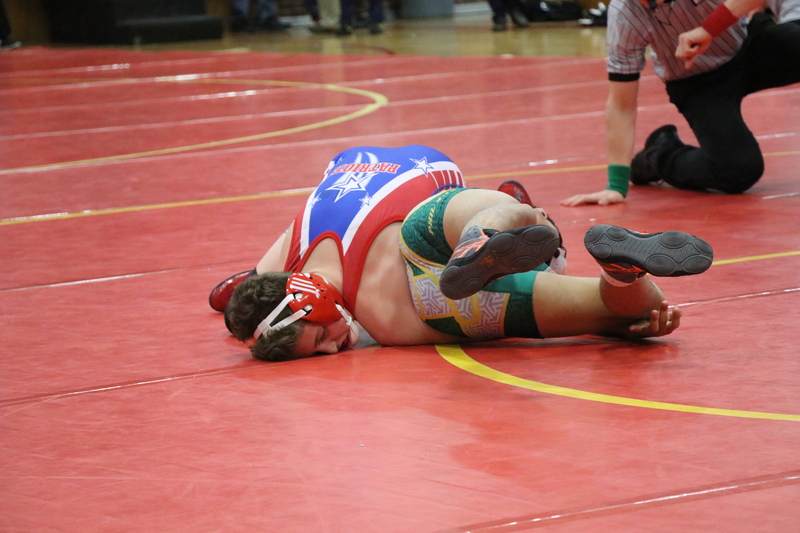 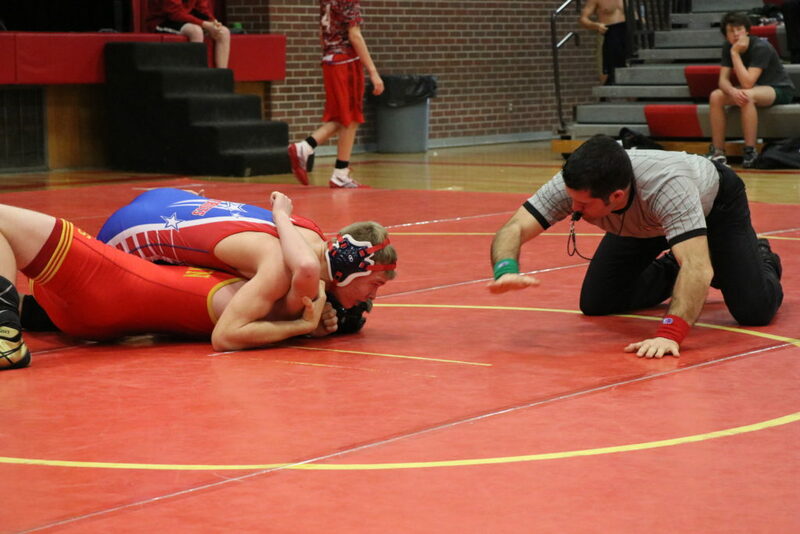 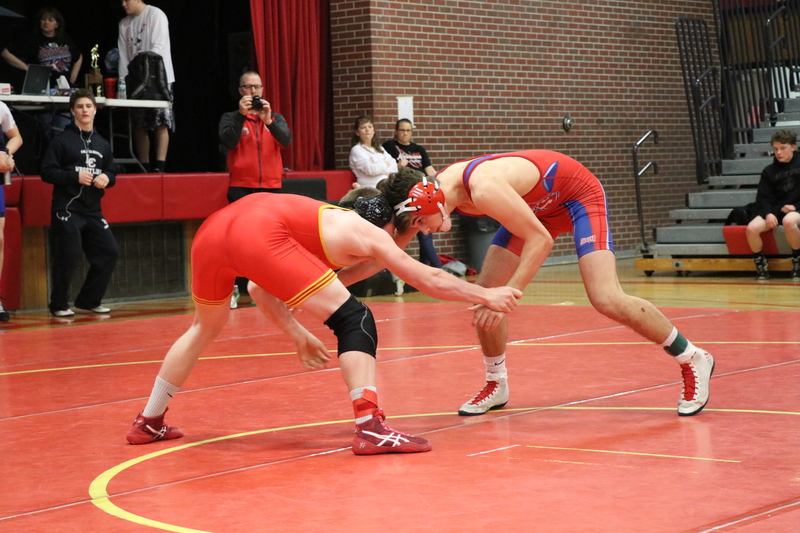 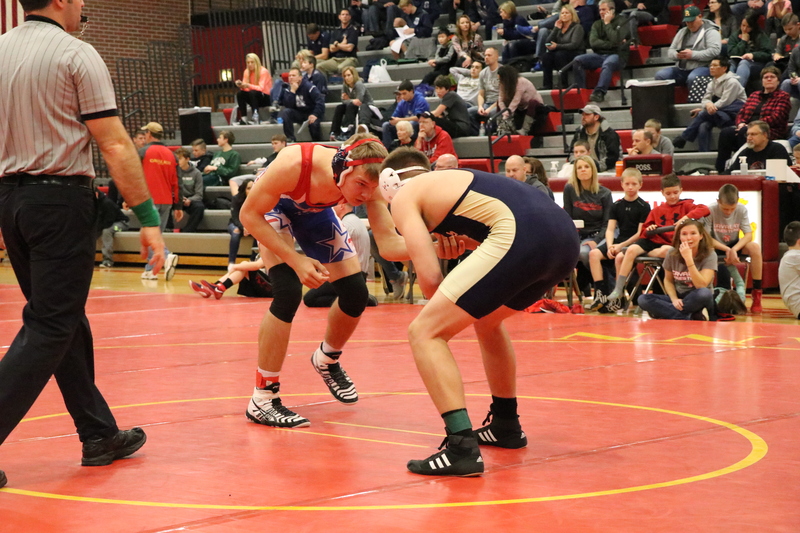 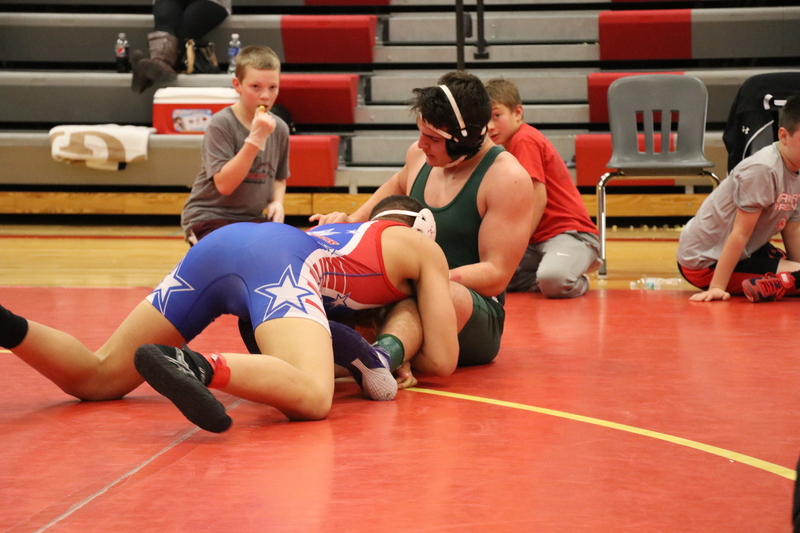 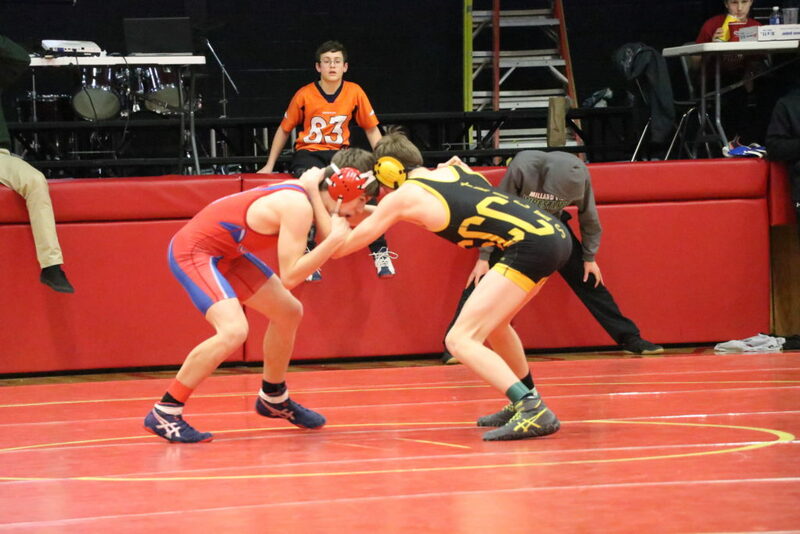 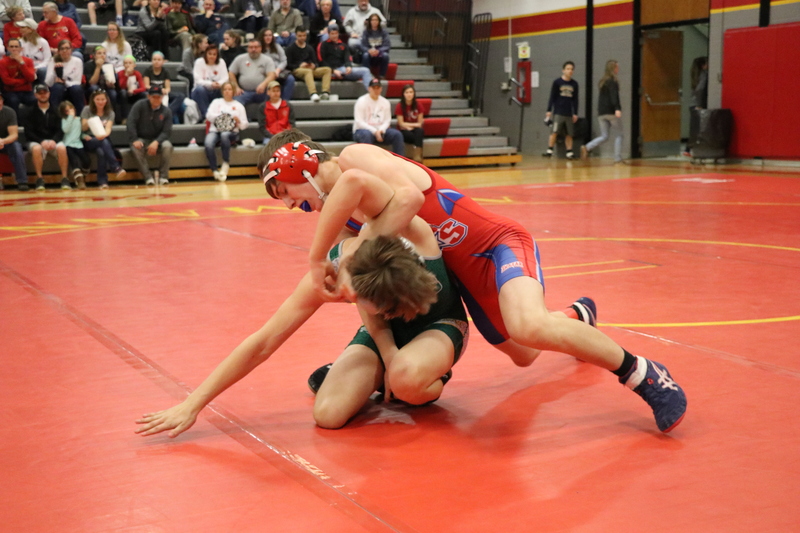 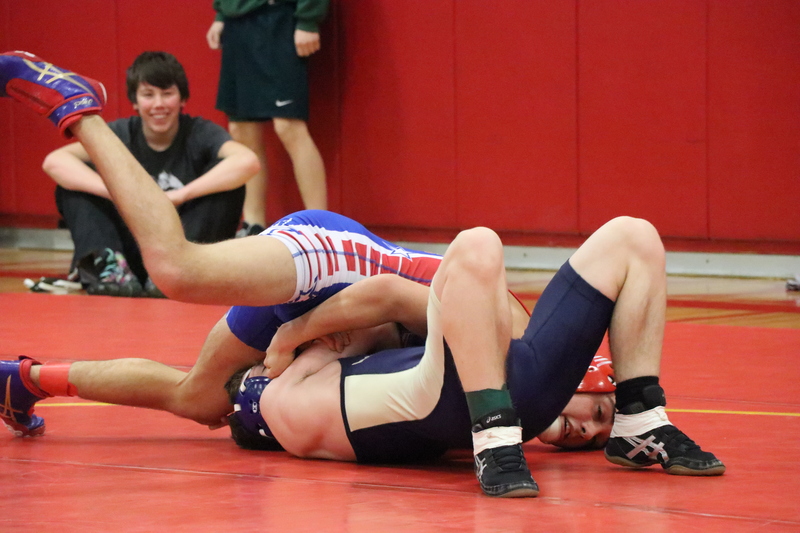 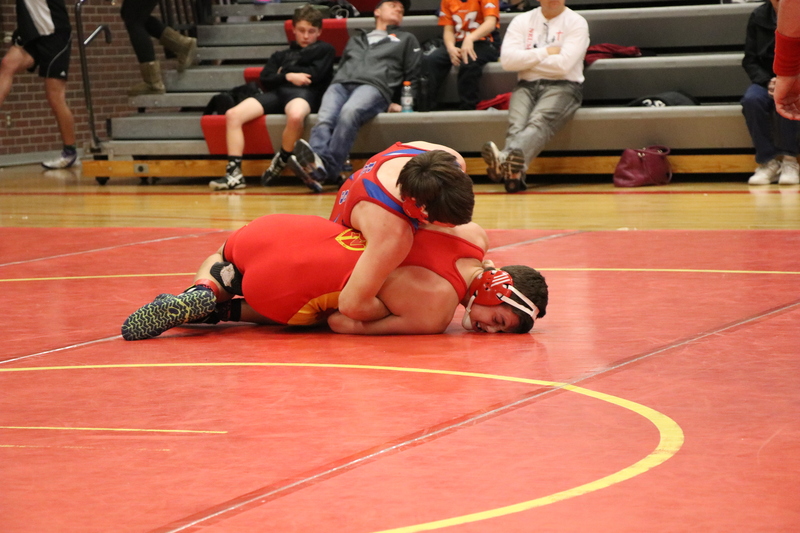 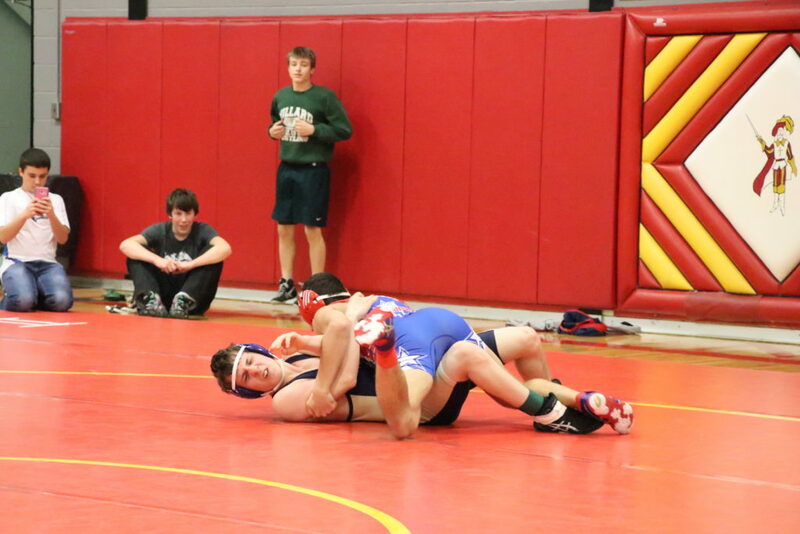 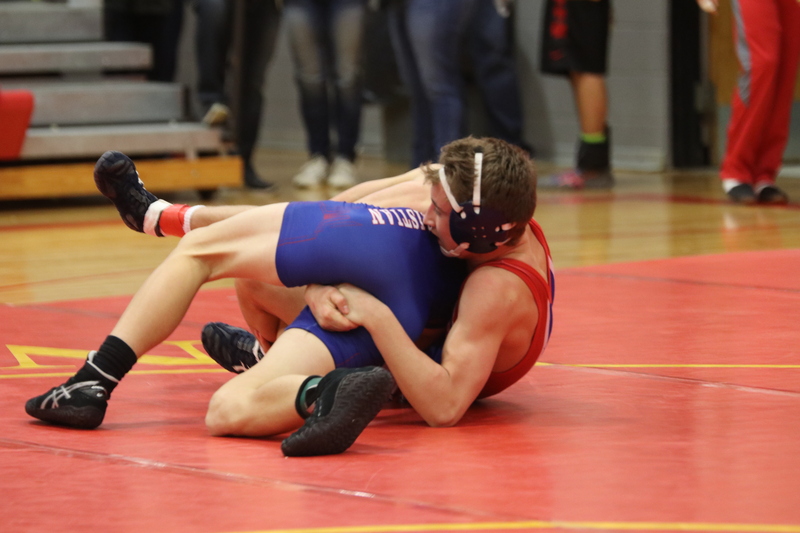 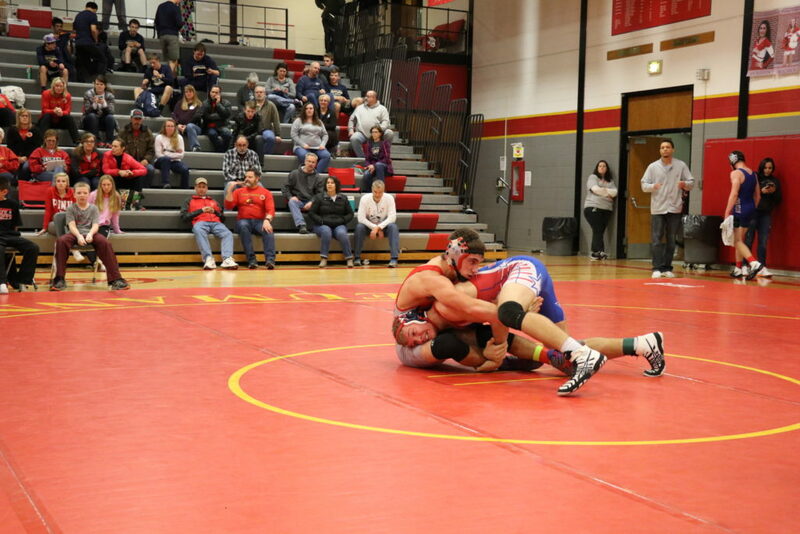 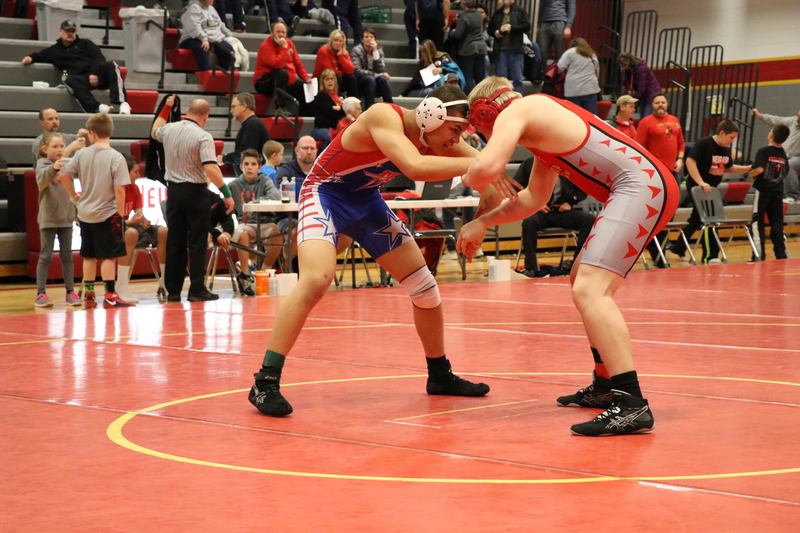 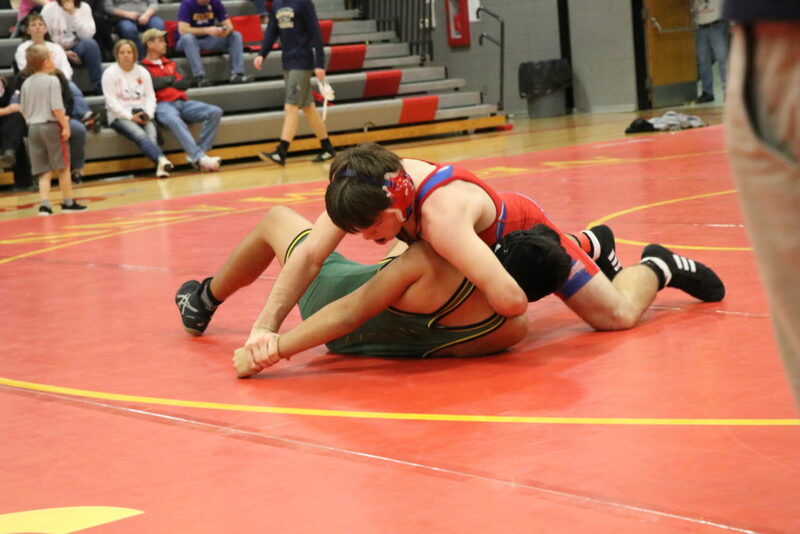 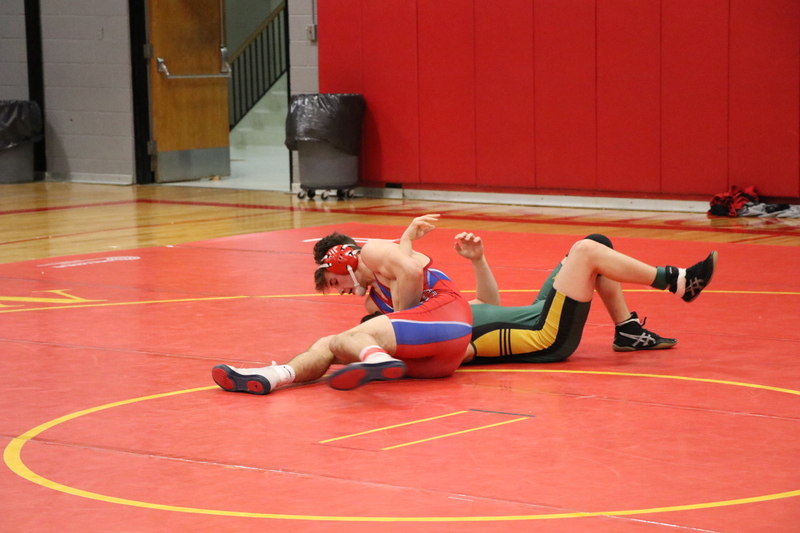 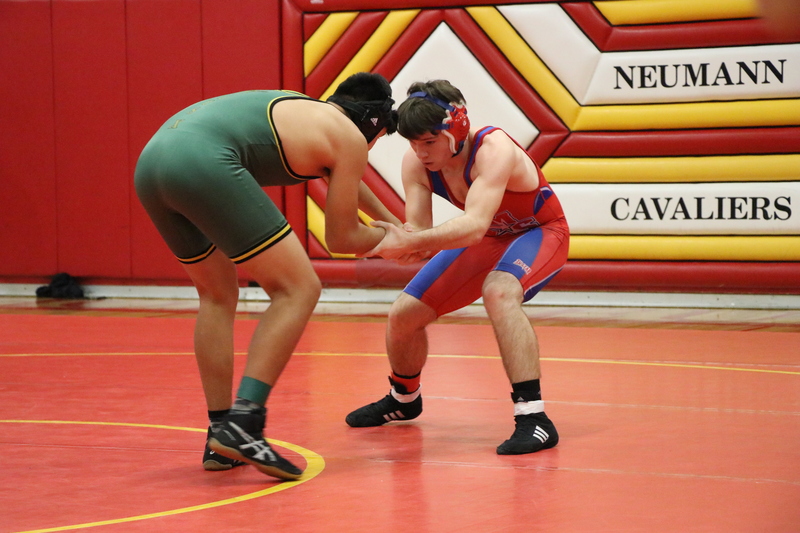 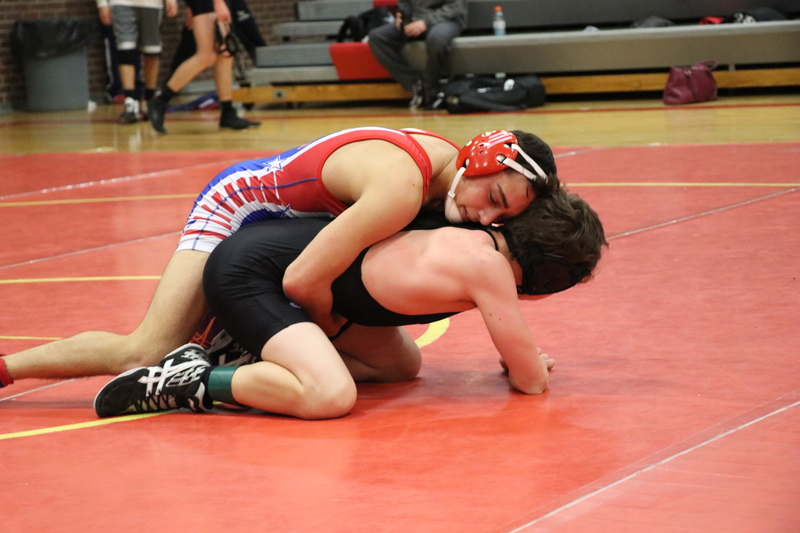 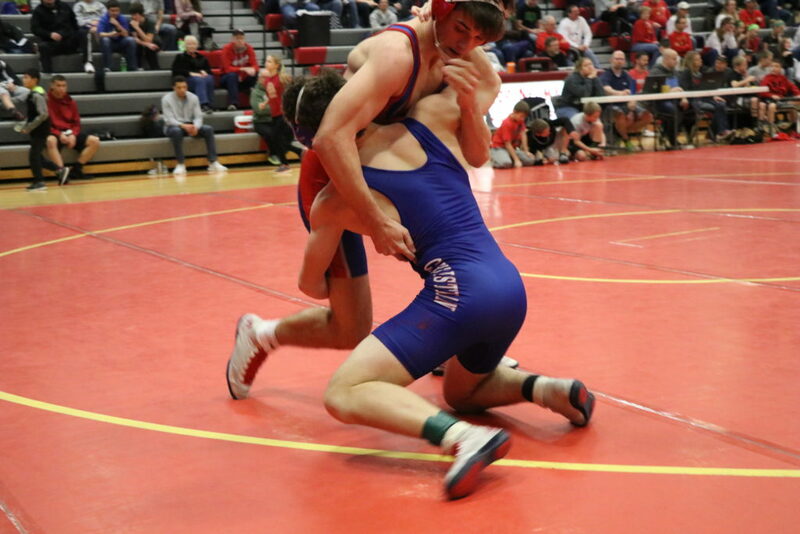 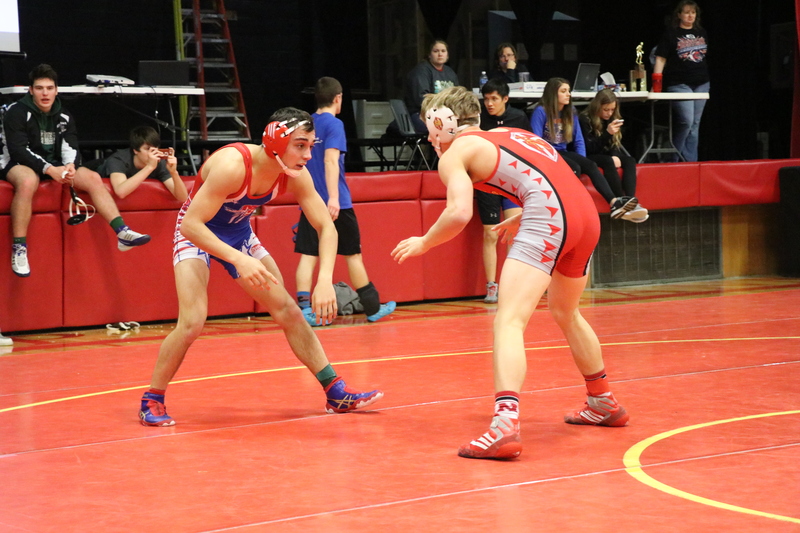 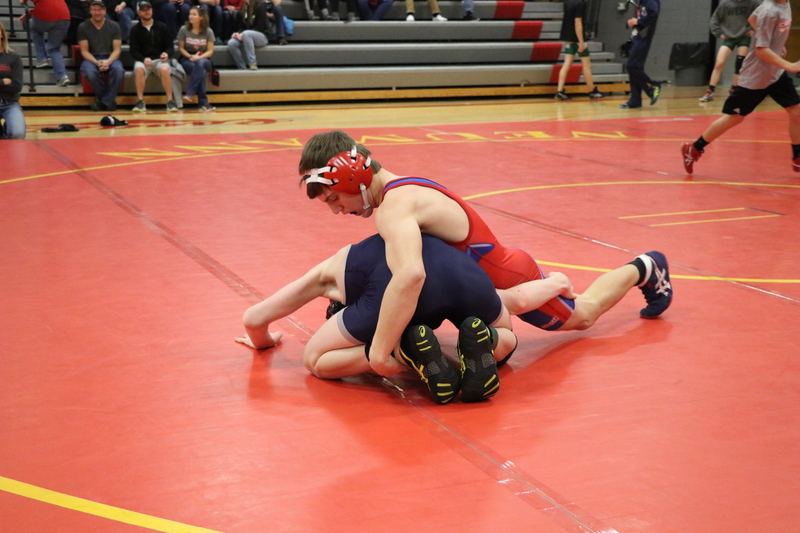 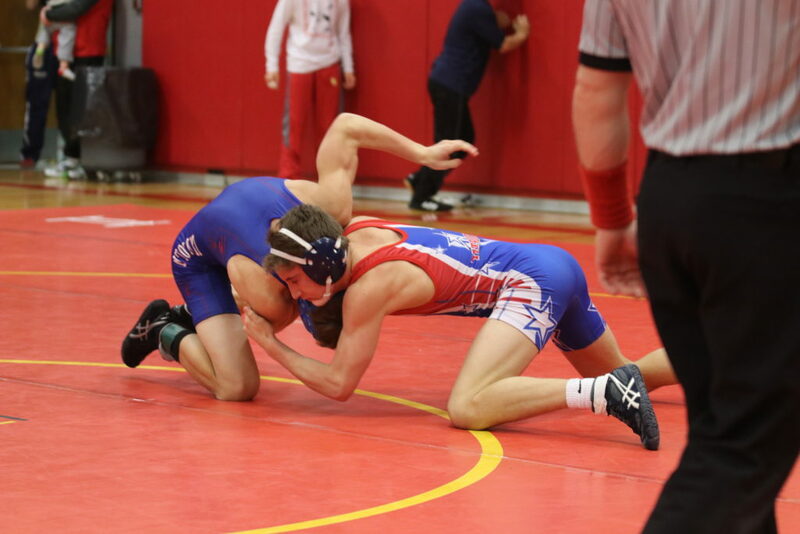 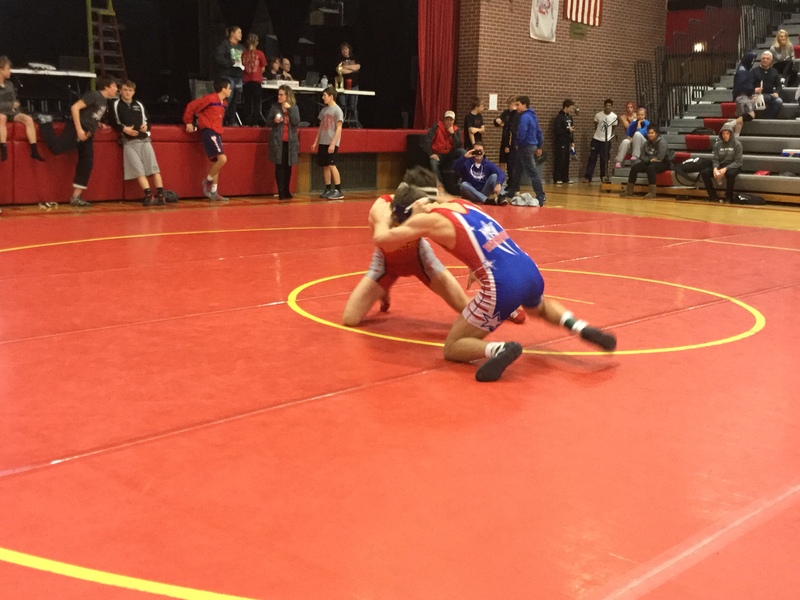 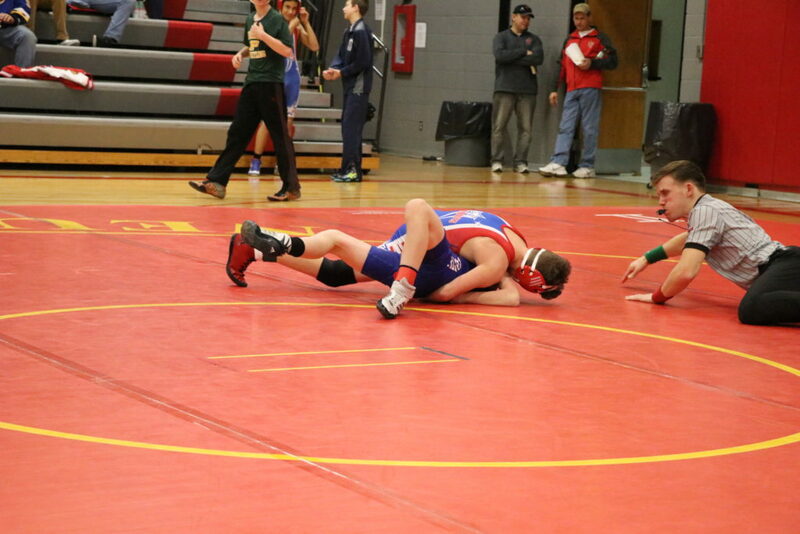 Jace Caniglia was the lone senior wrestling for the Patriots on the day. 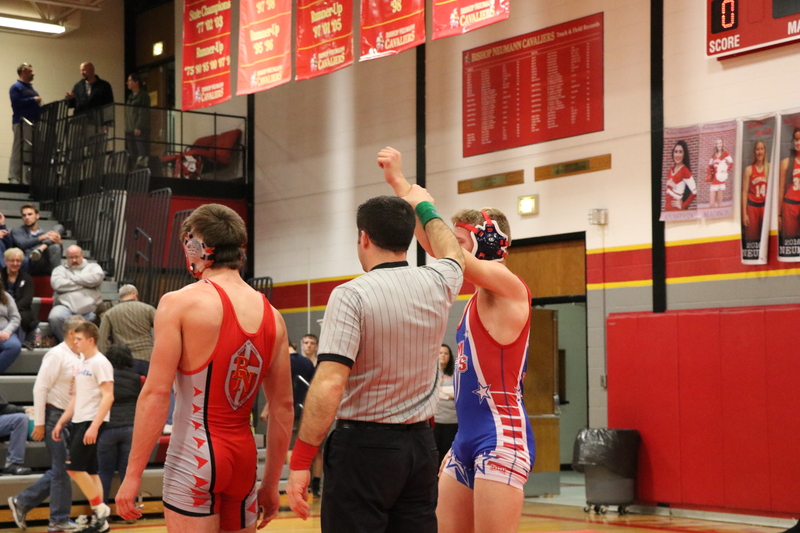 Caniglia continued to add to his unbeaten season with 3 falls and a gritty 1-0 victory in the finals. 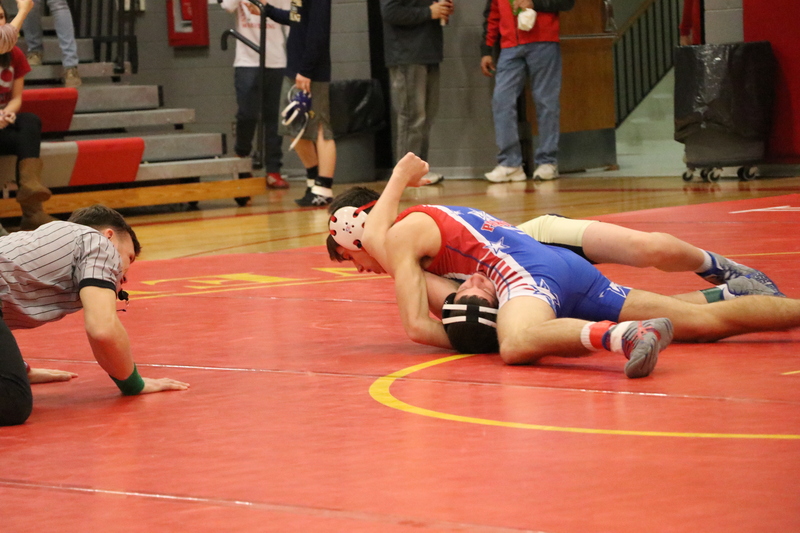 In that finals match, Caniglia showed a lot of grit refusing to release a leg as time expired to seal the victory. 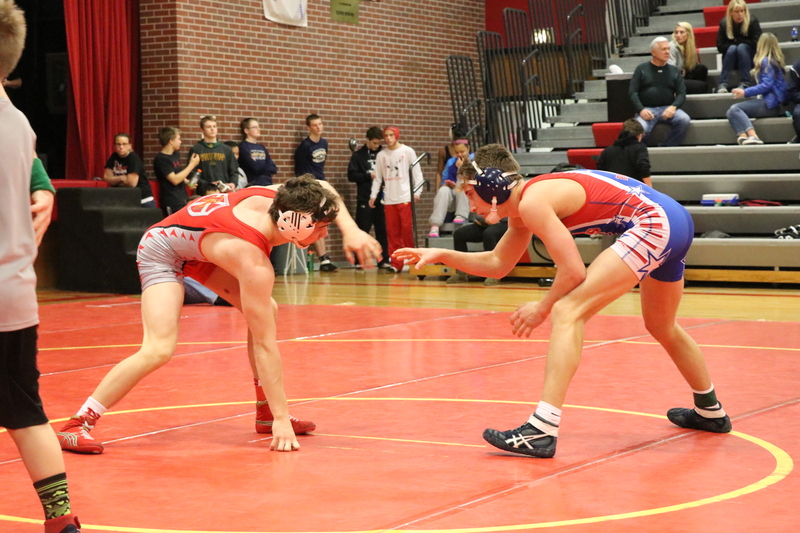 Caniglia is evidence of the depth of the Patriot roster. 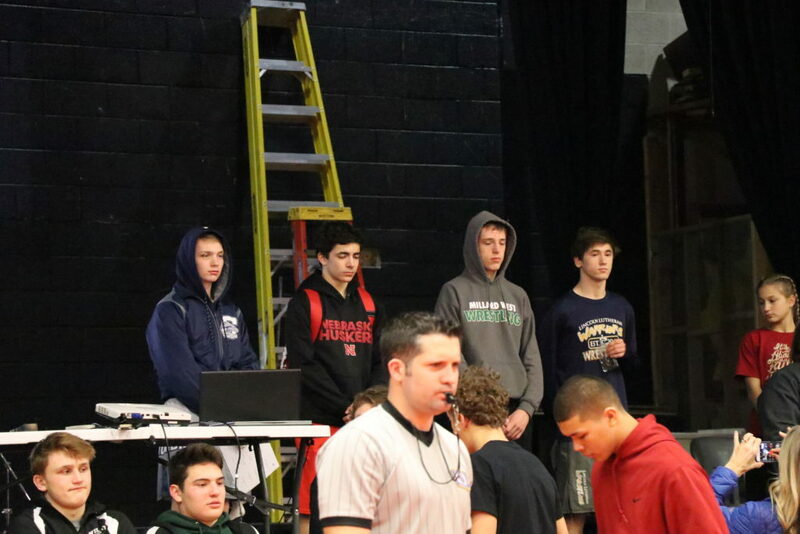 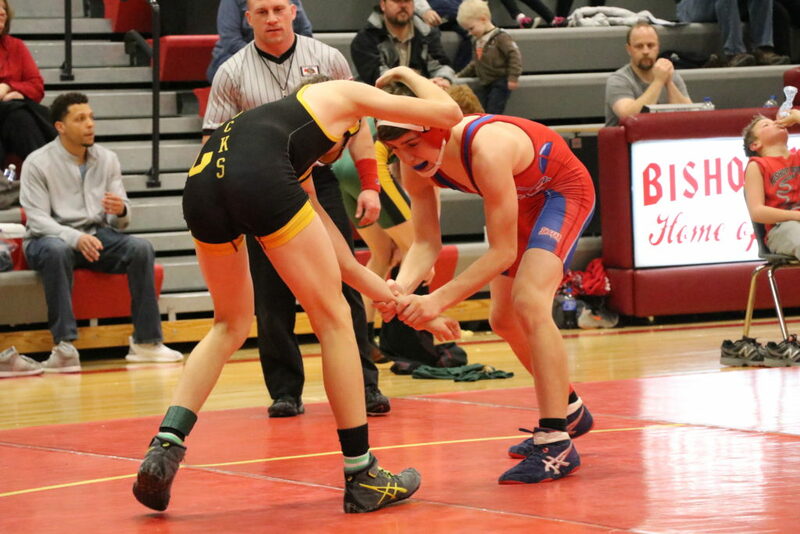 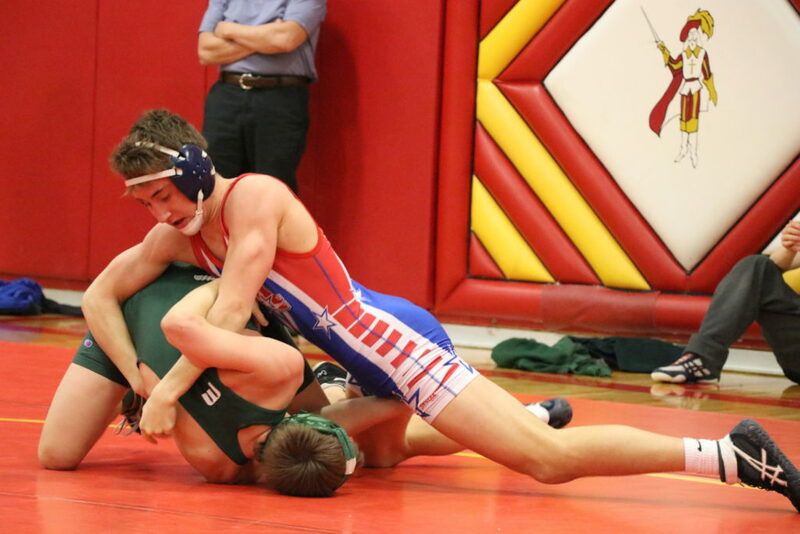 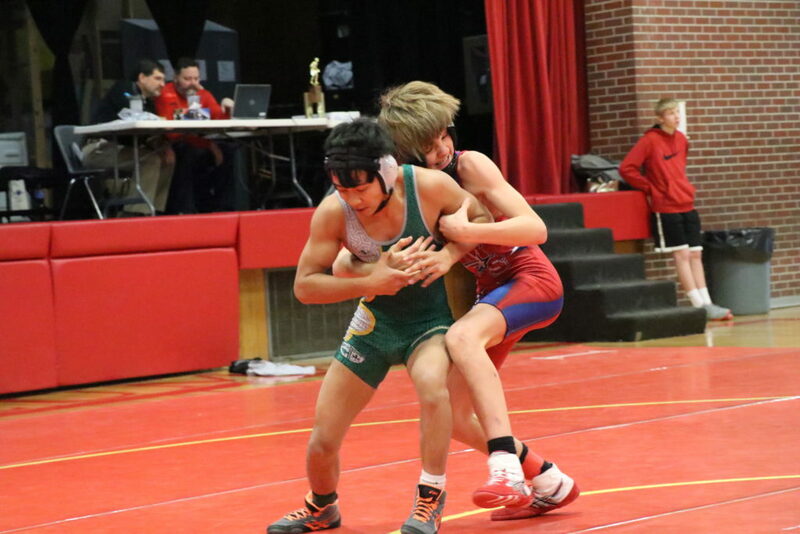 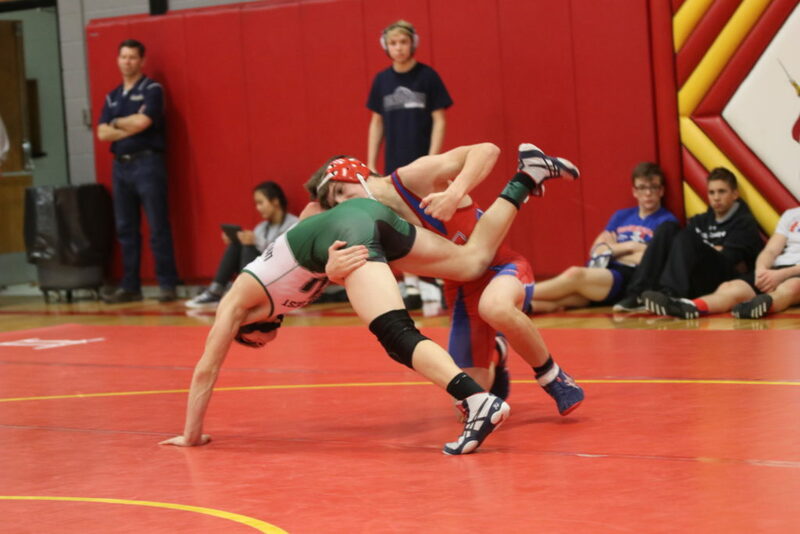 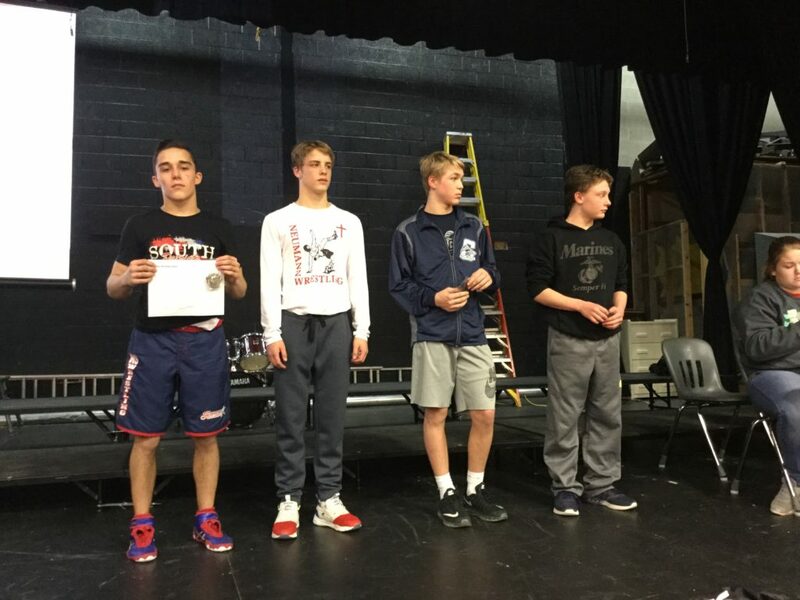 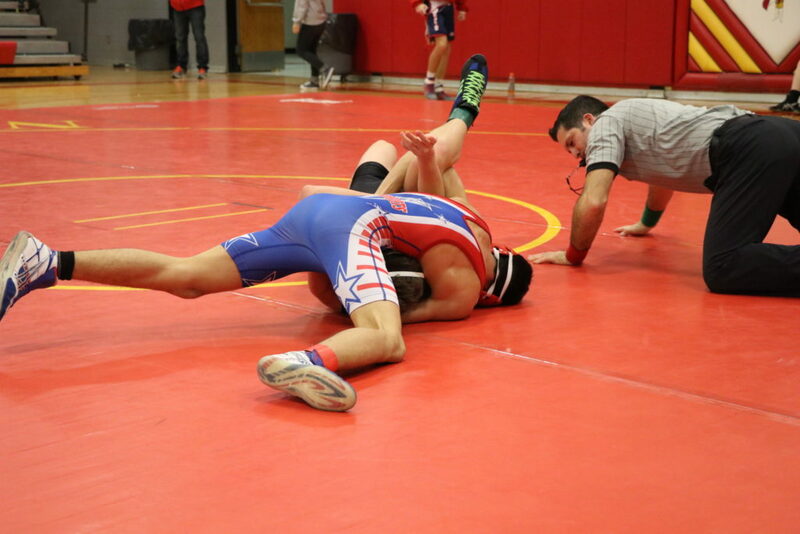 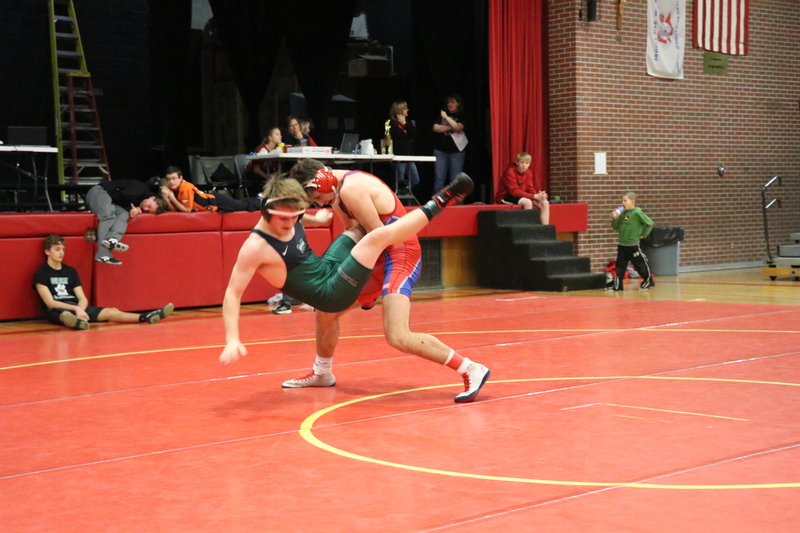 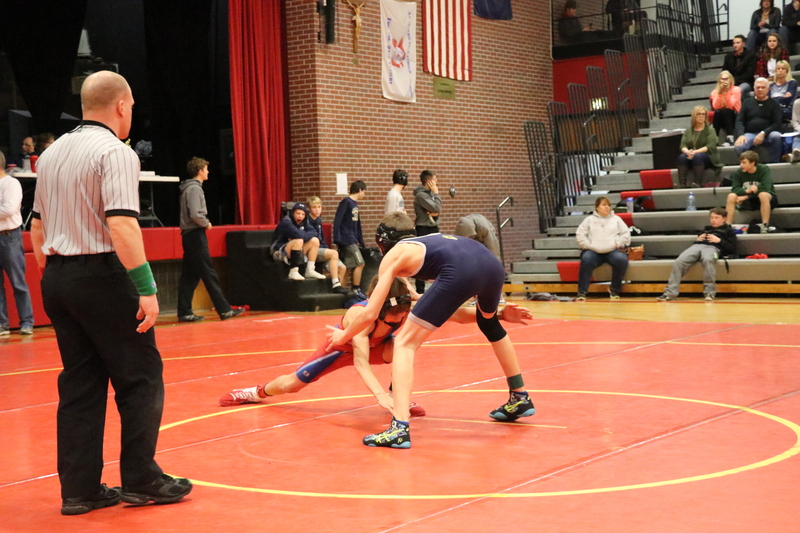 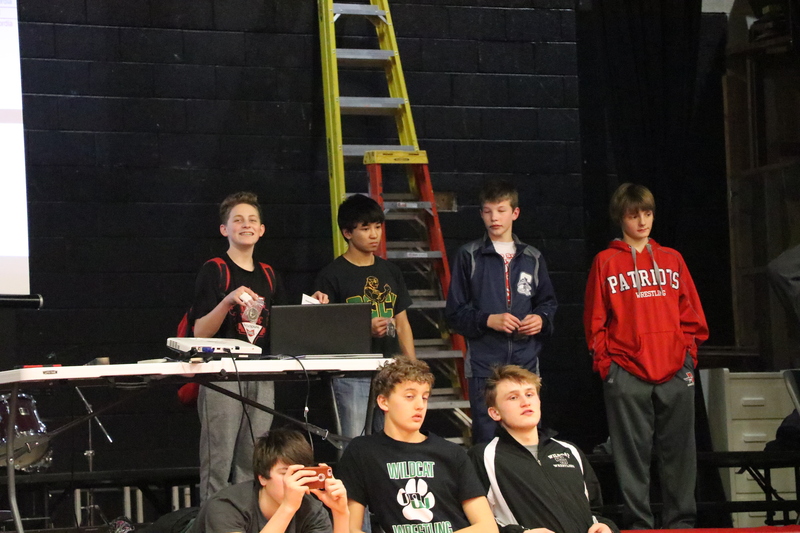 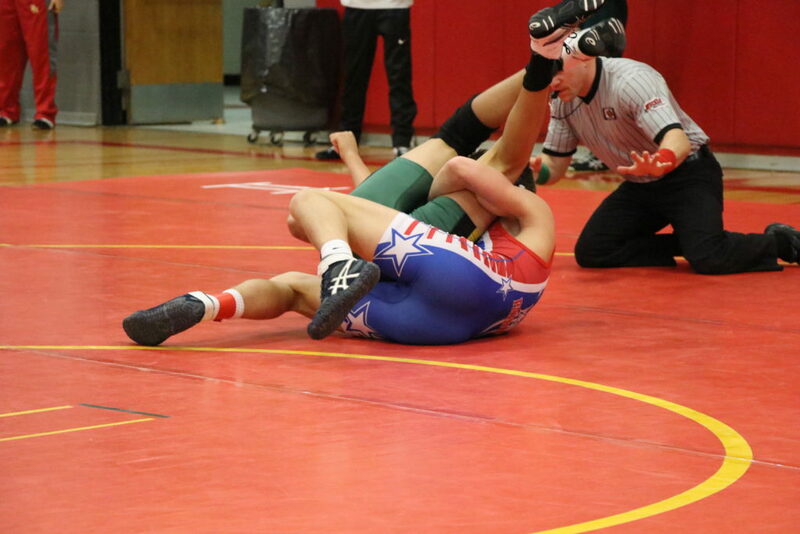 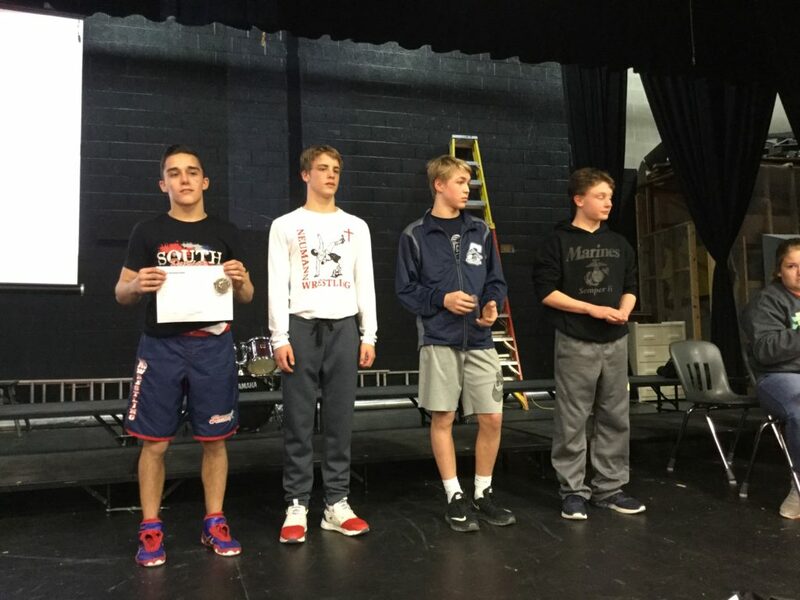 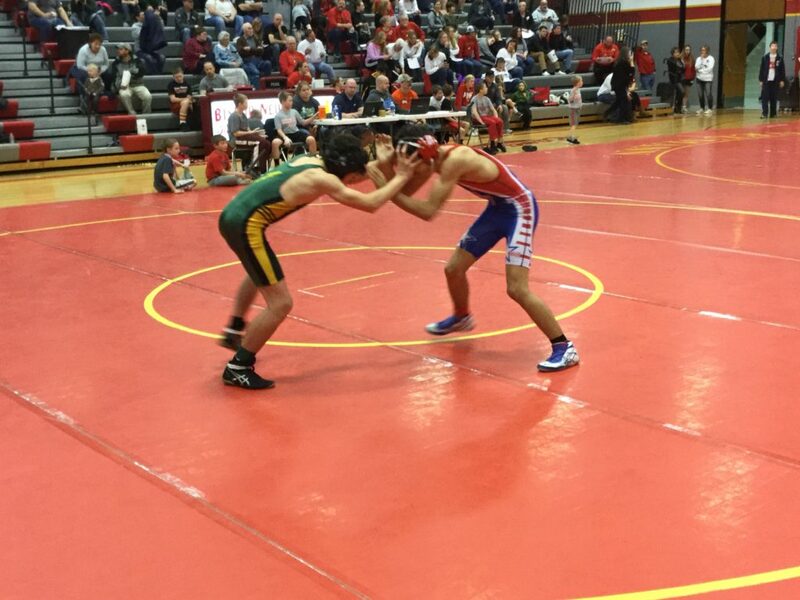 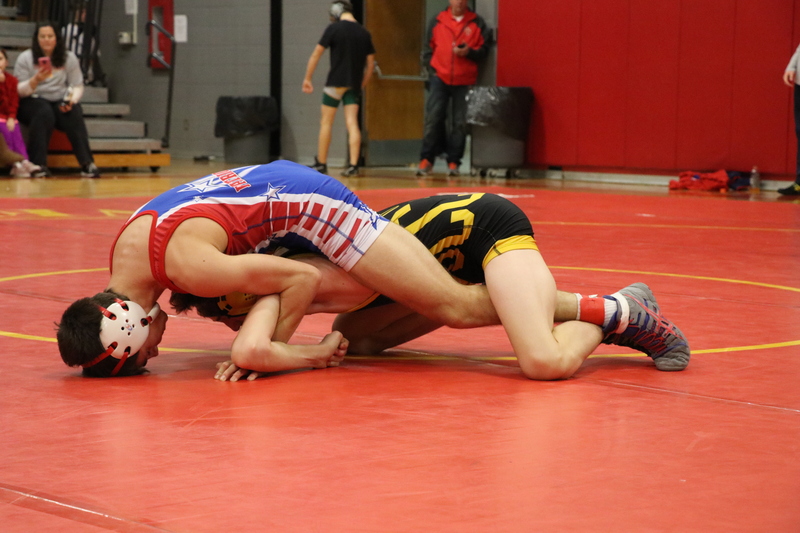 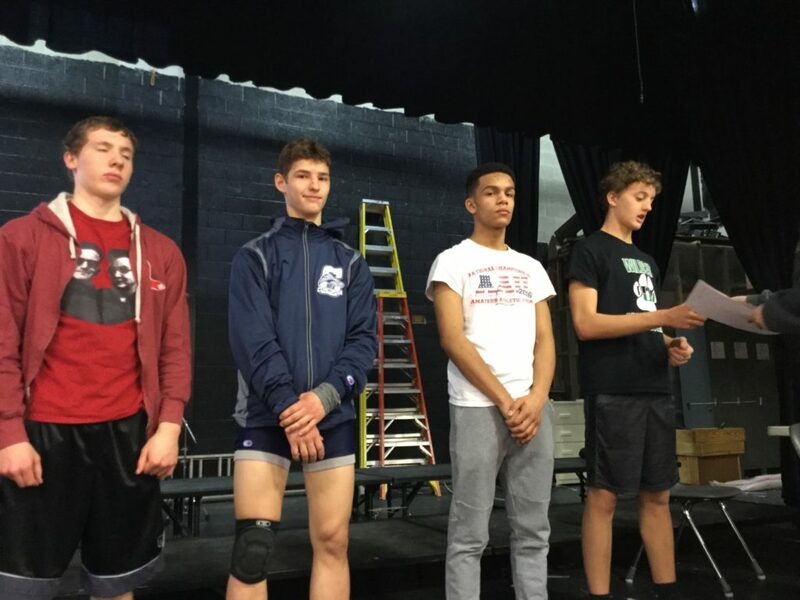 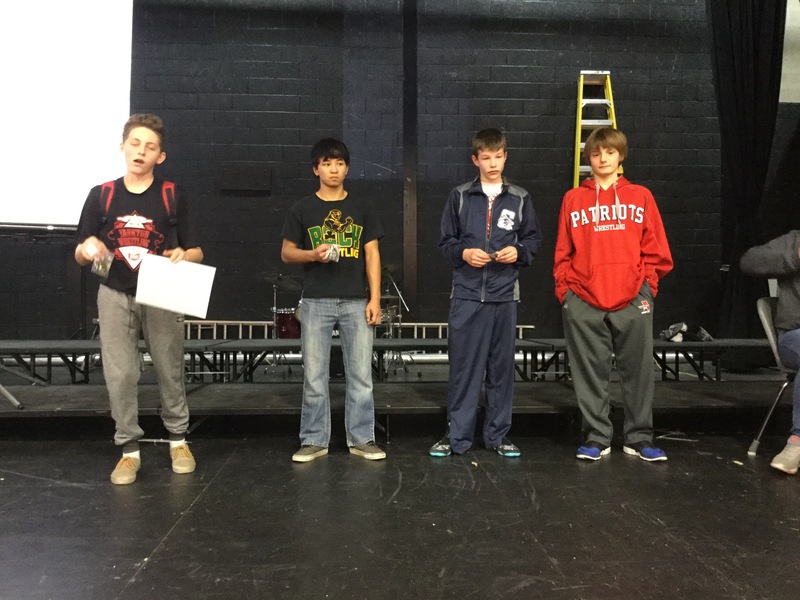 He would be JV for very many teams, but the Patriots have elite wrestlers in the varsity line-up at 126, 132, and 138. Al Cunningham had the best performance on the day going 5-0 with 4 falls and a tech fall. 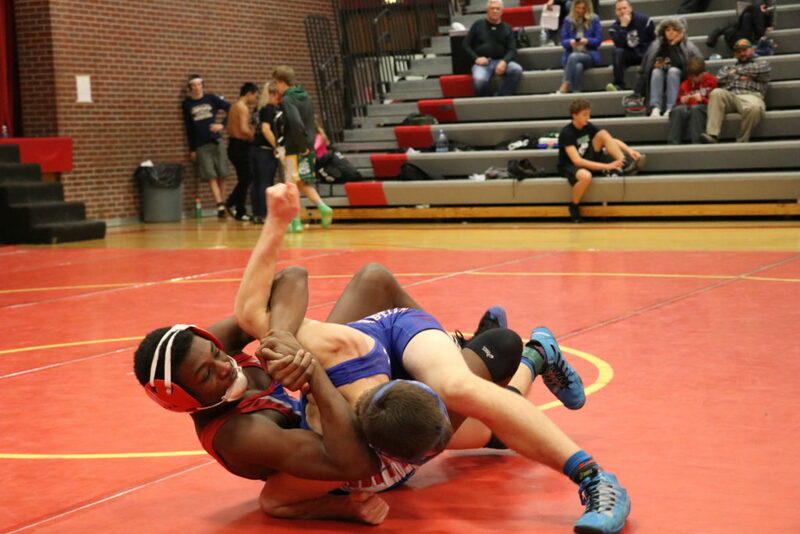 Al continues to show his athleticism with lightning quick leg attacks that he’s getting better at finishing. 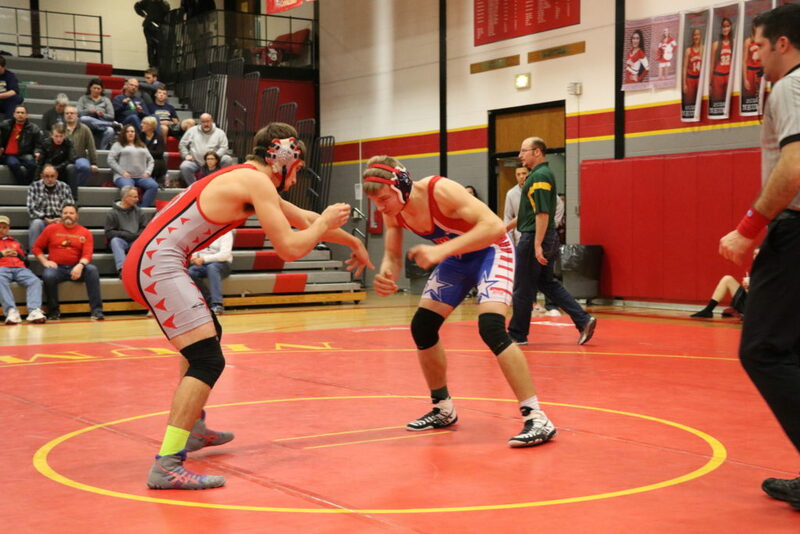 He’s had success at 145 pound weight class and now the 152 pound weight classes with a 32-6 record on the season. Gavin Peitzmeier has been on a tear since coming down the JV level after Doug Weidner gained varsity eligibility. 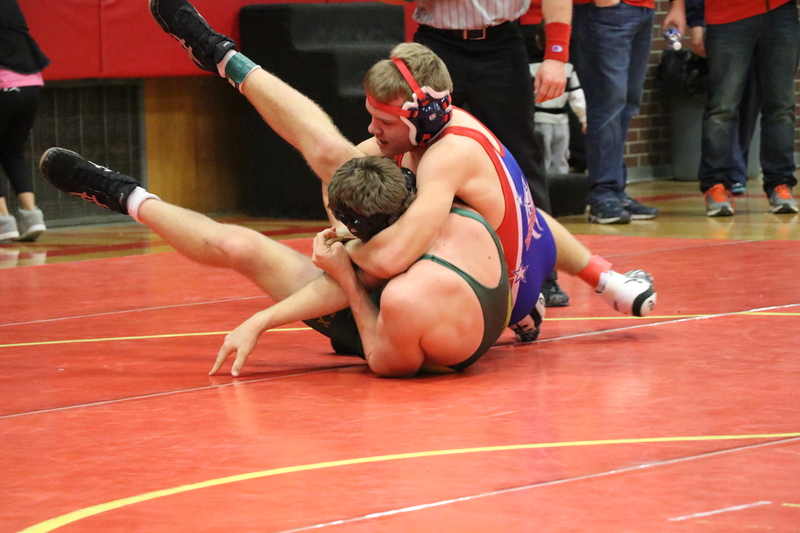 Peitzmeier showed much better finishes on his feet this tournament, and utilized a his deadly crossface cradle to record 4 pins. He also had a major decision on the day. 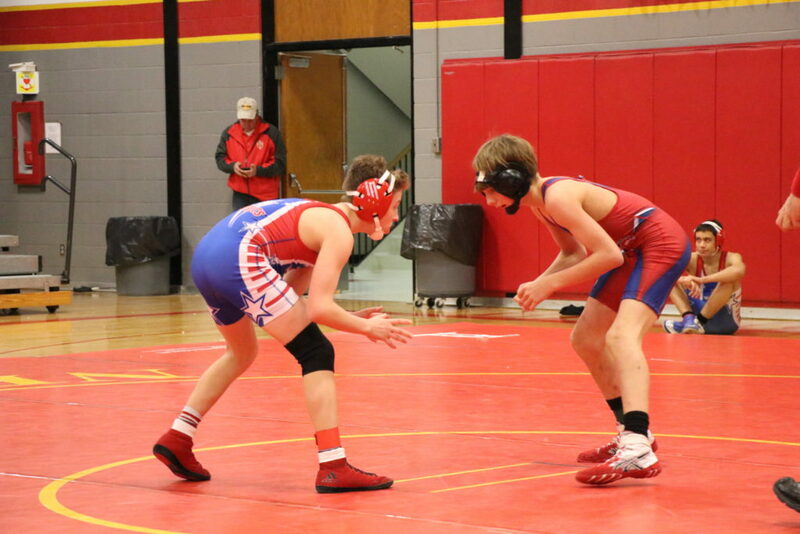 Gavin has won the last 4 tournaments he’s wrestled racking up a 22 match win streak. 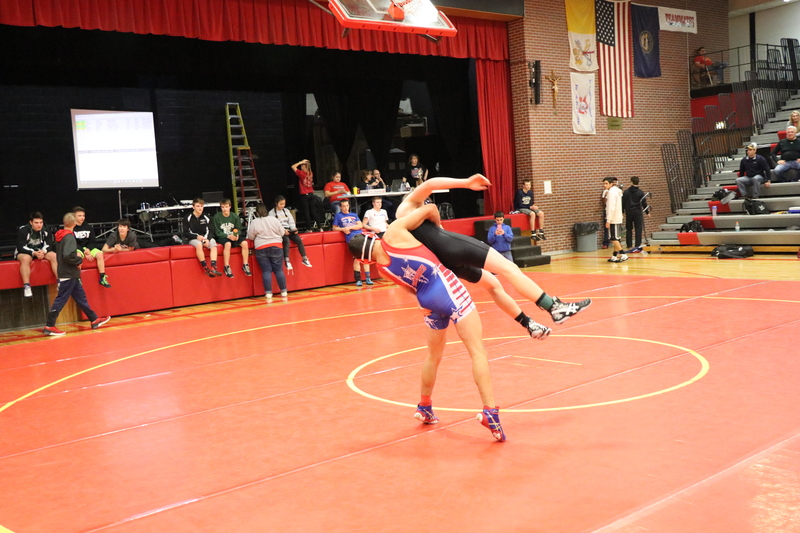 Garrett Mandolfo was a key contributor on the day as well showing off his athleticism and improving skills recording 3 pins on his way to 2nd place. 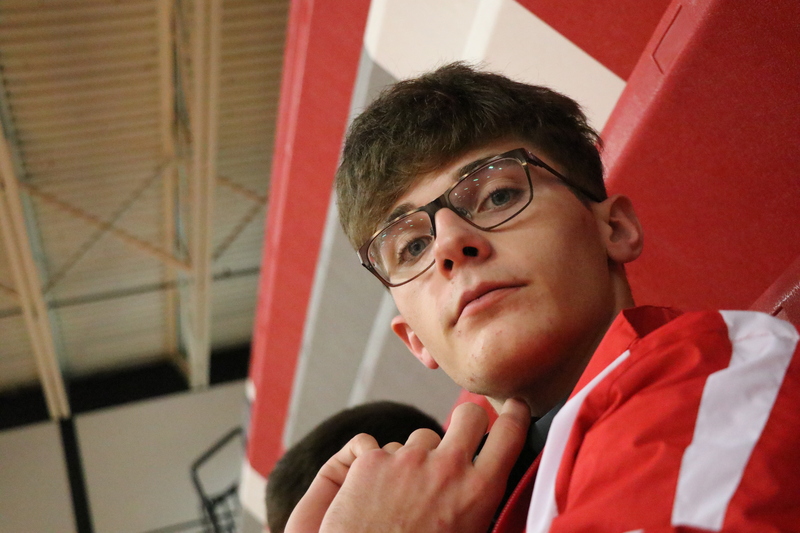 Mandolfo has been filling in for Blake Smith whose return date is unknown. 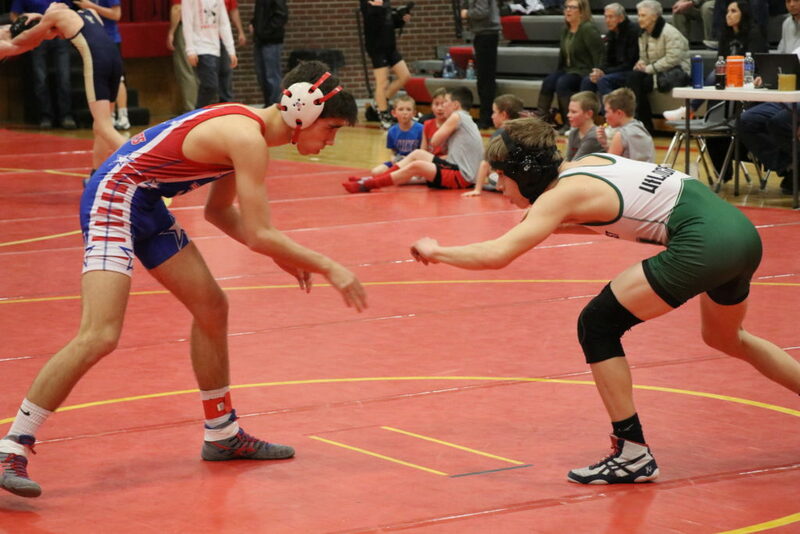 The higher level competition has really started to get him firing on all cylinders. 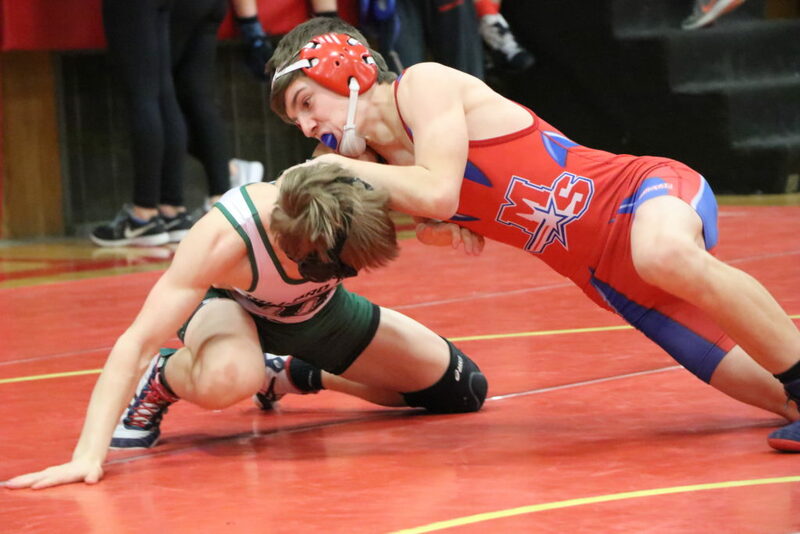 Garett Svoboda had a good day, but then fell short in the finals against a returning state qualifier. 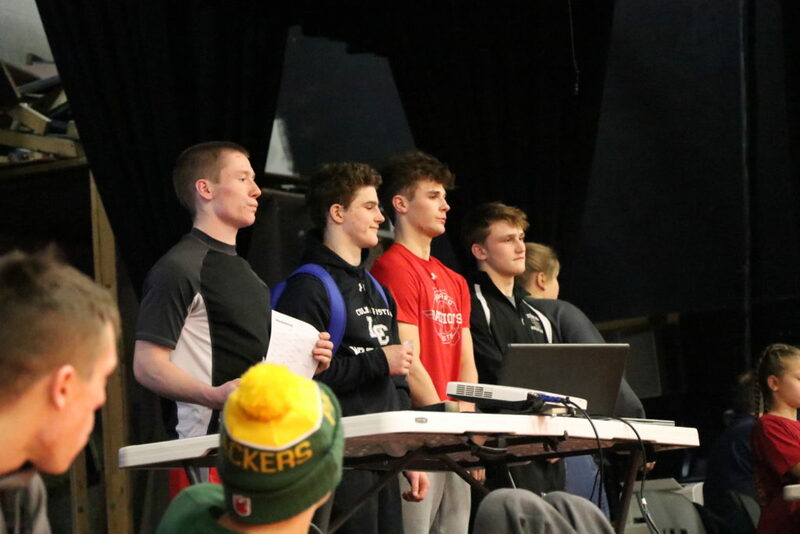 More importantly, Svoboda embraced his leadership role on the day helping his fellow teammates as the Patriots only had one coach out there on the day. 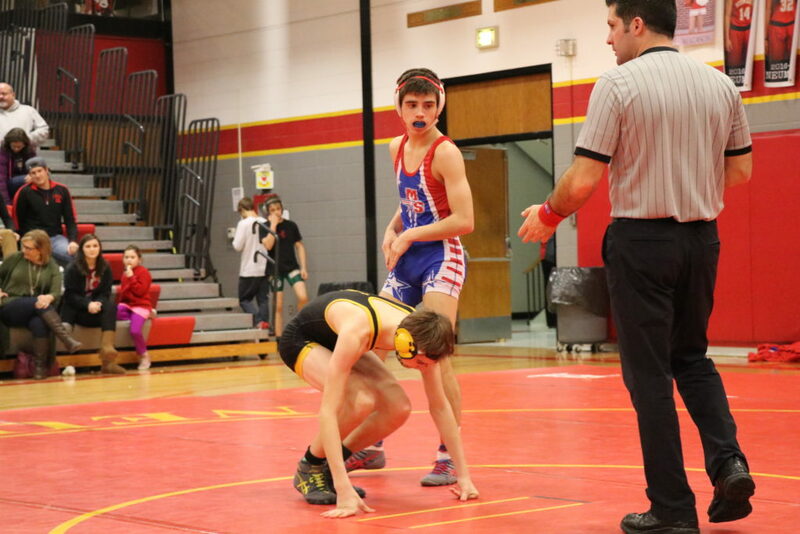 Svoboda, who has extensive varsity experience, will rebound from his loss and use it as motivation to make technical changes which is really what is important for him this season. 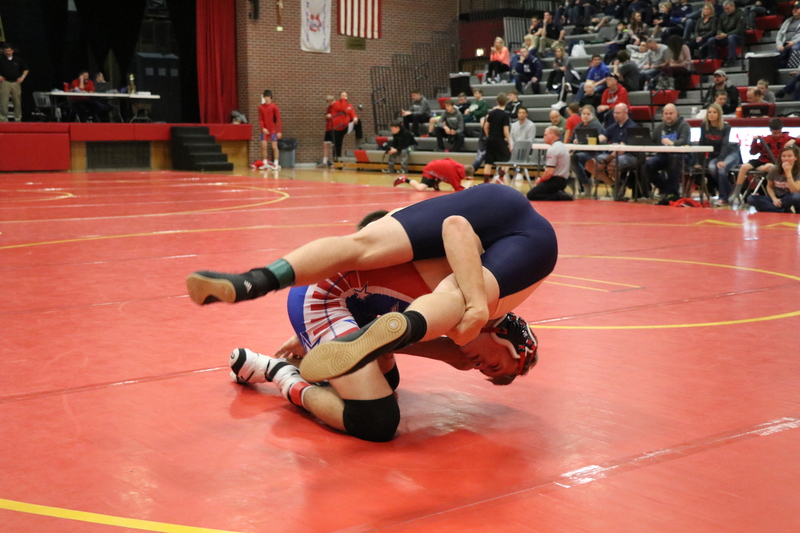 His opponents style was the perfect elixir to Svoboda’s lightning quick low single, so he will need to continue to work on adding set ups and developing other go to moves which will make him a threat next season. 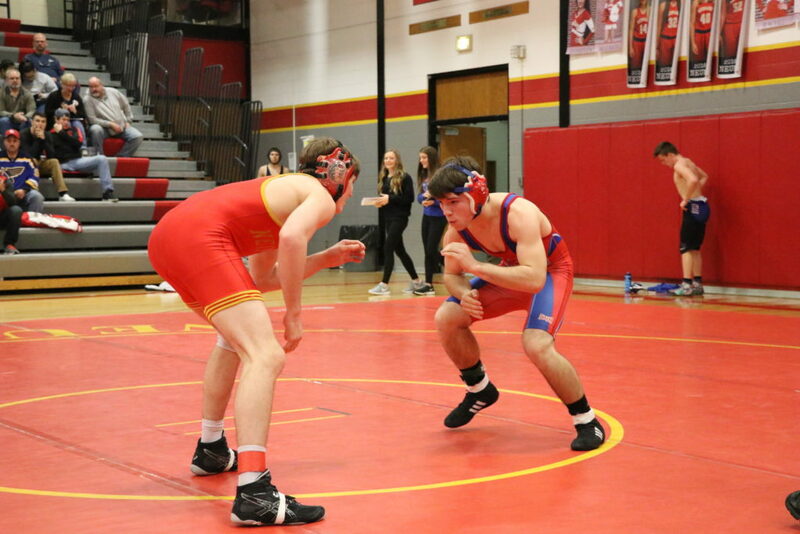 Grossman was a late addition to the line-up on Friday evening due to Isaiah Jackson missing the meet for a family obligation, Dalton Frederick out for an unknown reason, and Cade Sortino needing time for an injury to heal up so Sistek called Grossman into action. 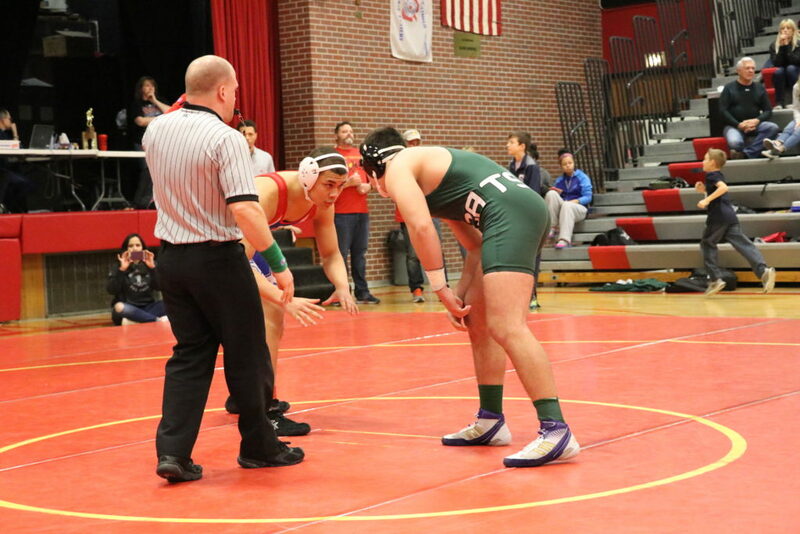 Grossman actually had to feast the night before to be eligible to wrestle in the 170 pound weight class because he’s normally a 152 pound wrestler. 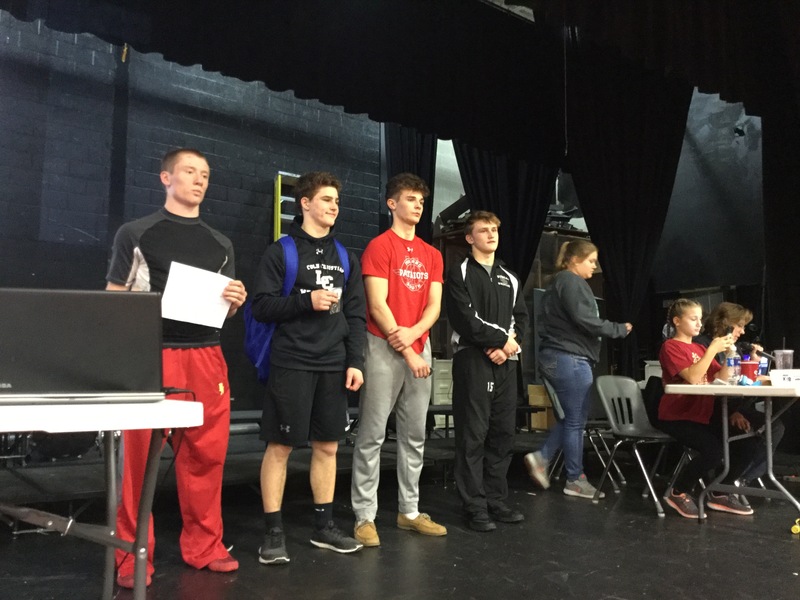 Wrestlers can only move up one extra weight class which means he needed to make 154.1 in order to be eligible which he accomplished tipping the scales at 156.9 so he was giving up 15 pounds to some of his opponents. 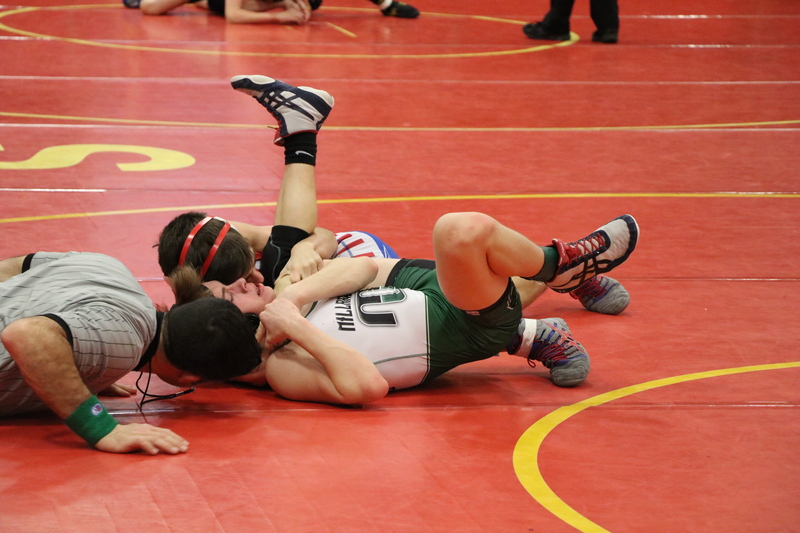 Grossman had a rough first match against the top seed and eventual champion, but came out in his second match on fire picking up a few takedowns and near fall points to earn a 10-5 lead going into the 3rd period where he gassed out because he wasn’t used to wrestling 6 minute matches and ended up giving up a pin. 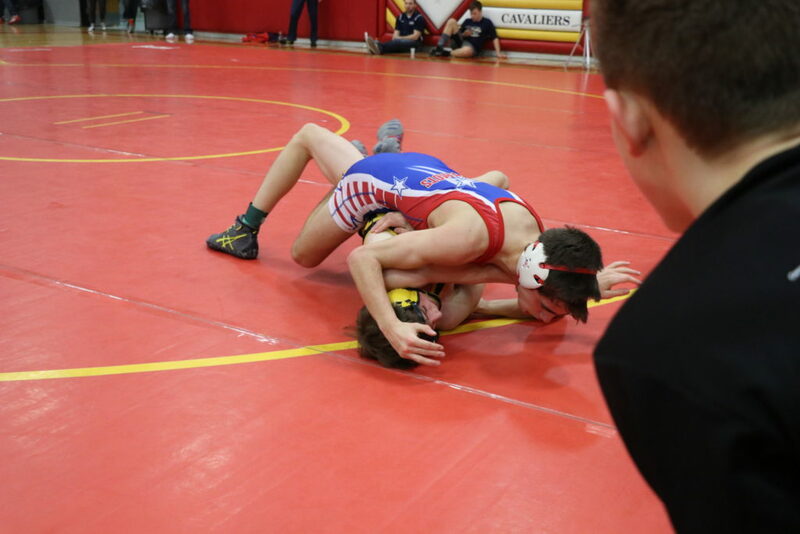 Grossman was challenged by coach Sistek to pick up his game and he then rose to the challenge collecting 2 pins on his way to 5th place. 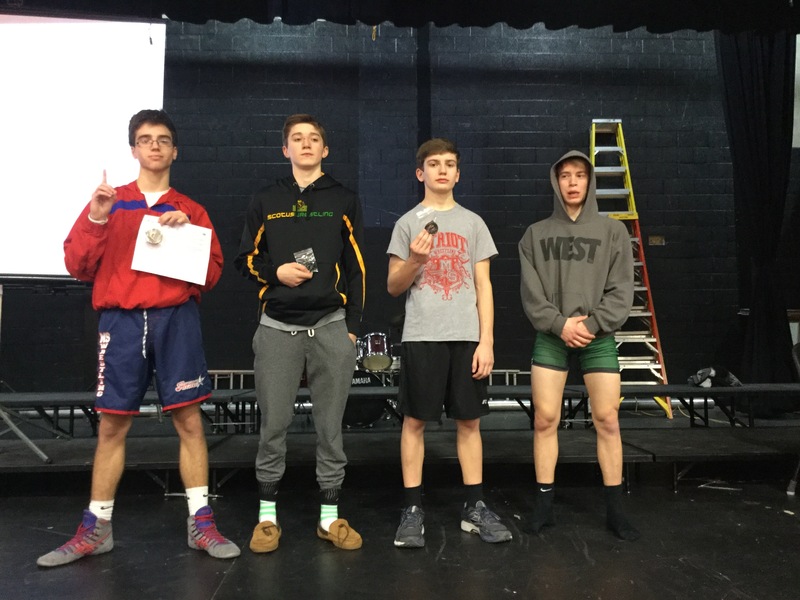 Seth Rakes came in 3rd at the 145 pound weight class. 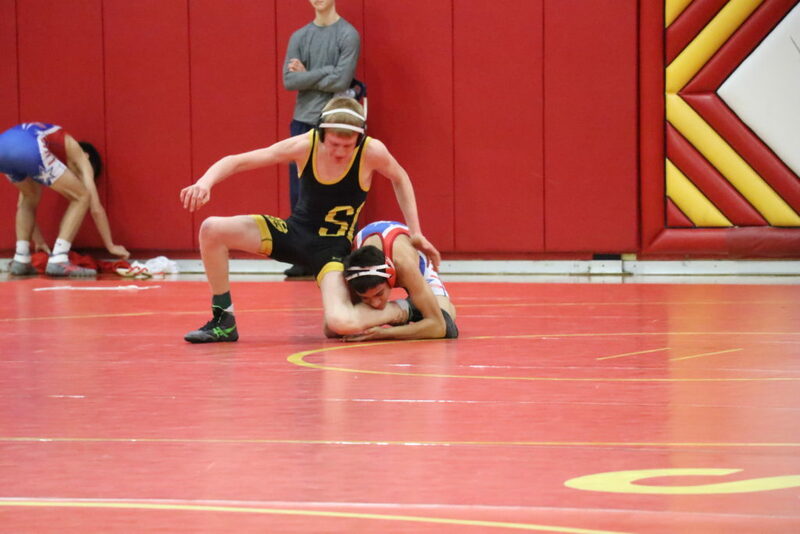 Jeremiah Sistek came in 3rd at 120 pounds getting caught in a spladle that he will learn how to defend. Chris Wortmann also came in 3rd place as well at the 160 pound weight class. Austin Sloger placed 4th at 106. 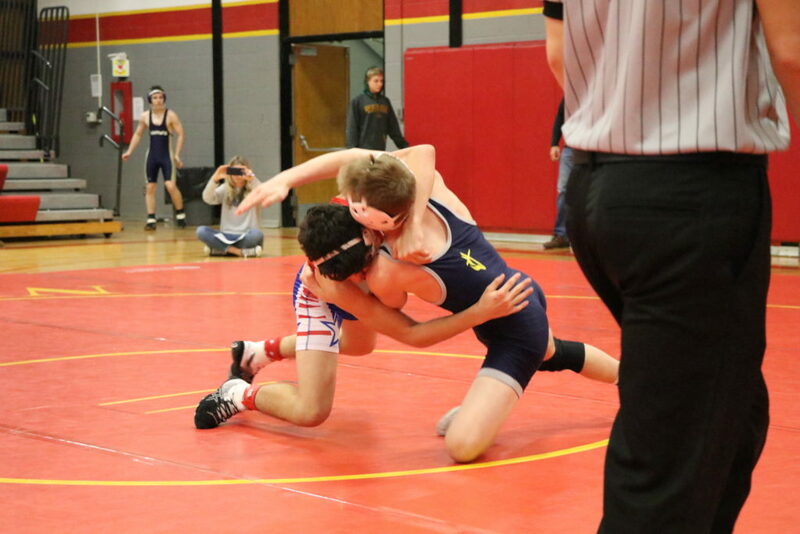 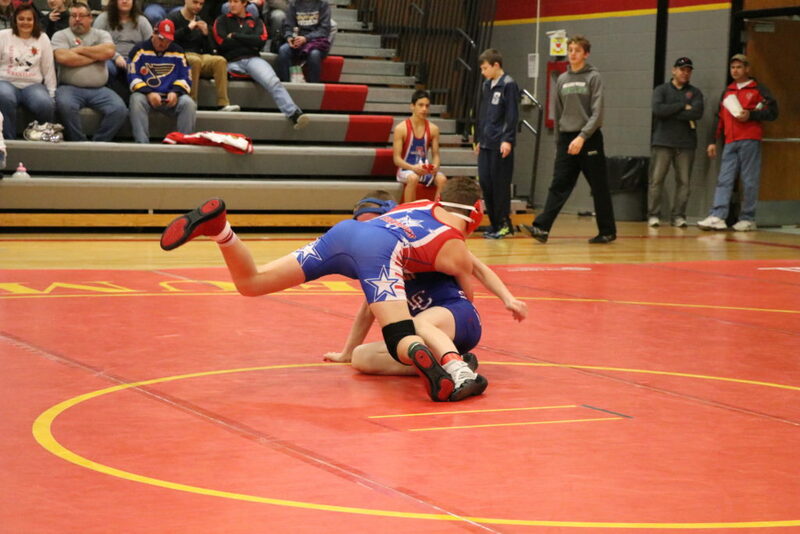 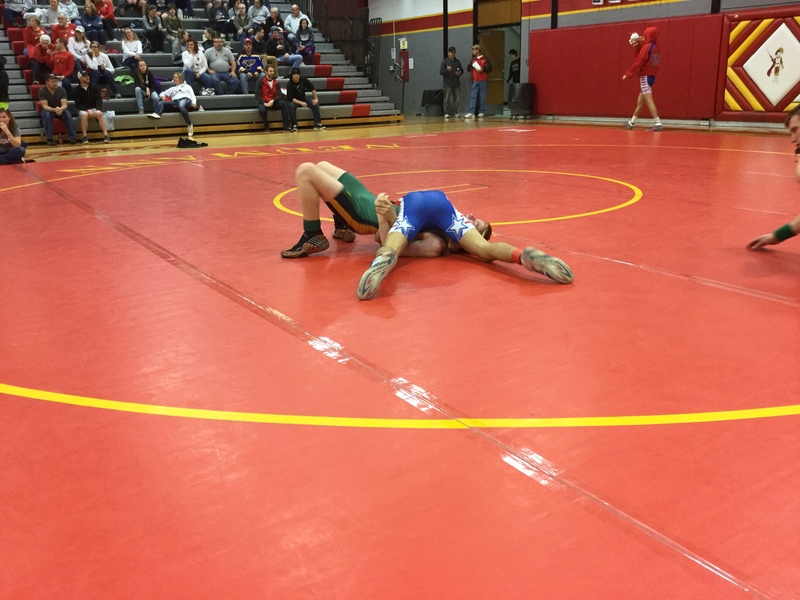 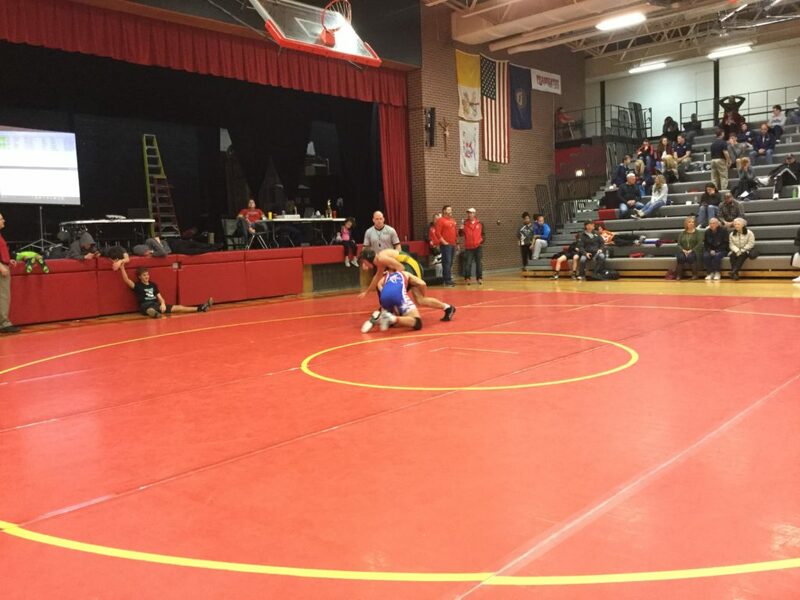 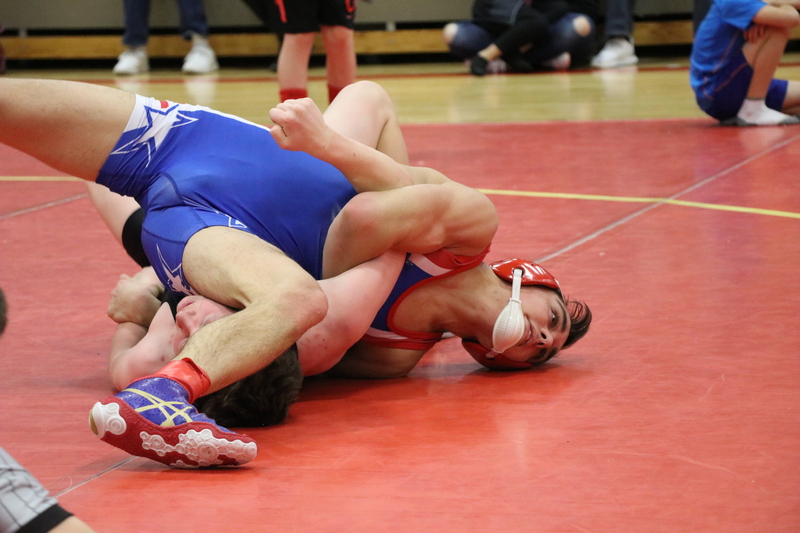 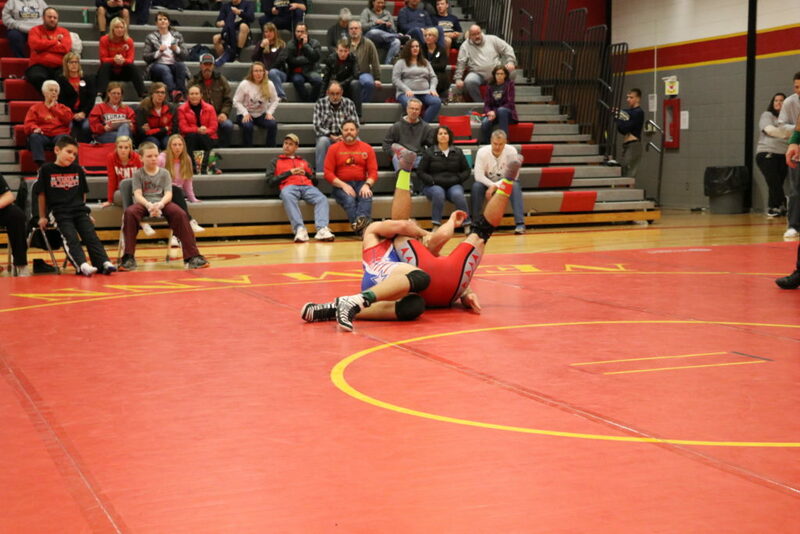 106 – Dominic DeLoa (30-8) placed 1st and scored 21.00 team points. 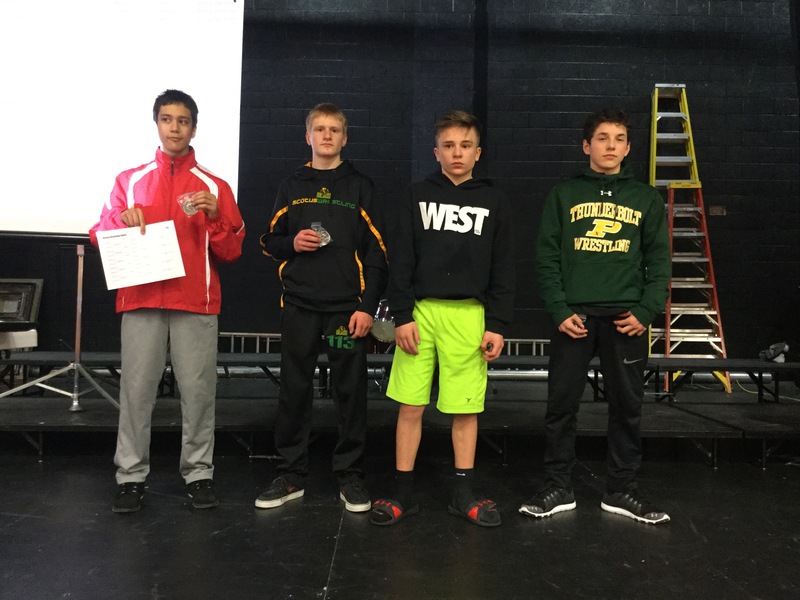 106 – Austin Sloger (17-14) placed 4th. 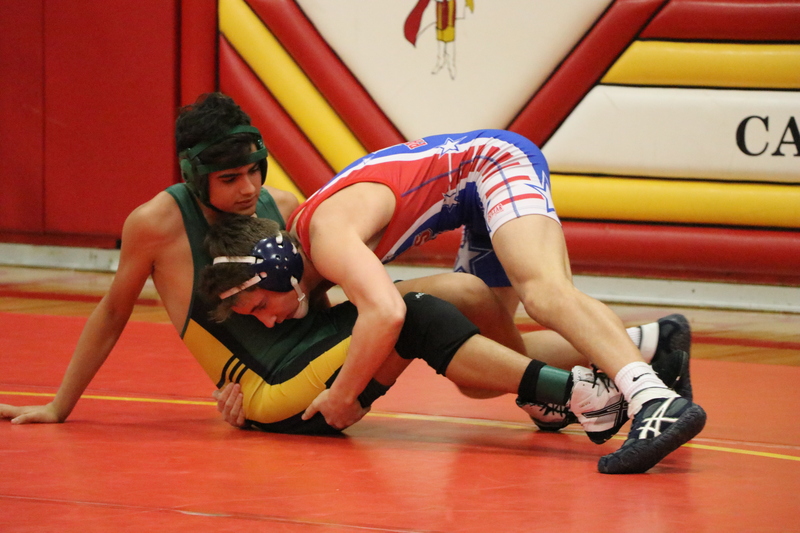 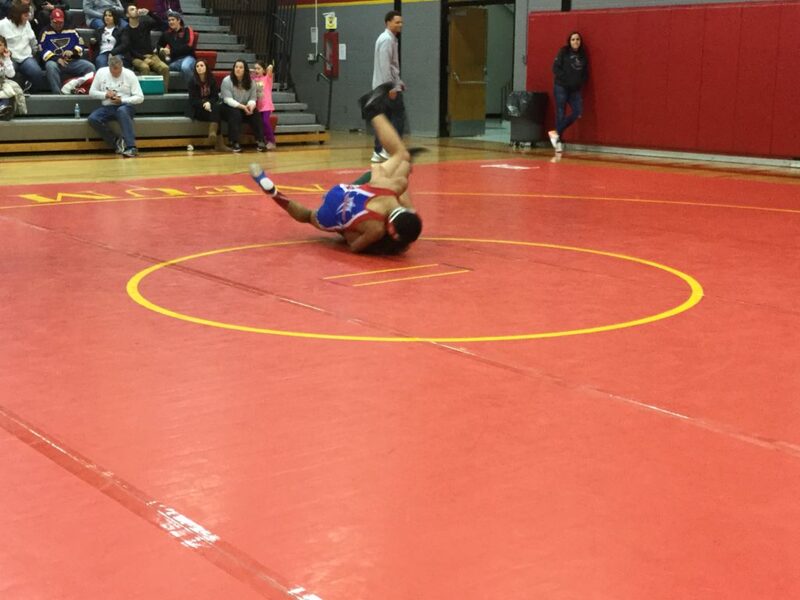 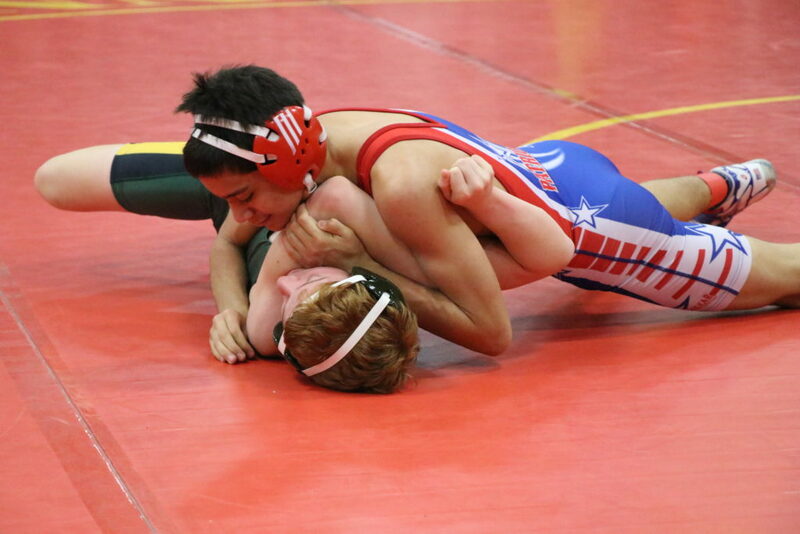 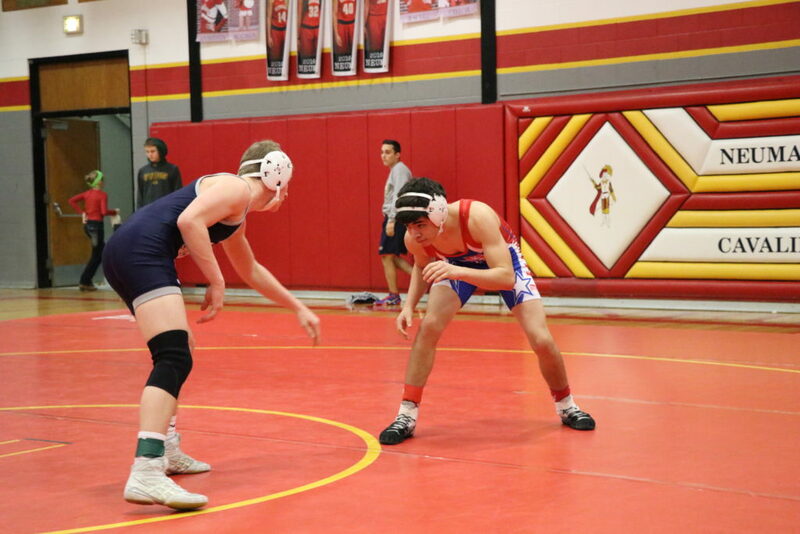 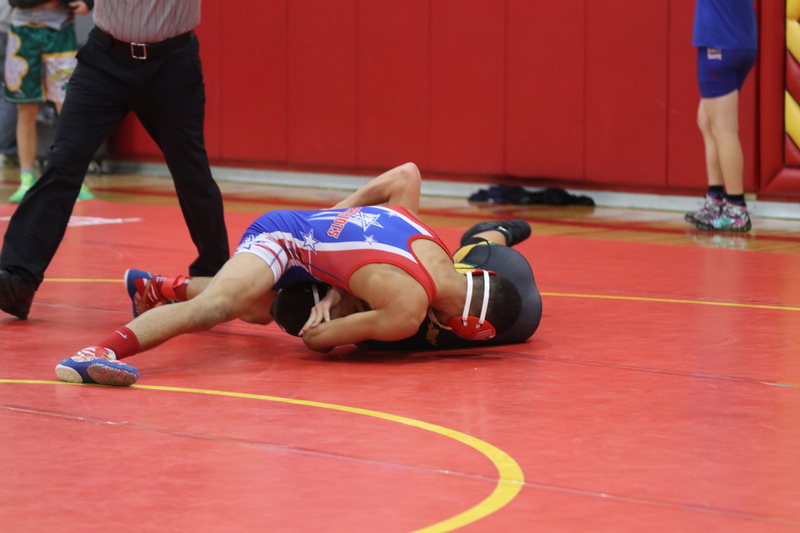 113 – Garrett Carbullido (31-3) placed 1st and scored 22.00 team points. 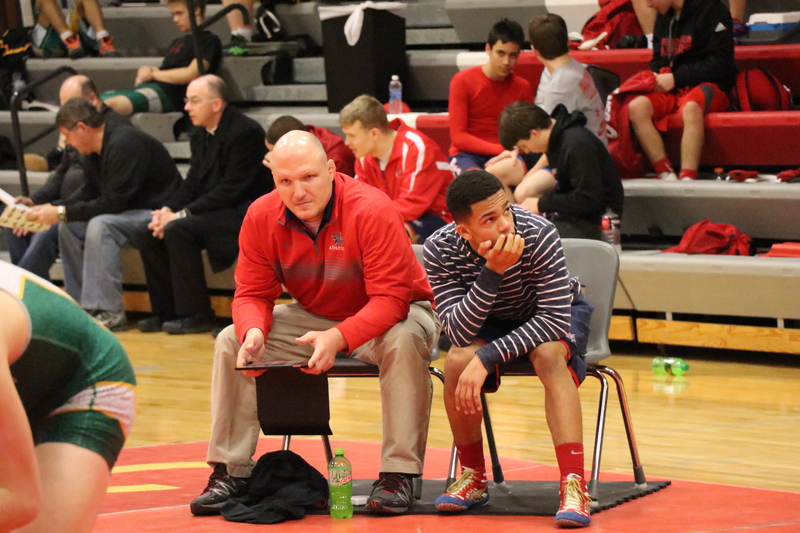 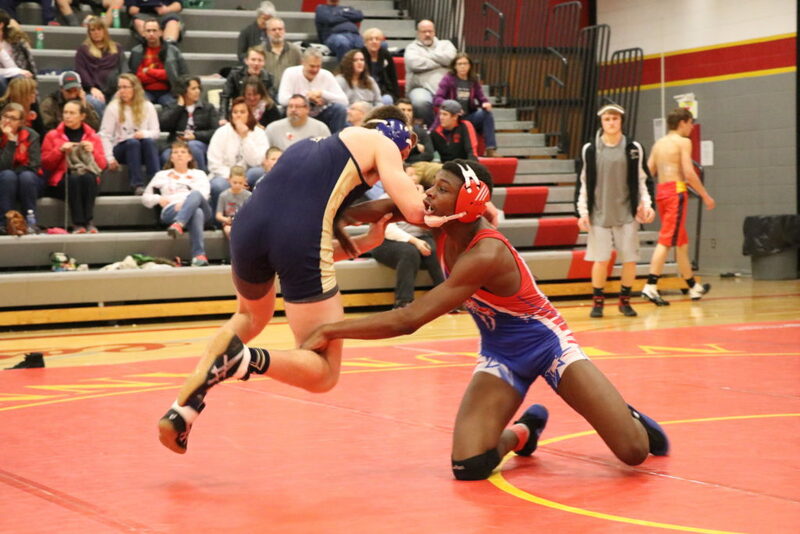 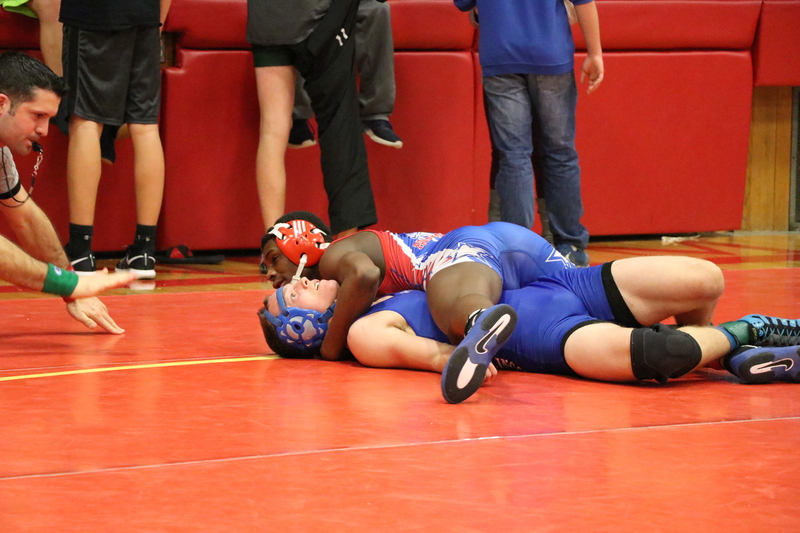 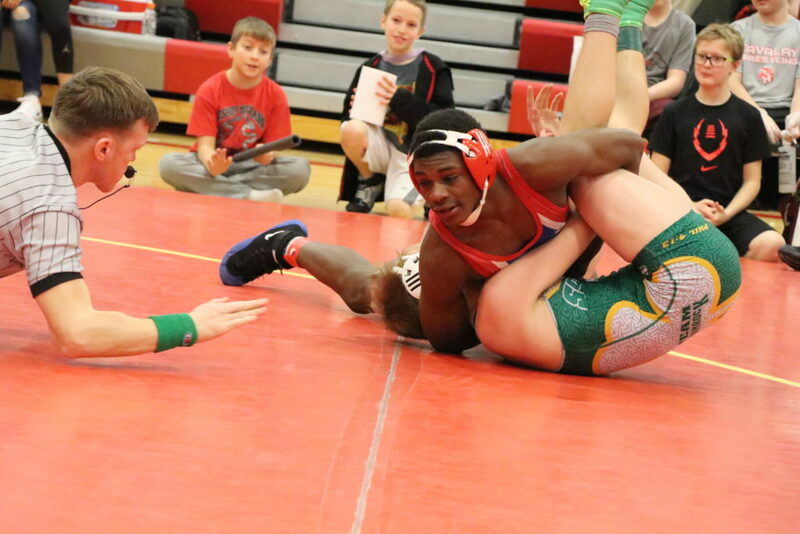 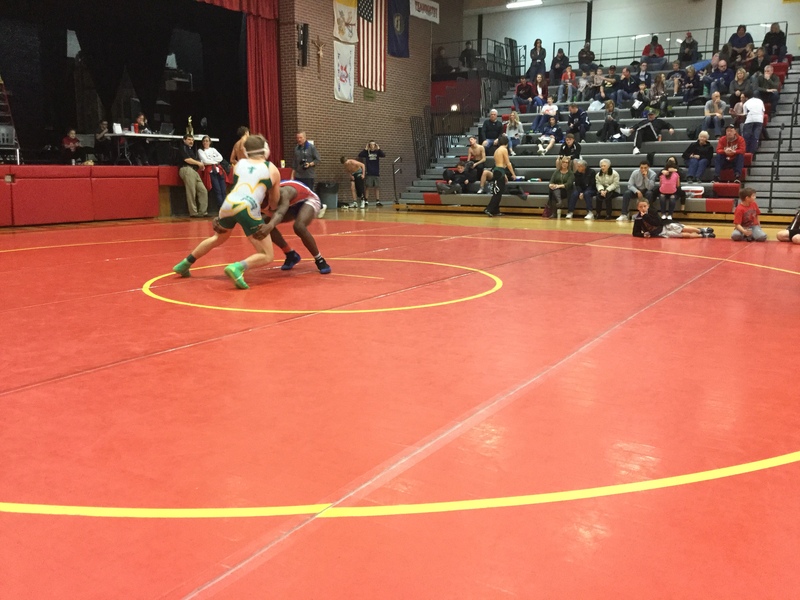 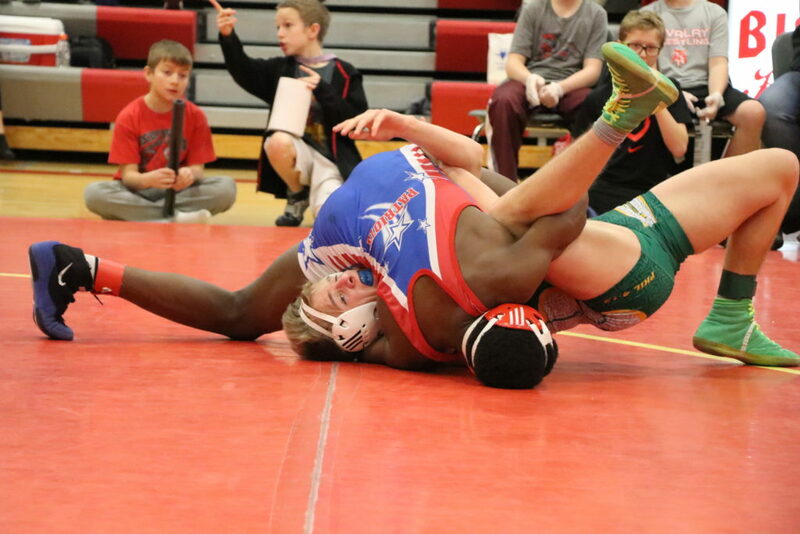 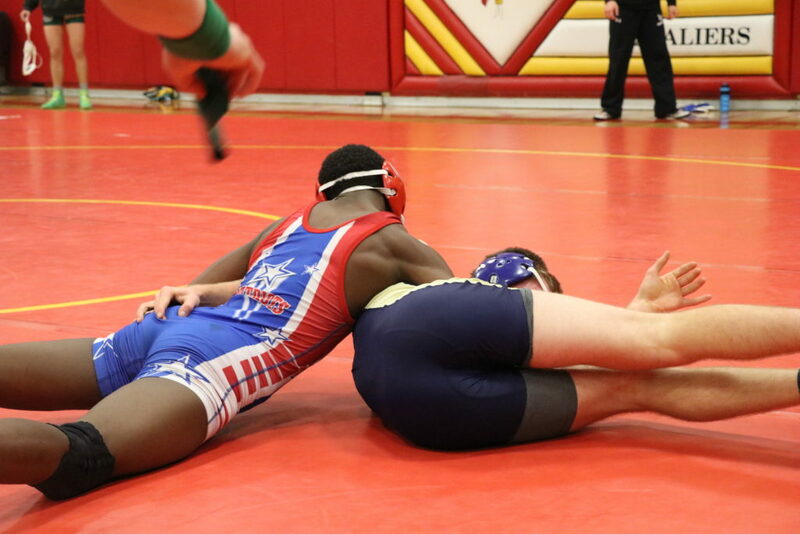 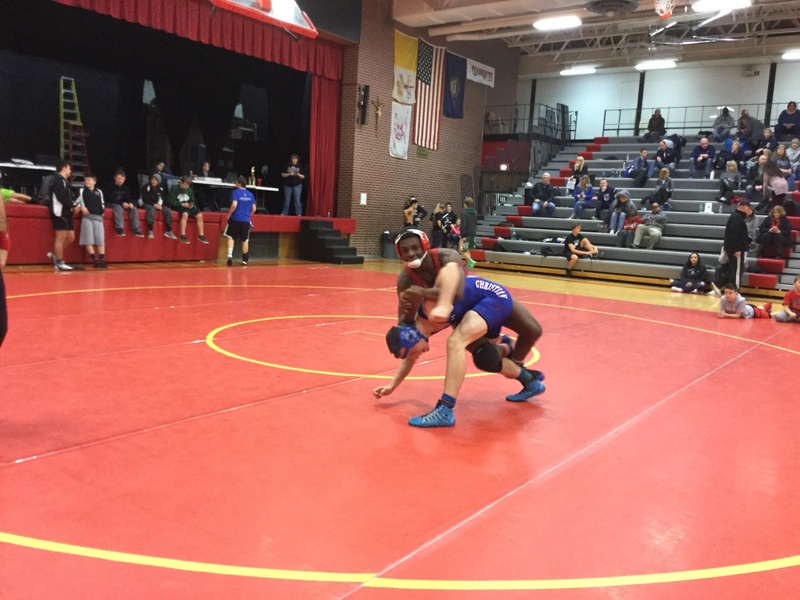 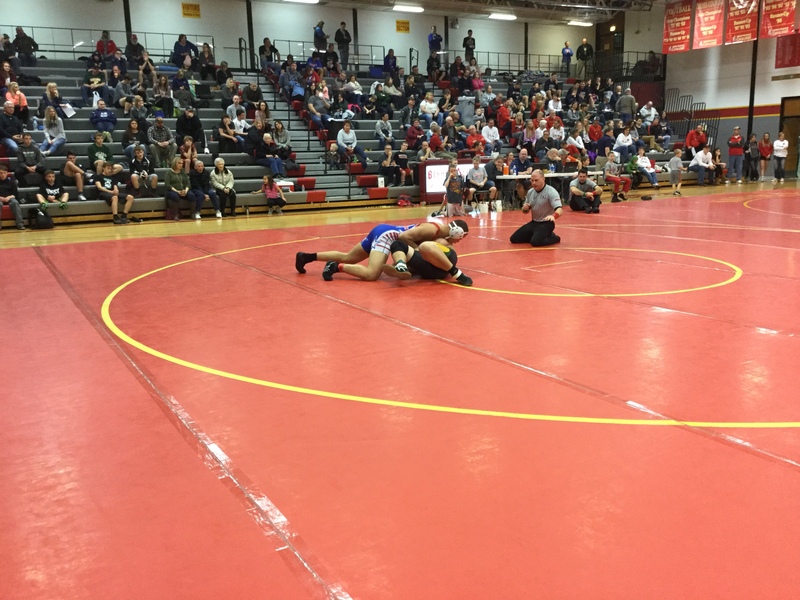 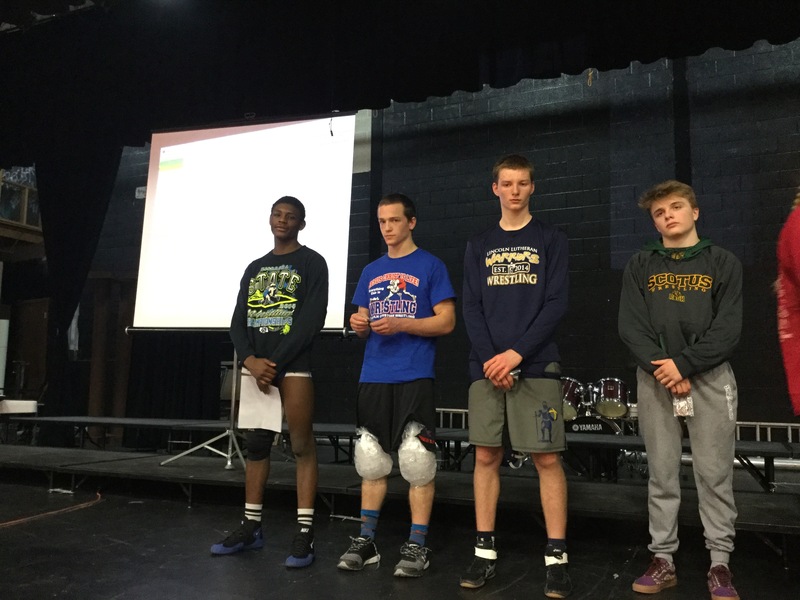 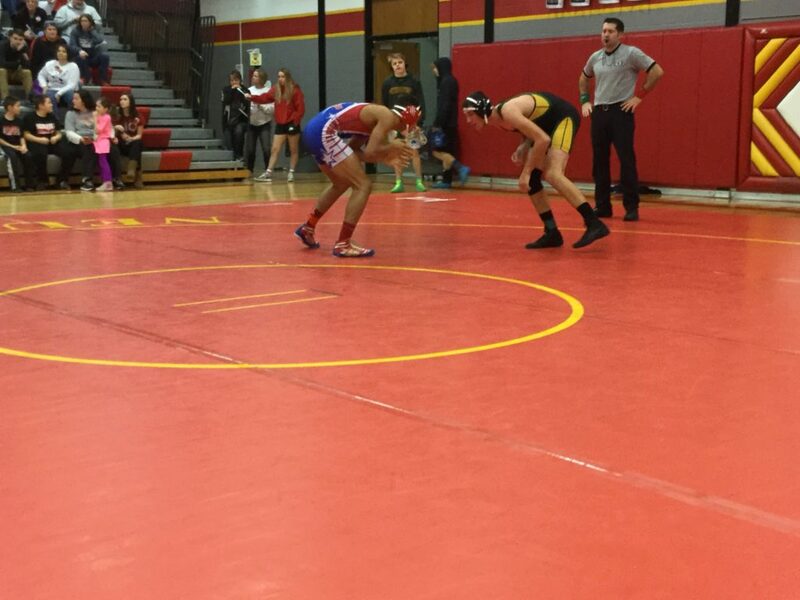 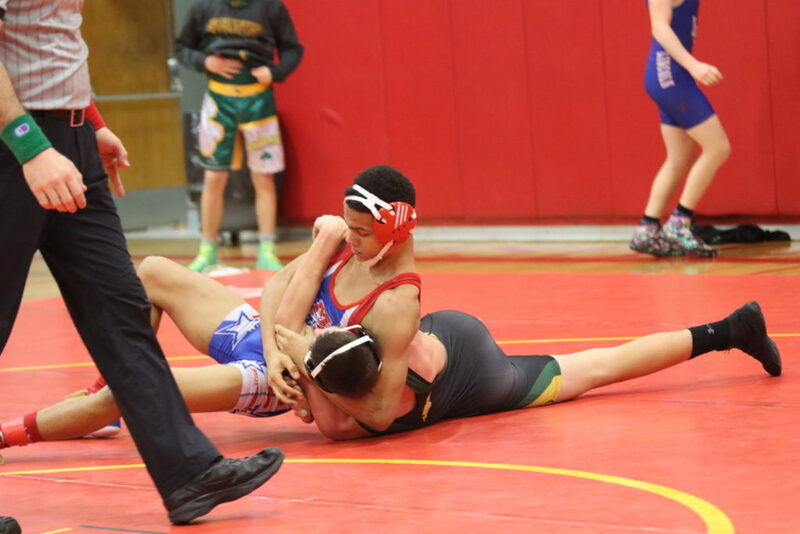 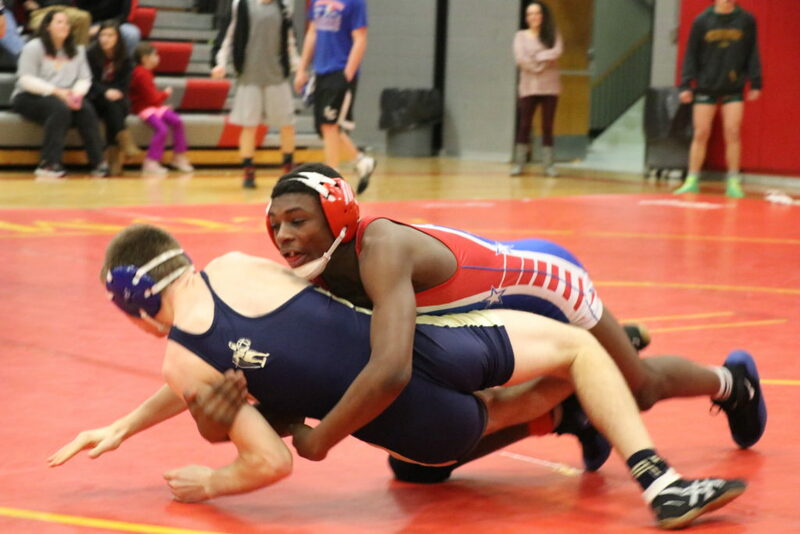 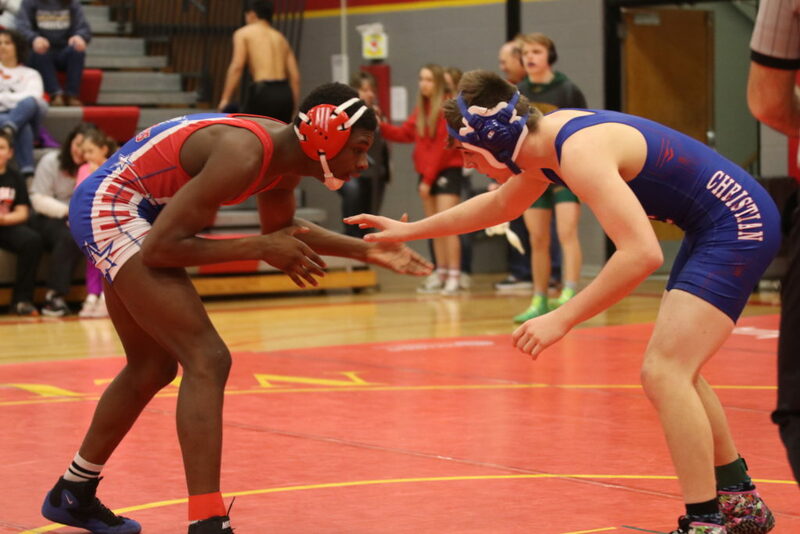 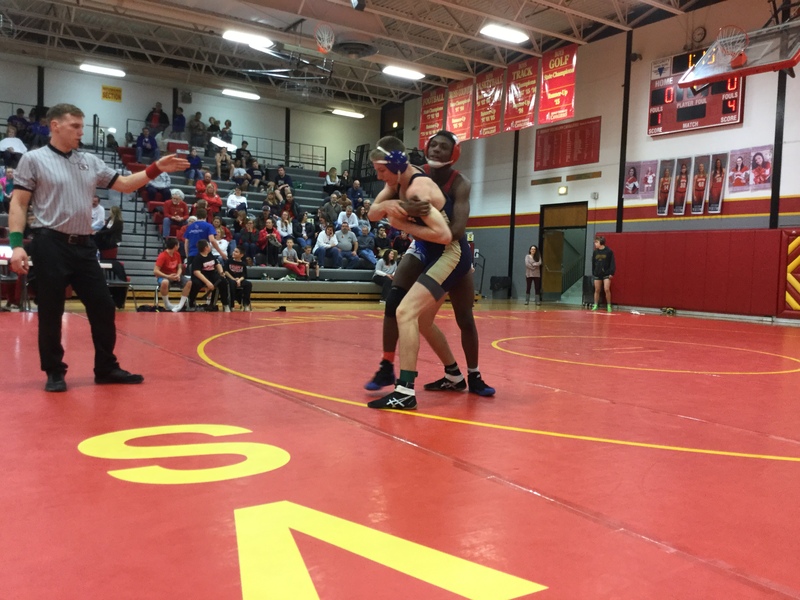 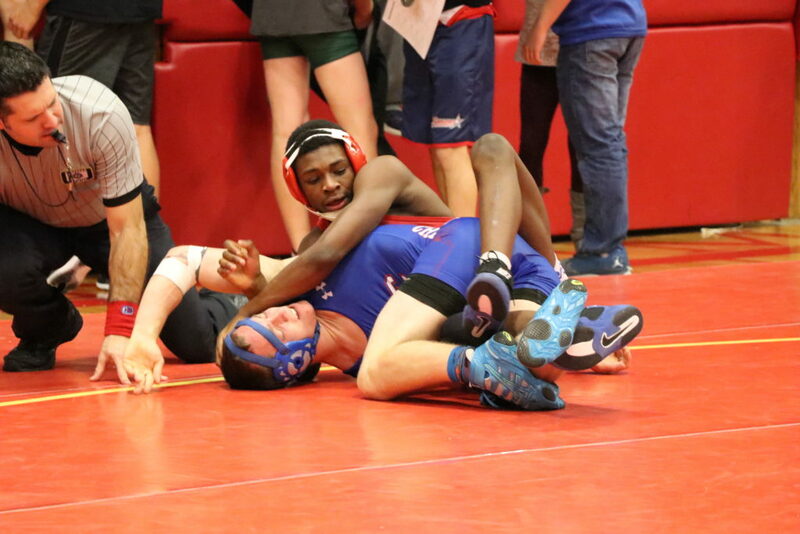 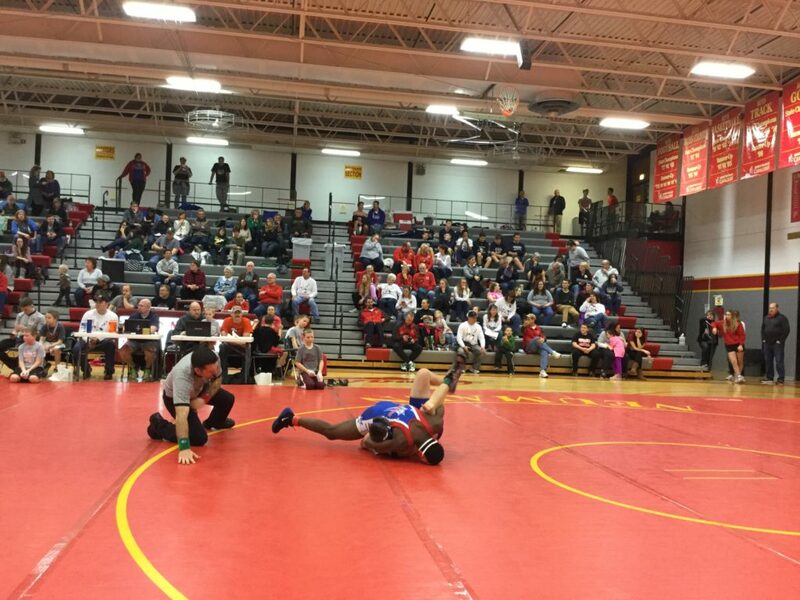 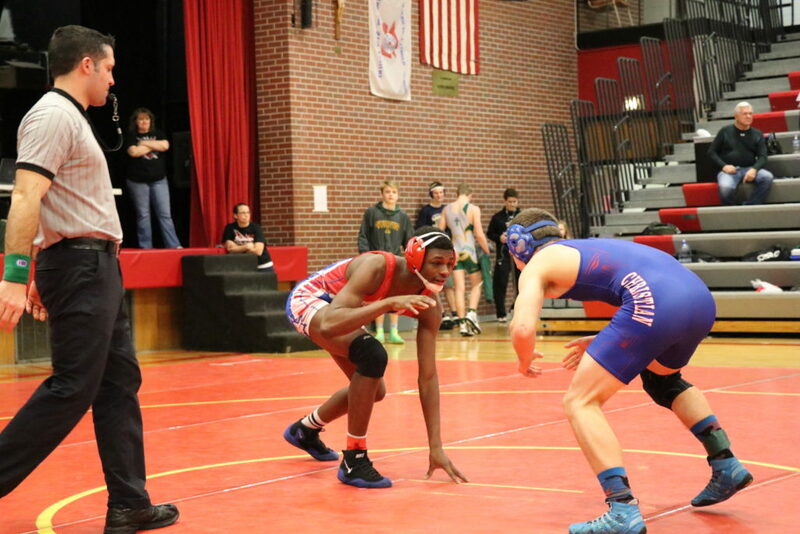 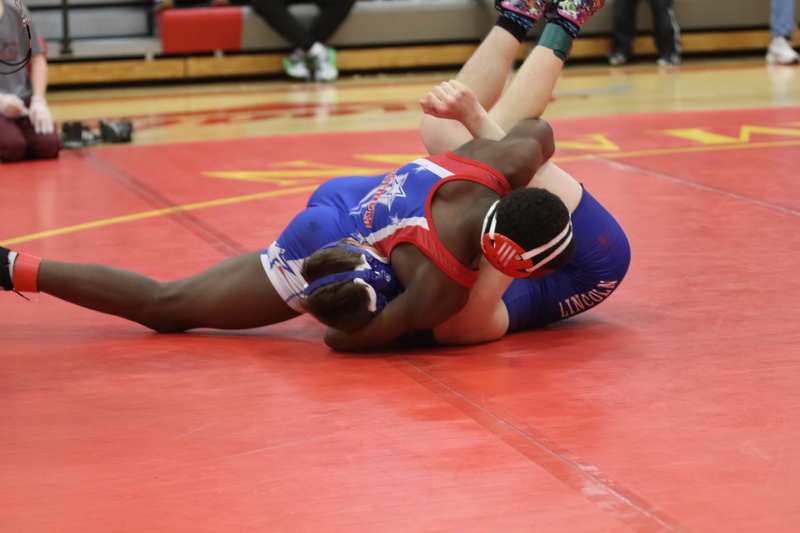 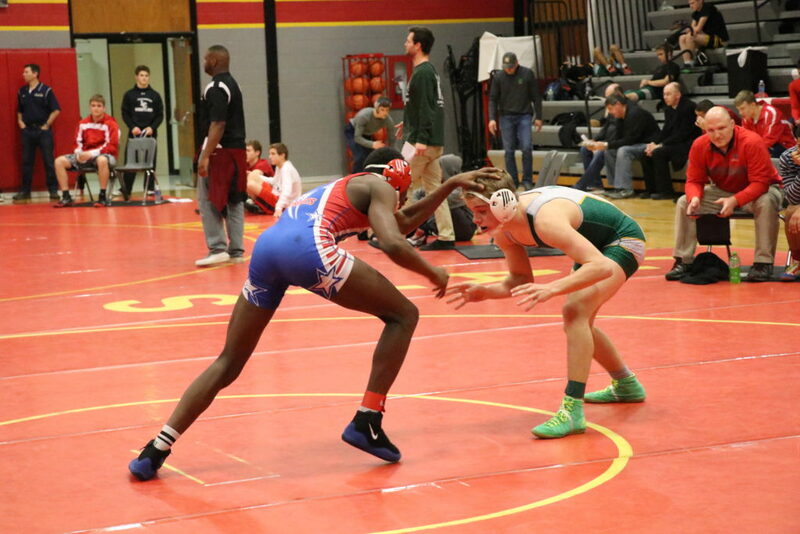 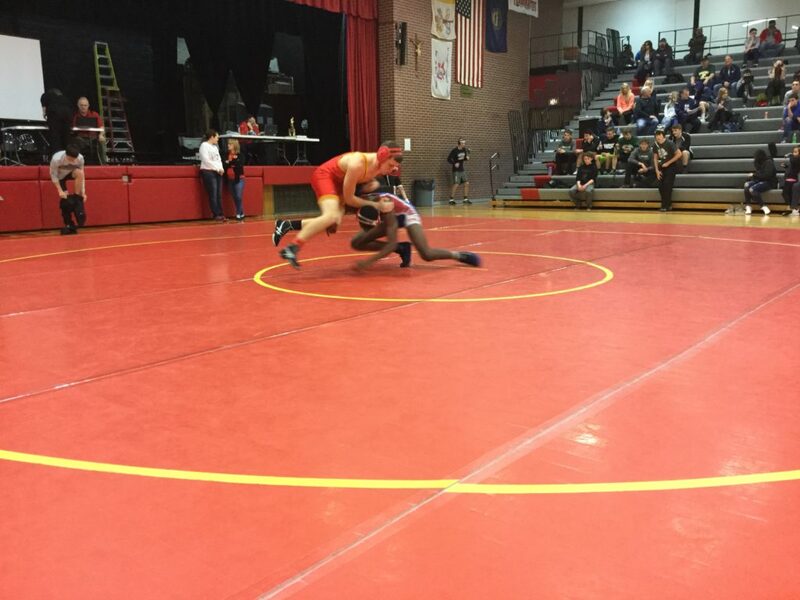 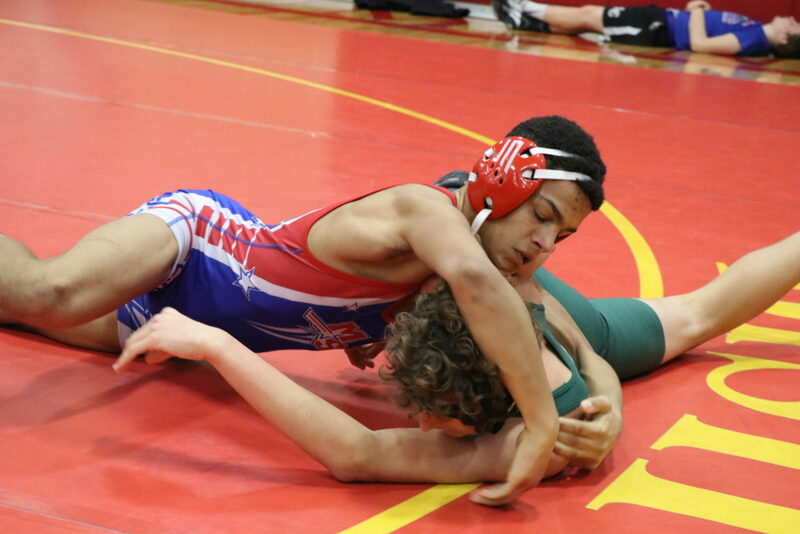 120 – Justin Jeanette (22-3) placed 1st and scored 20.00 team points. 120 – Jeremiah Sistek (32-17) placed 3rd. 126 – Garrett Mandolfo (19-12) placed 2nd and scored 16.00 team points. 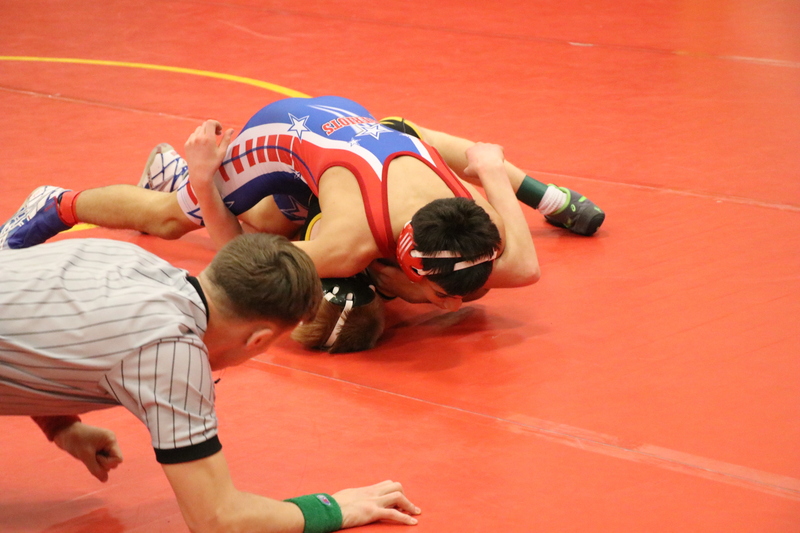 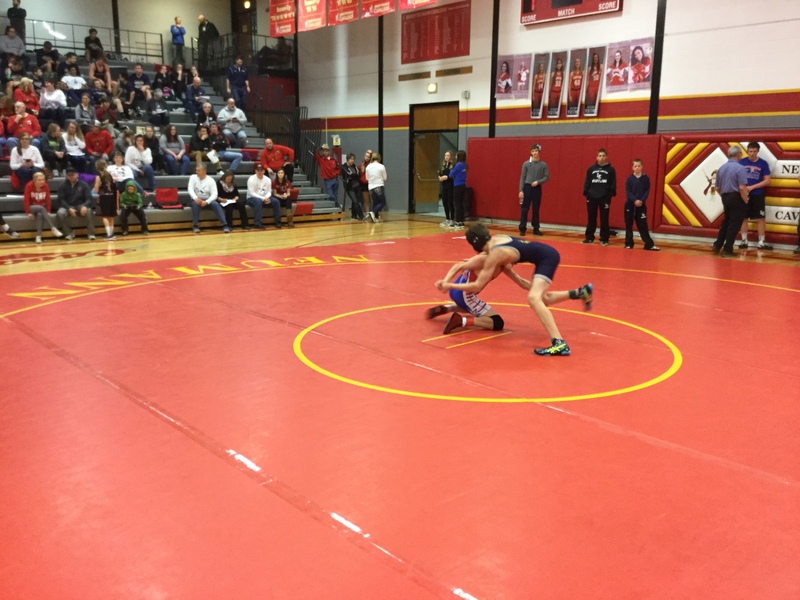 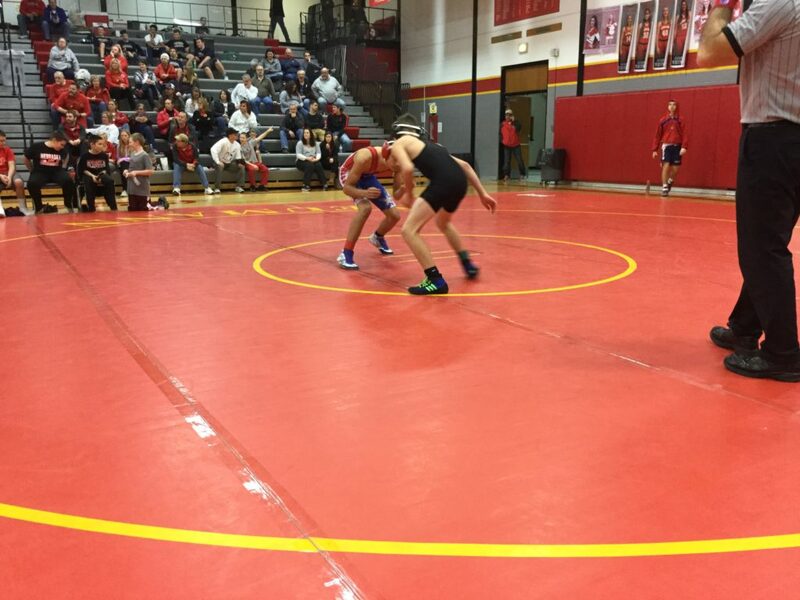 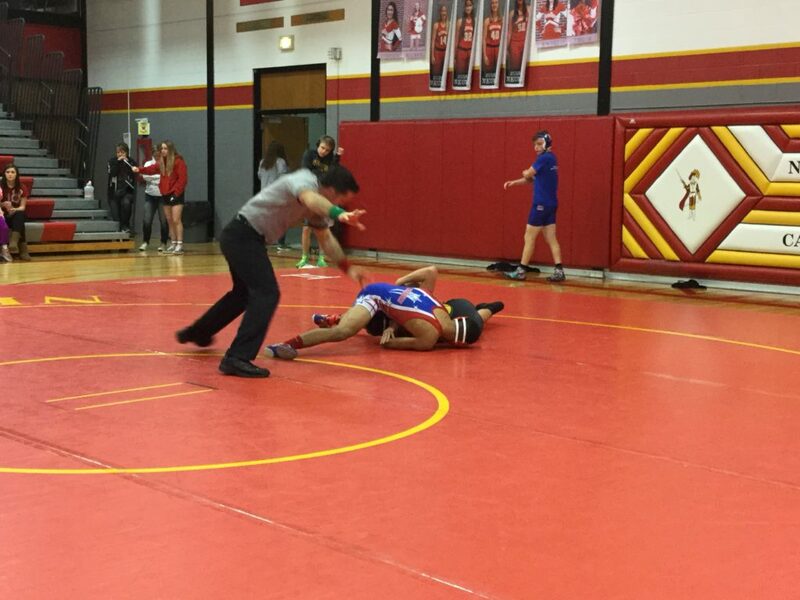 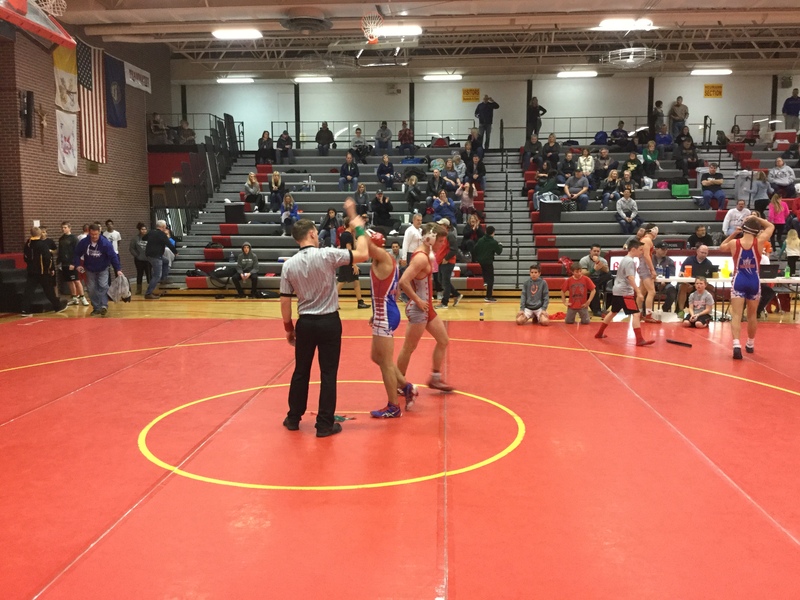 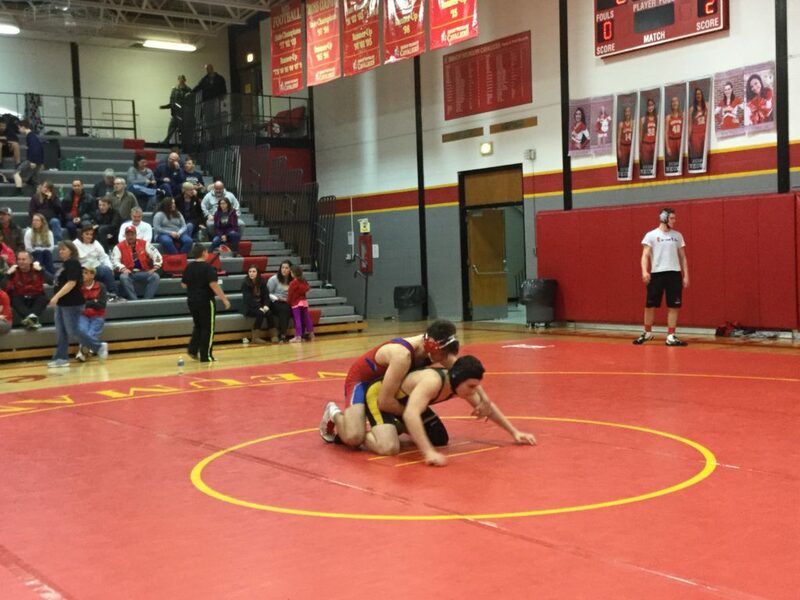 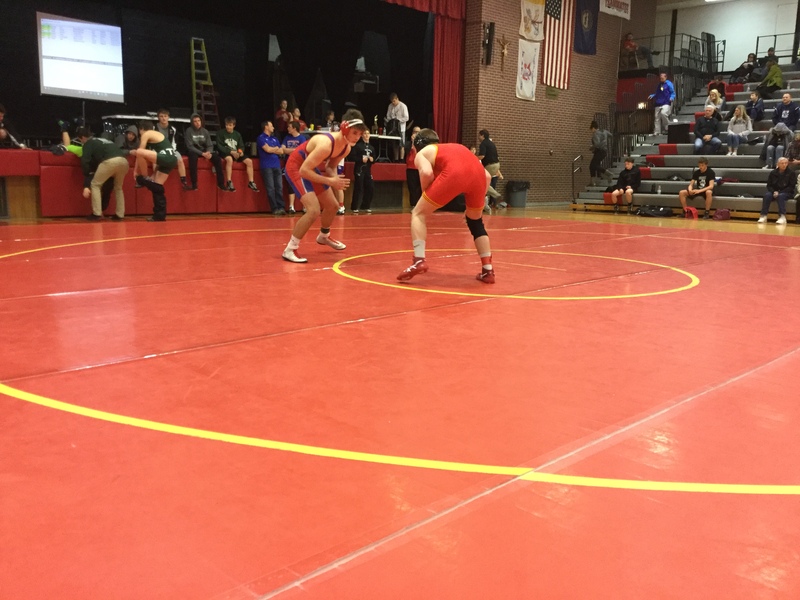 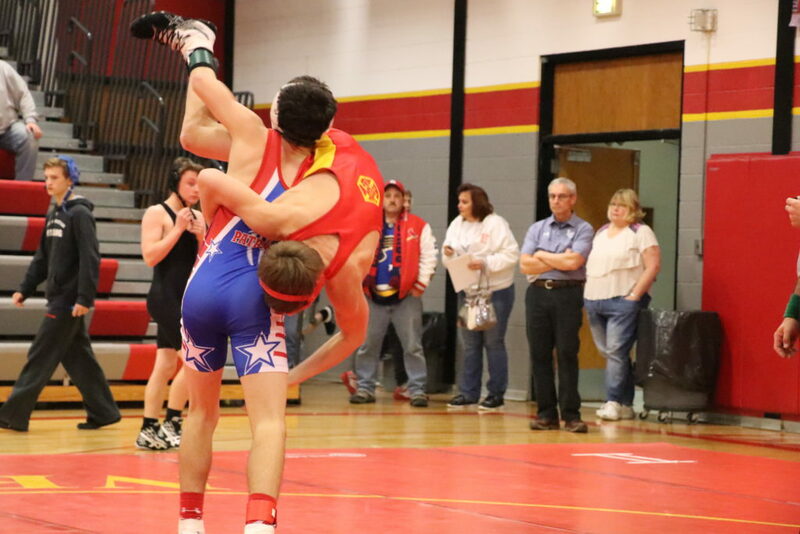 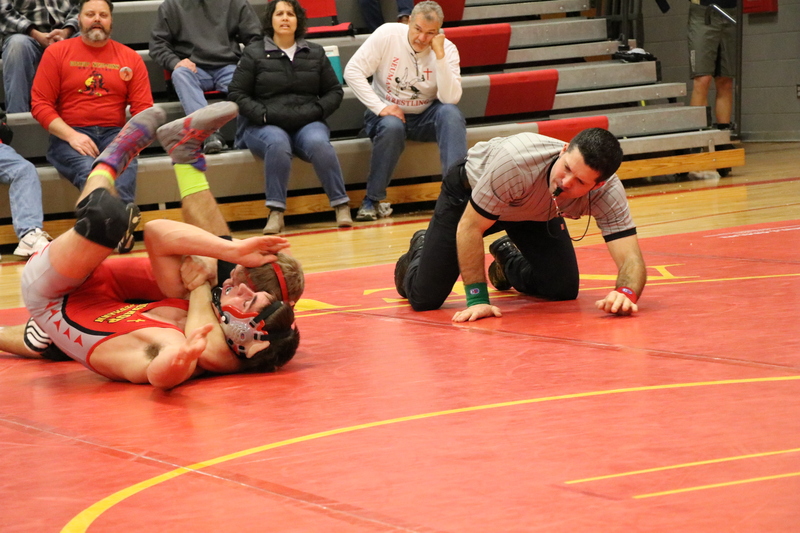 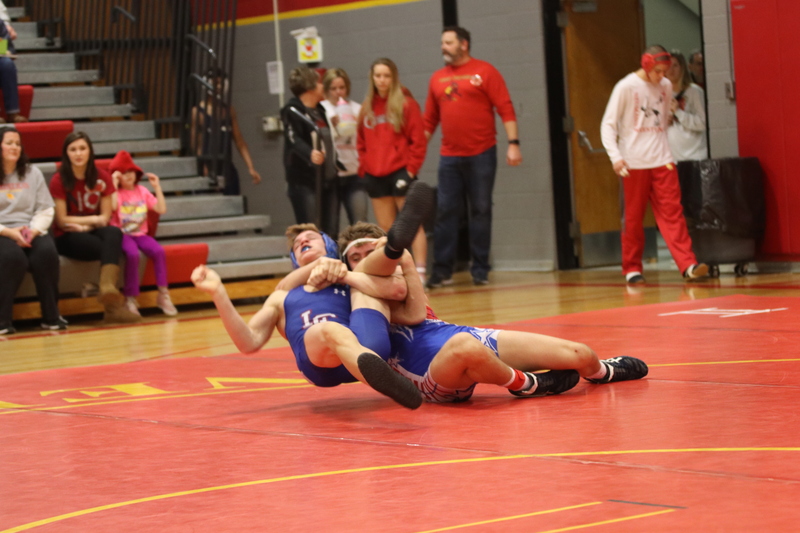 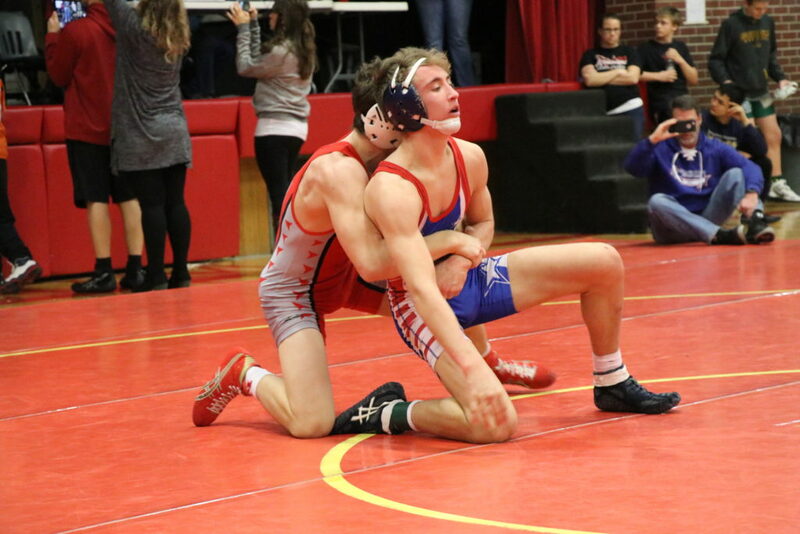 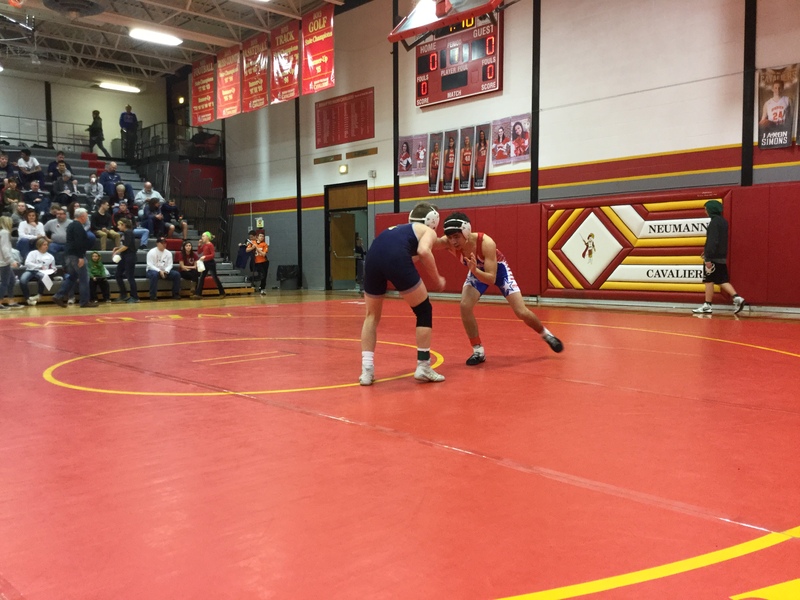 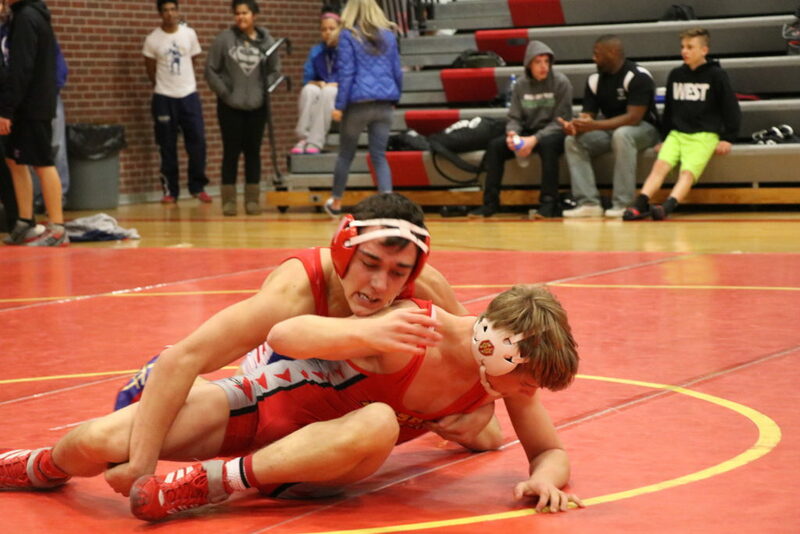 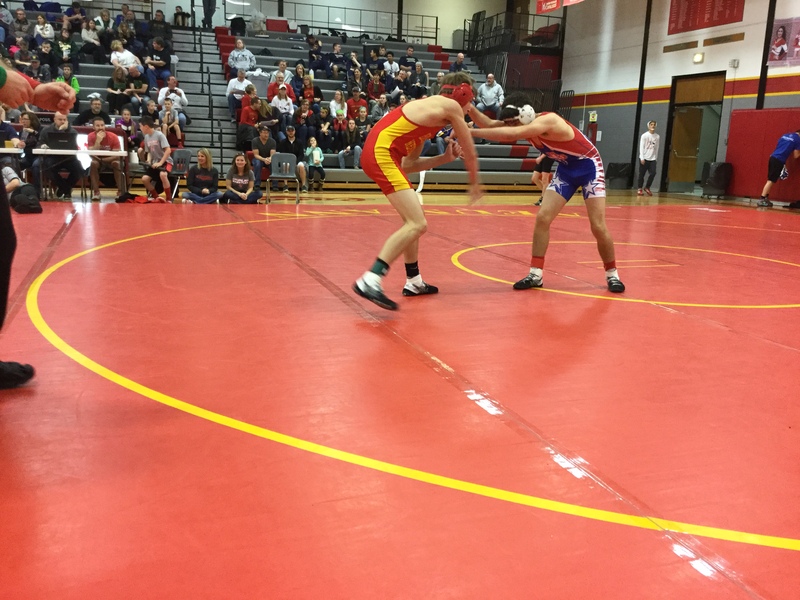 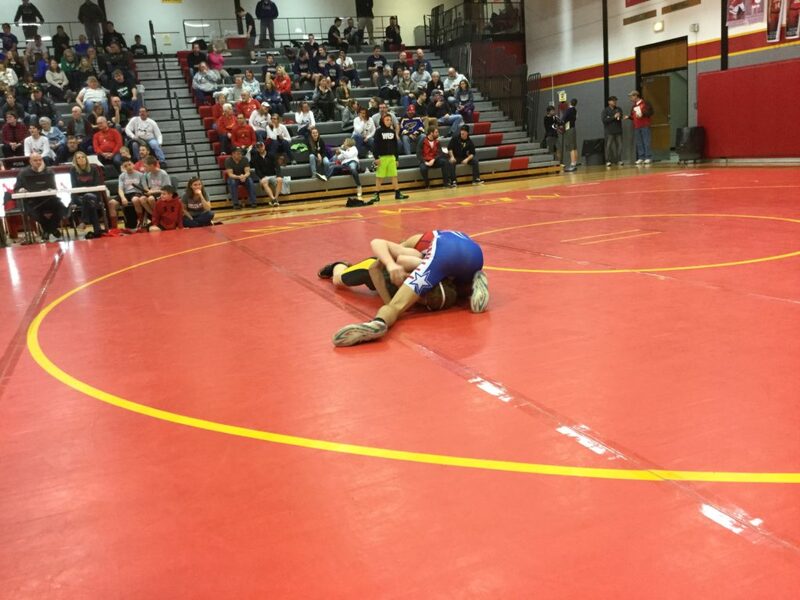 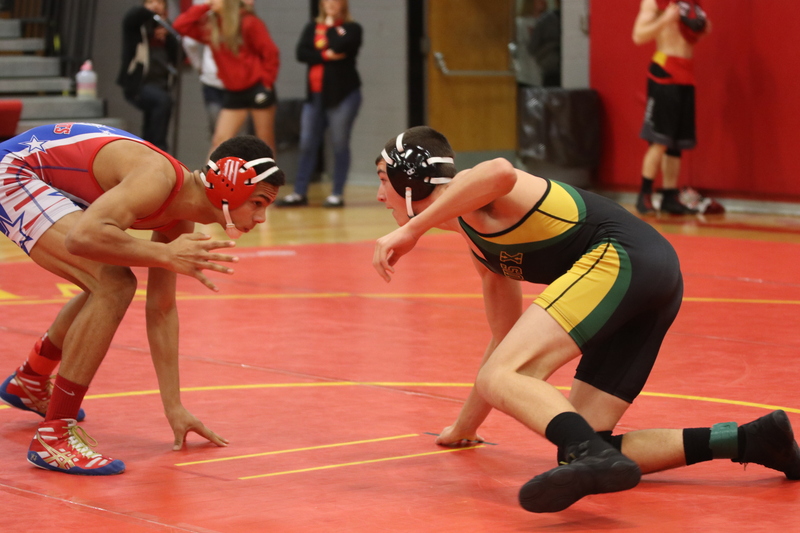 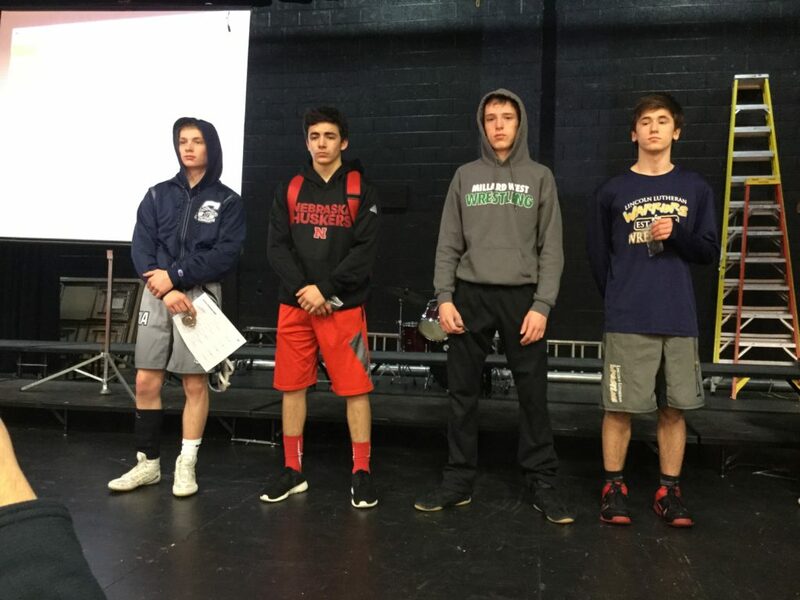 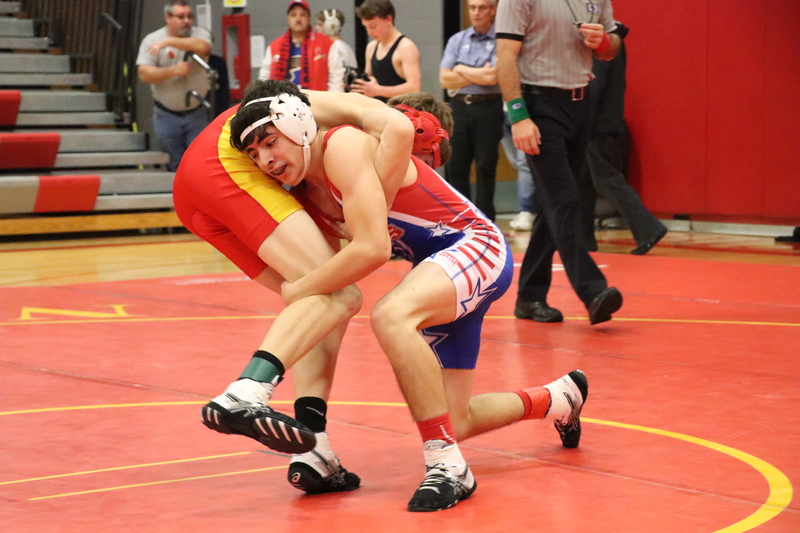 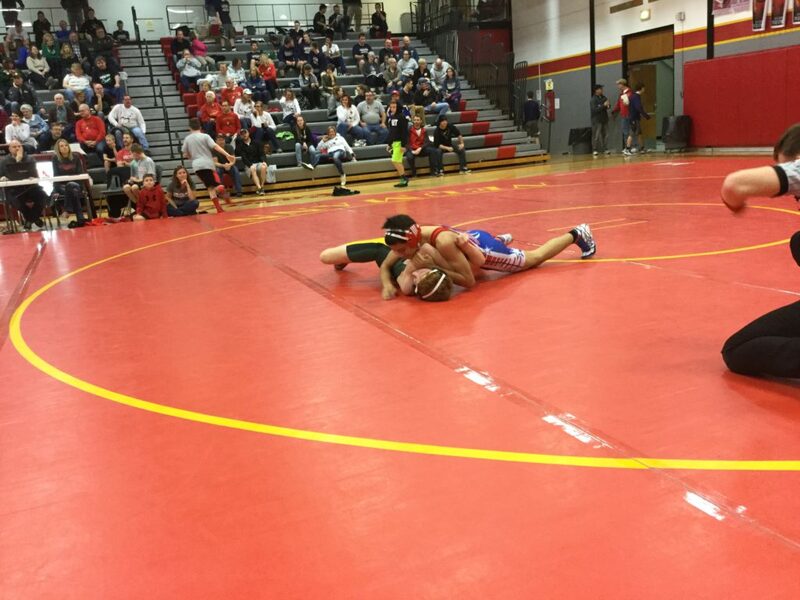 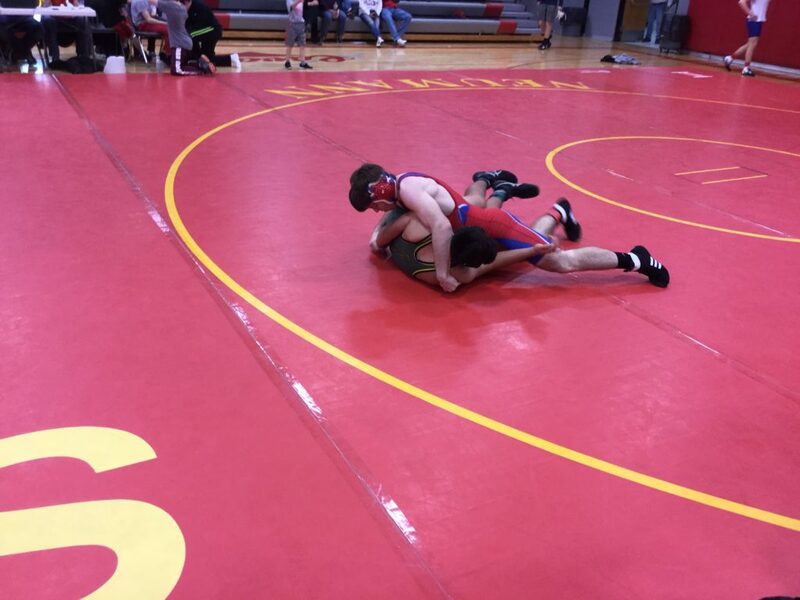 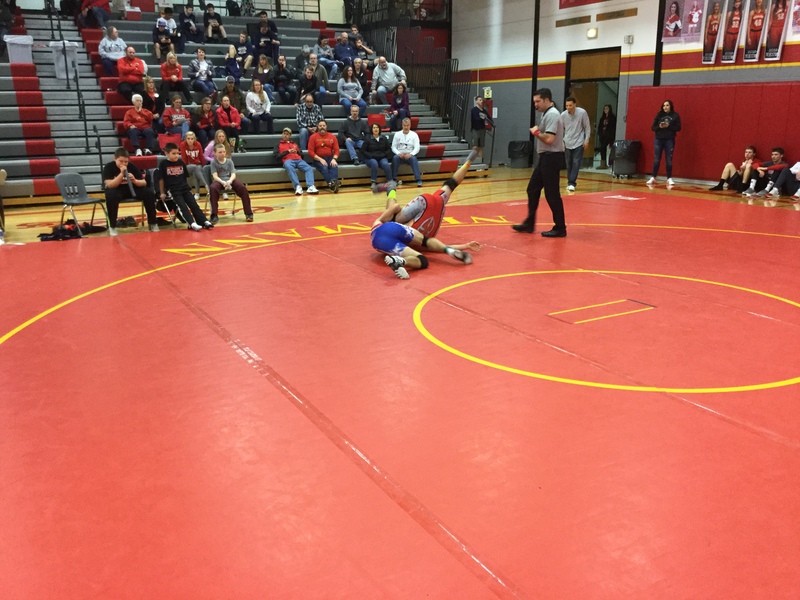 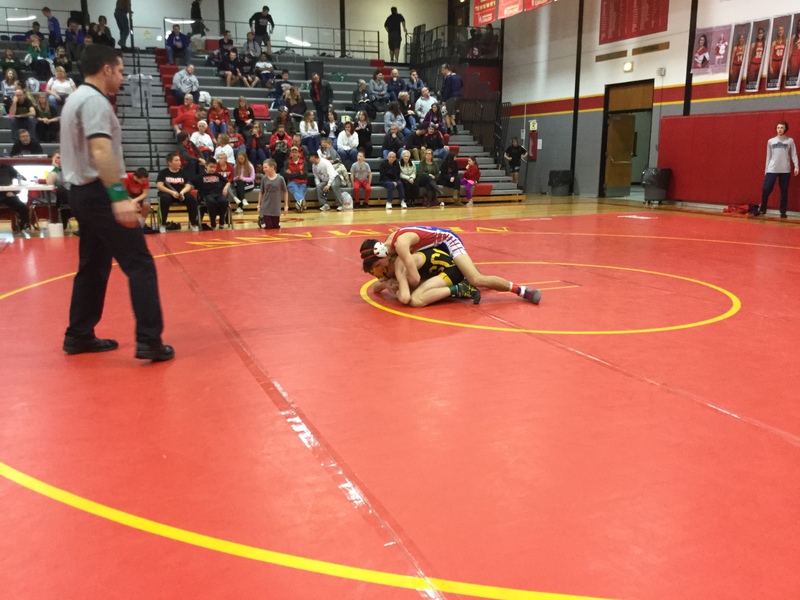 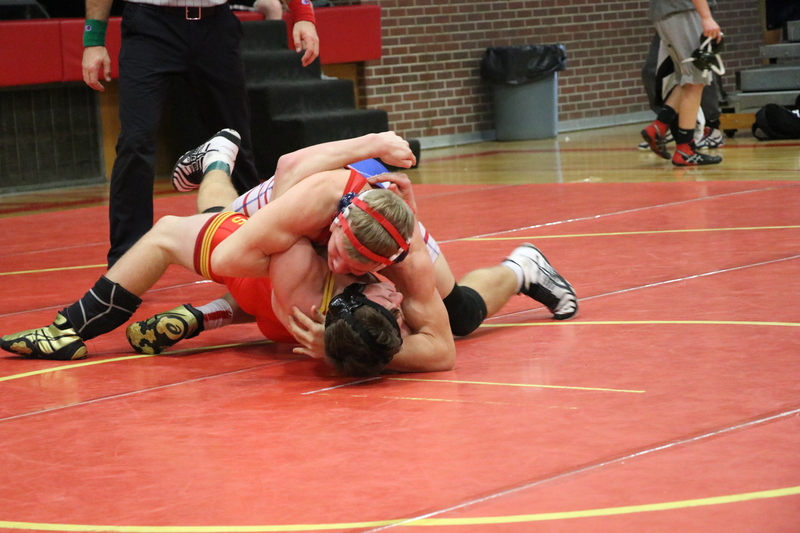 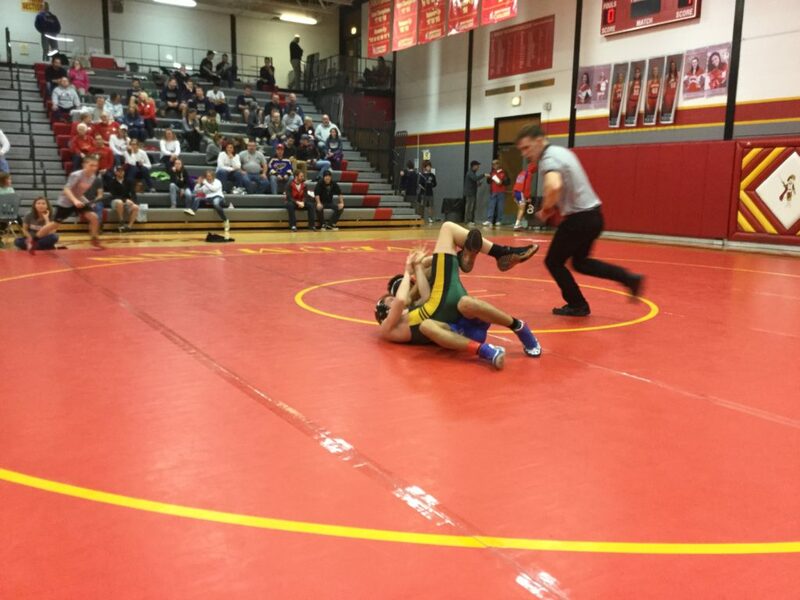 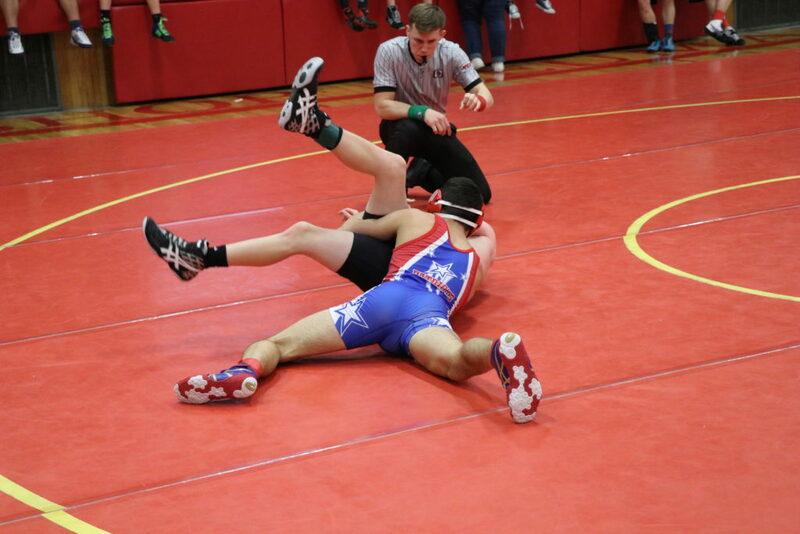 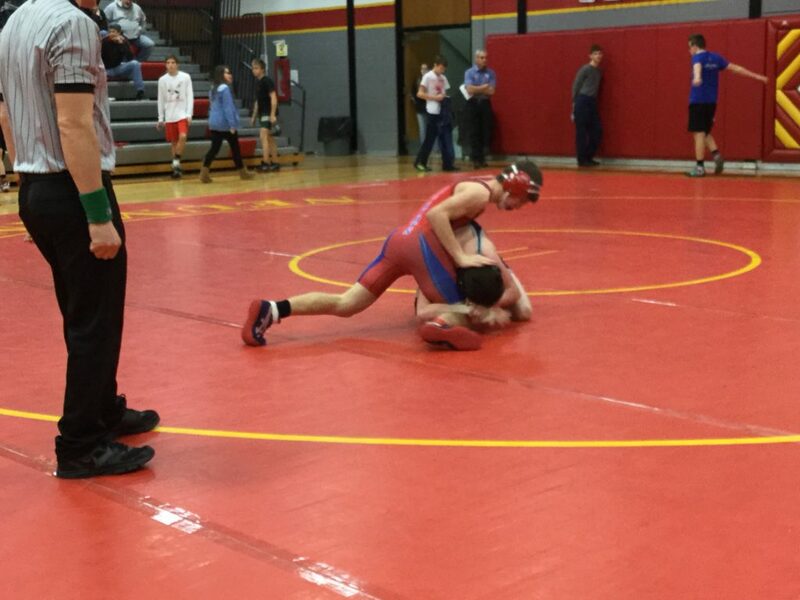 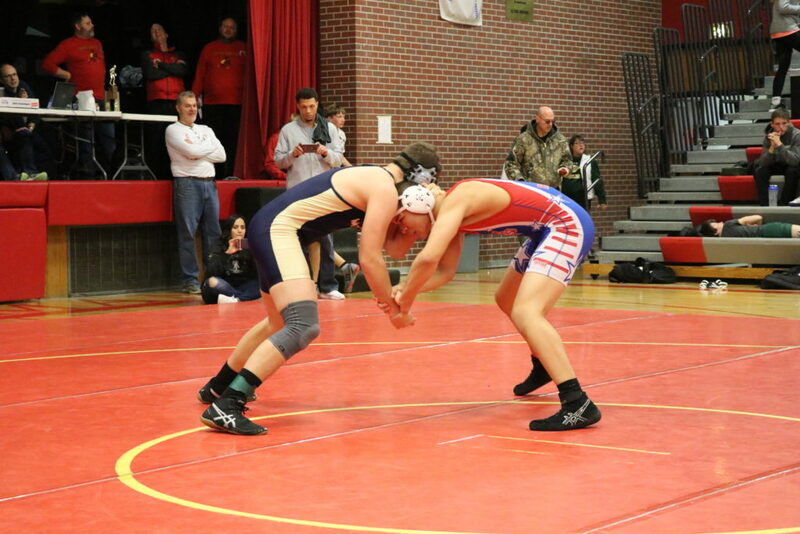 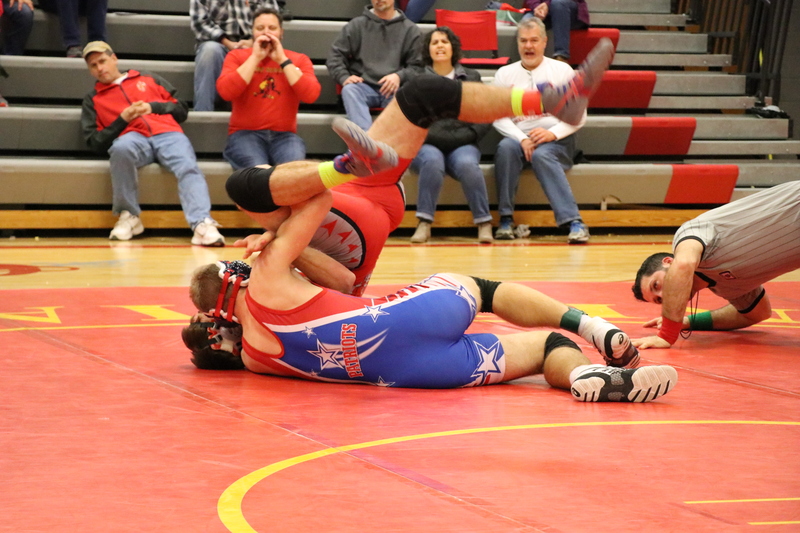 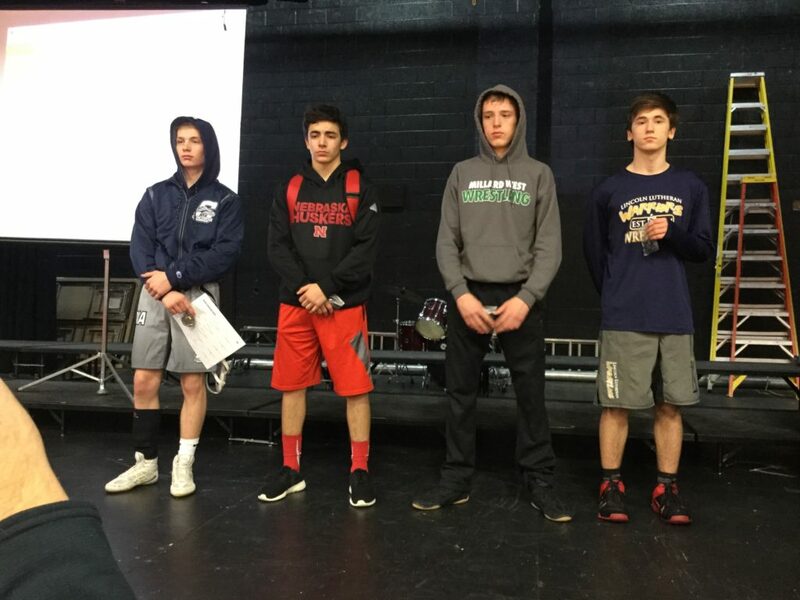 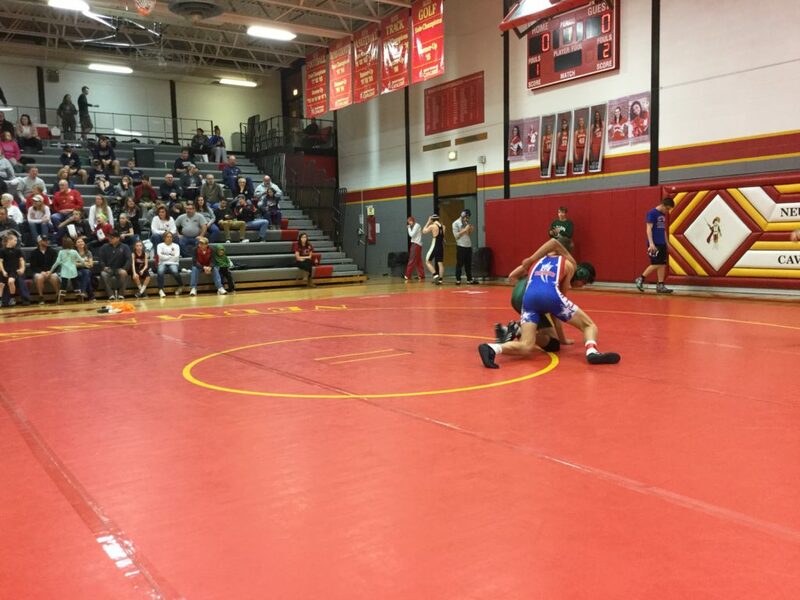 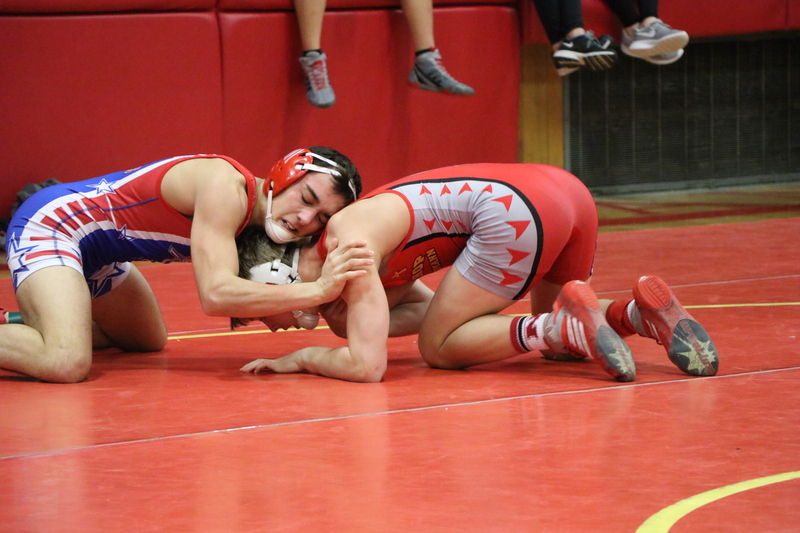 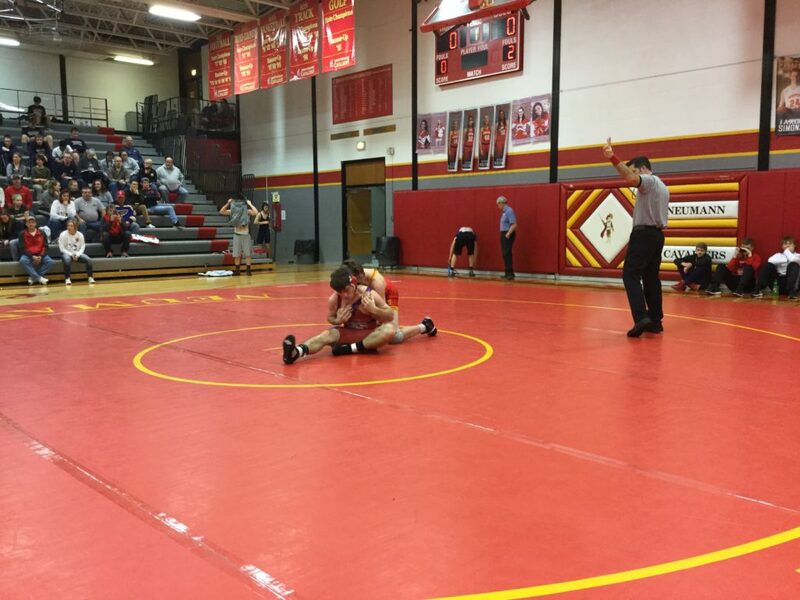 132 – Jace Caniglia (25-0) placed 1st and scored 20.00 team points. 138 – Garett Svoboda (24-3) placed 2nd and scored 15.00 team points. 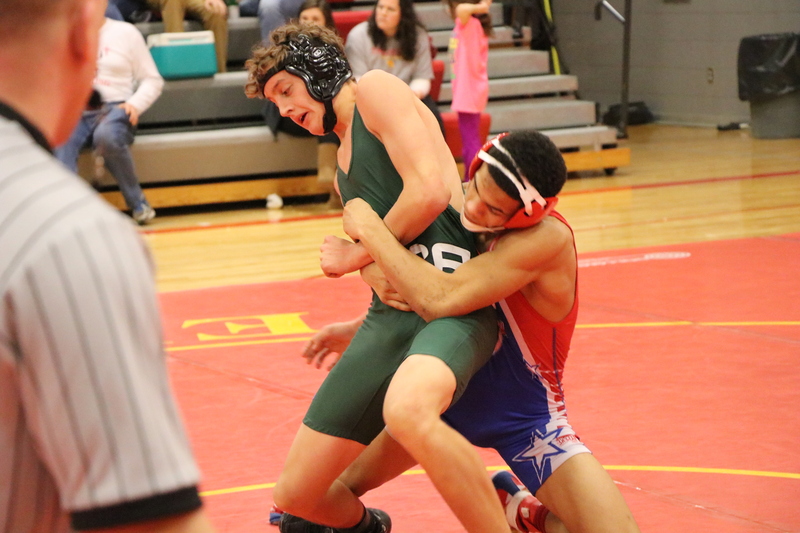 145 – Seth Rakes (13-12) placed 3rd and scored 34.00 team points. 152 – Alfonso Cunningham (32-6) placed 1st and scored 23.50 team points. 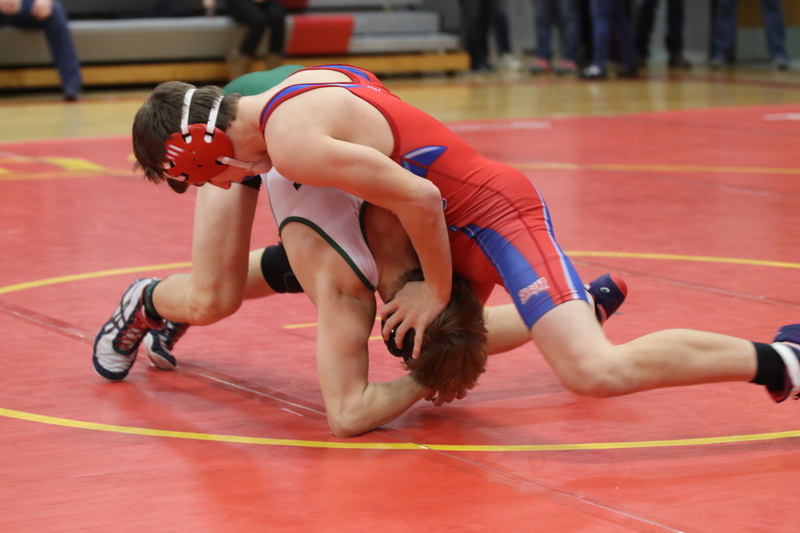 160 – Chris Wortman (18-12) placed 3rd and scored 9.00 team points. 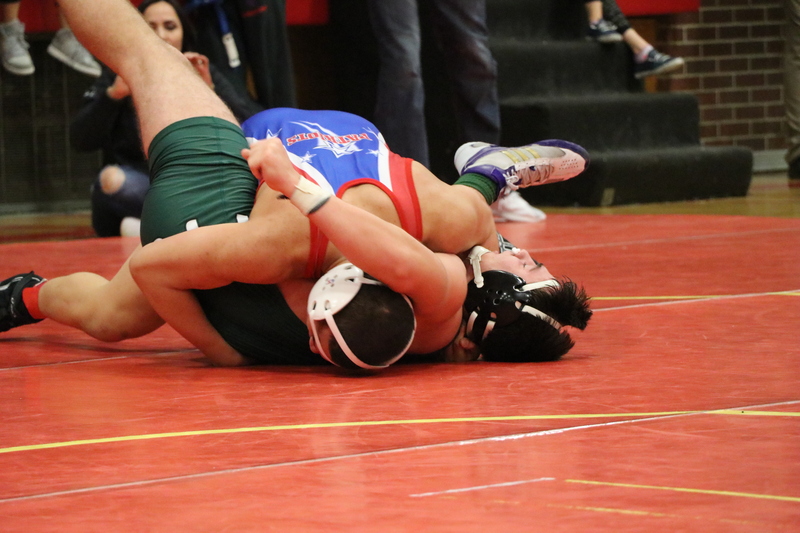 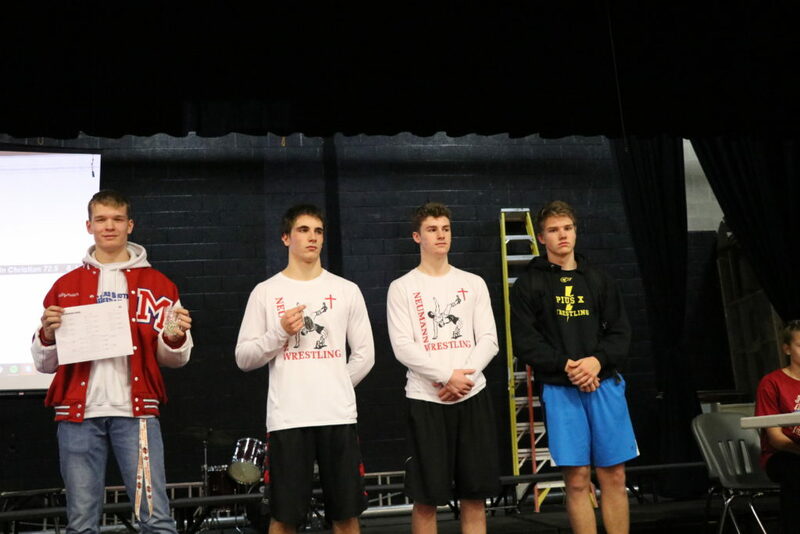 170 – Garrett Grossman (2-2) placed 5th and scored 4.00 team points. 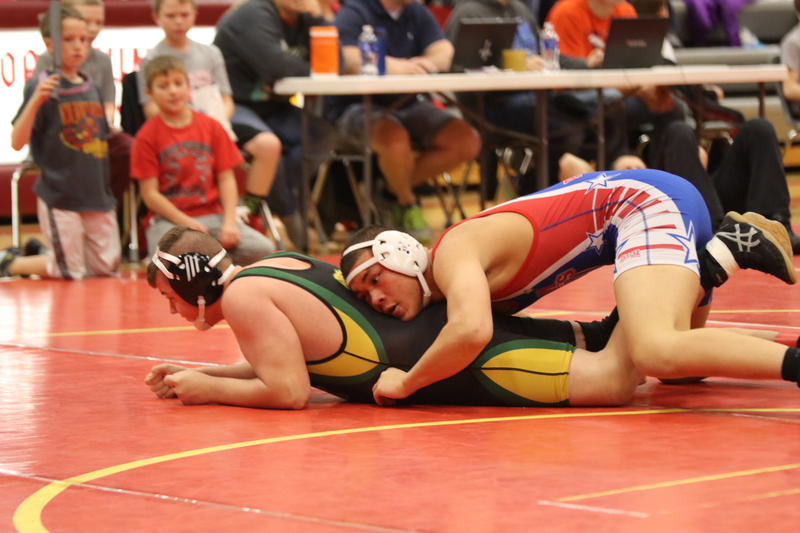 182 – Gavin Peitzmeier (29-11) placed 1st and scored 23.00 team points. 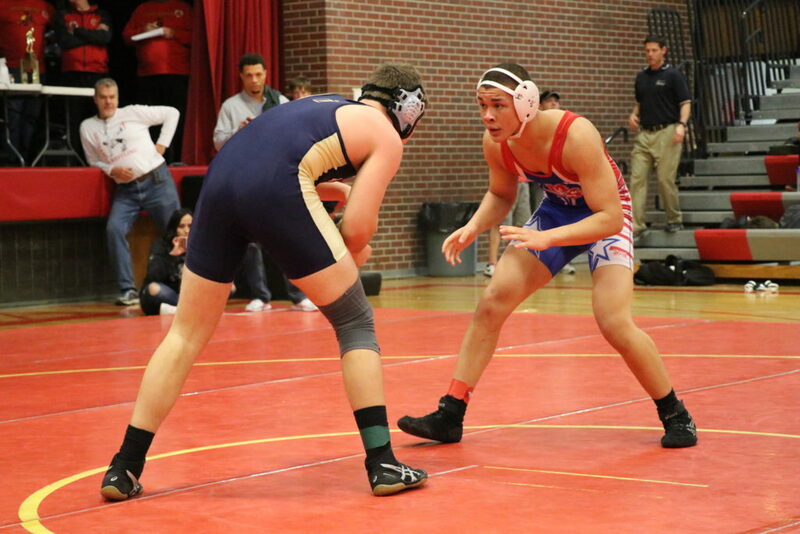 195 – Krew Tran (29-9) placed 2nd and scored 14.00 team points.